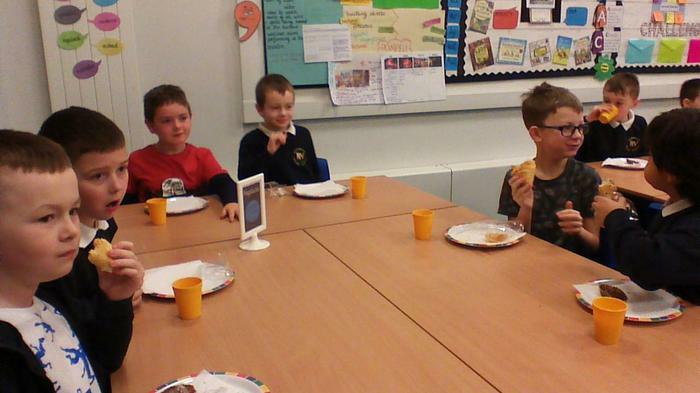 3A had a very special visit from the Iron Man this term. 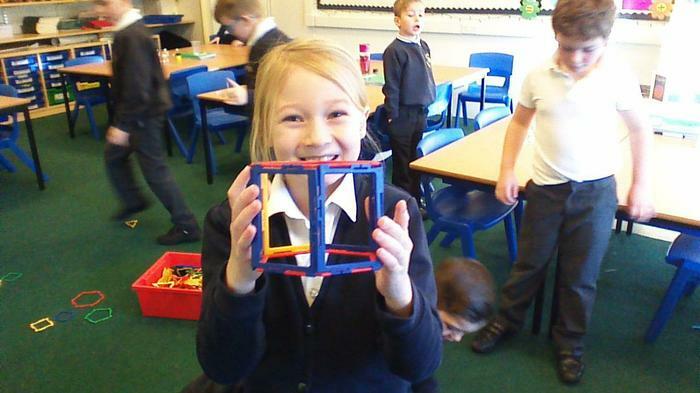 After reading the novel ‘The Iron Man’ by Ted Hughes, Evie Swift created this fantastic 3D model based on the character’s description from the story. 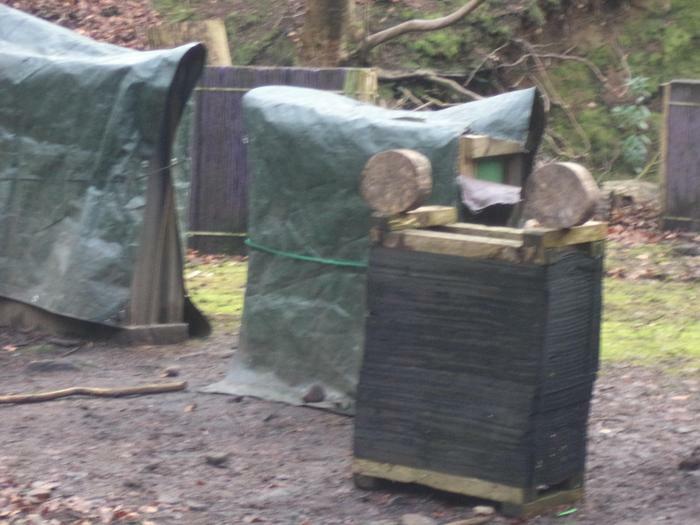 You can see the Iron Man’s great iron head shaped like a dustbin and his eyes which glow like headlamps. 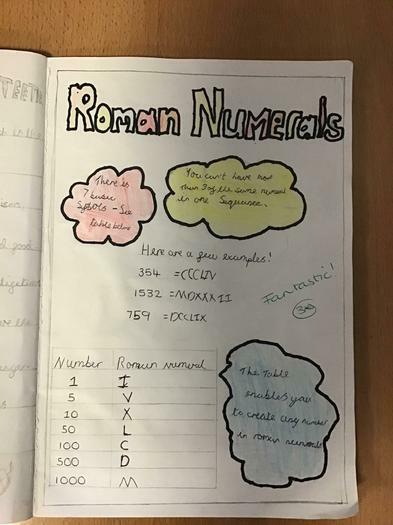 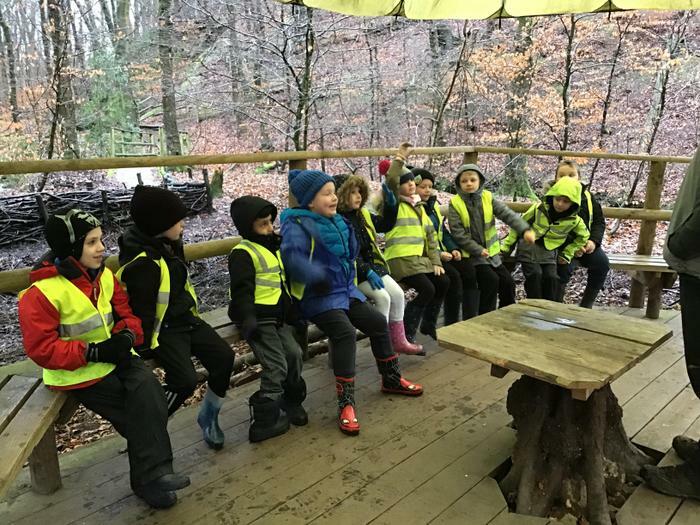 We were all very impressed! 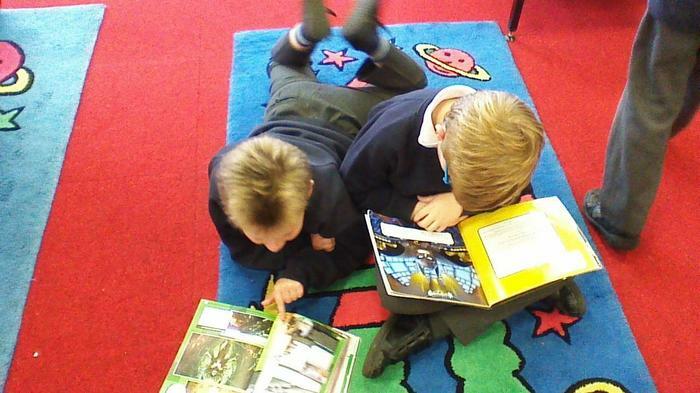 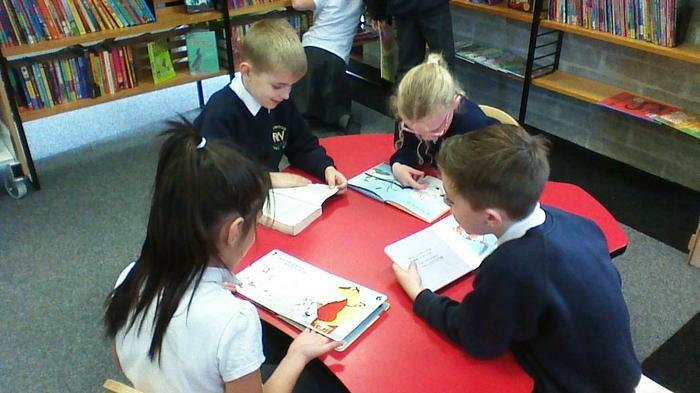 Year 3 are busy with an exciting and creative DT project linked to children’s books. 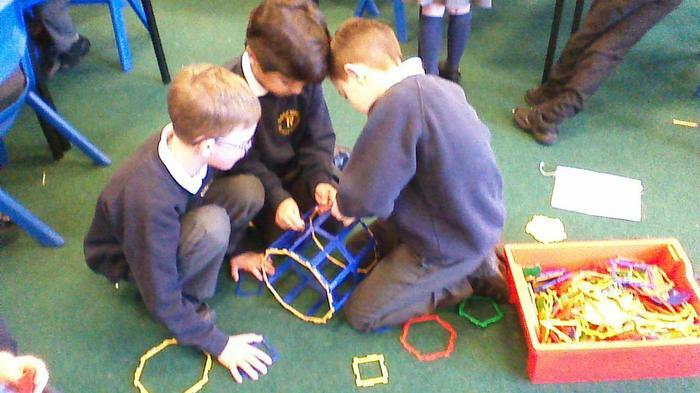 Keep a look out for more pictures to find out what we’re making. 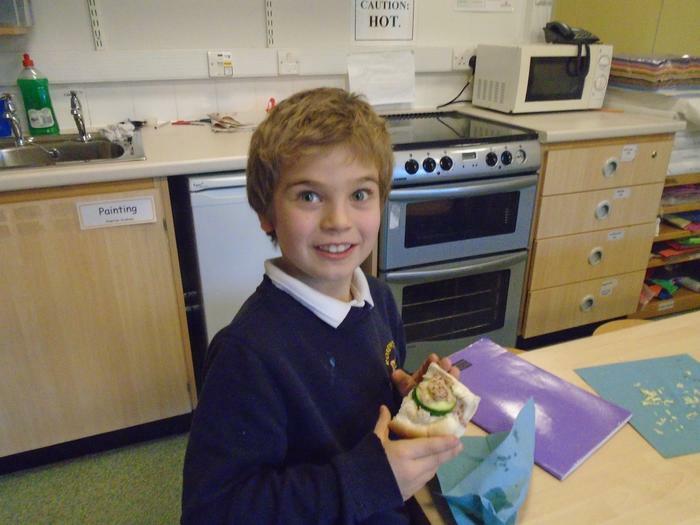 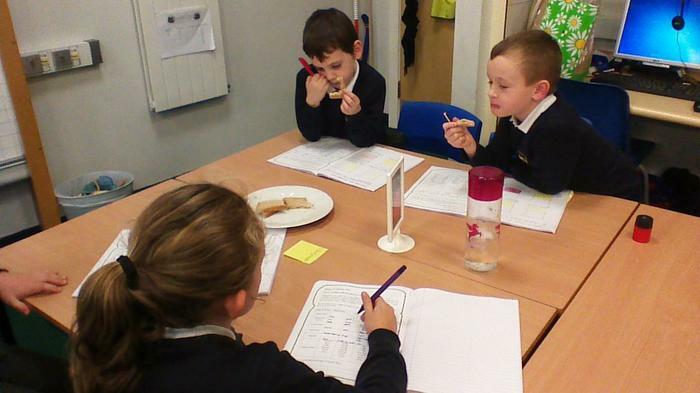 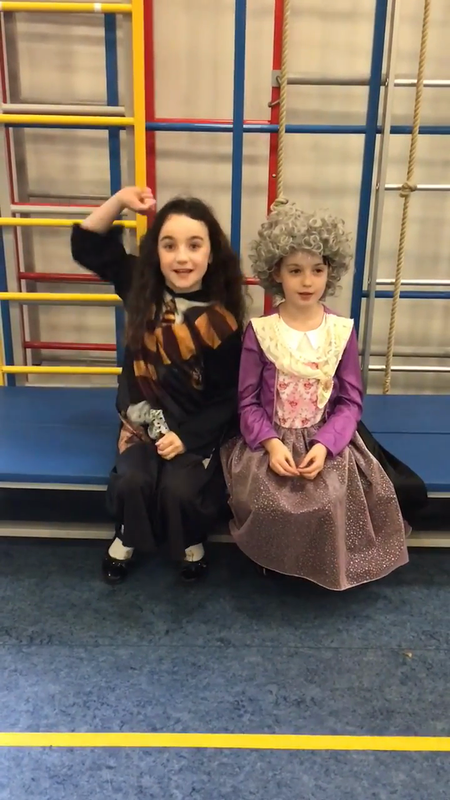 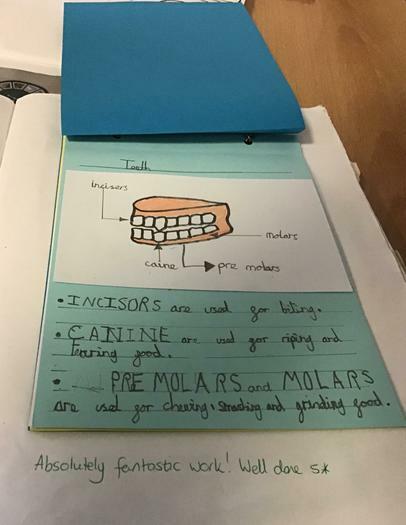 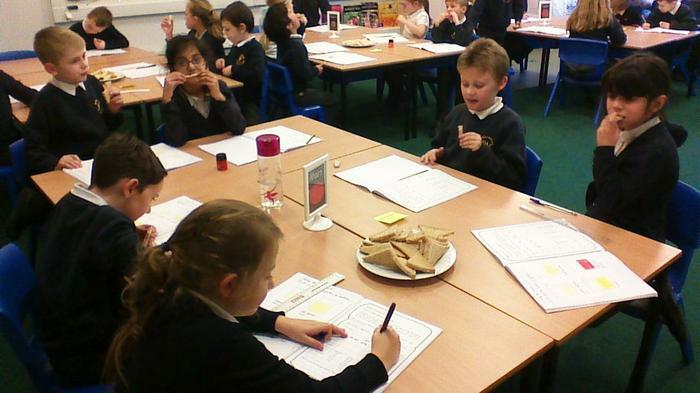 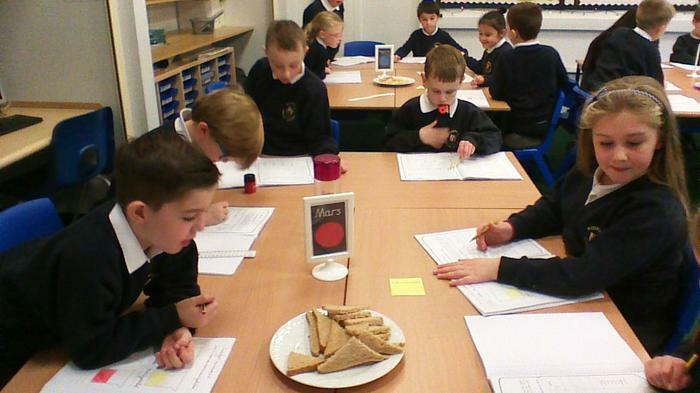 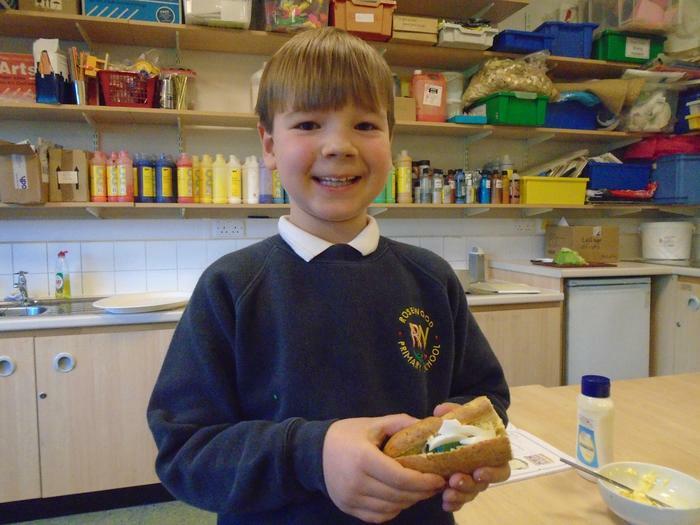 During World Book Day, two of our year 4 children collaborated to write their very own poem about school dinners! 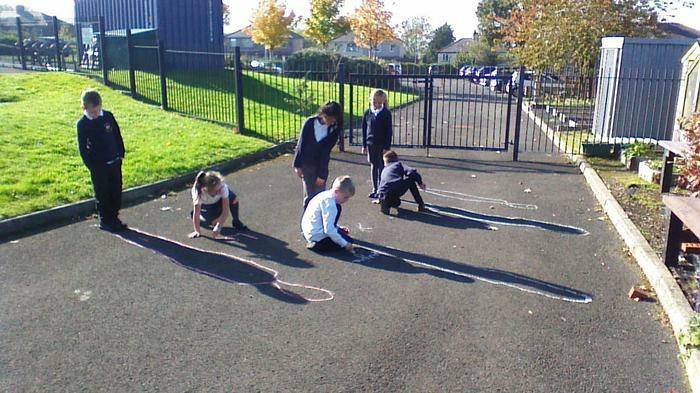 Exploring food chains outside in year 4! 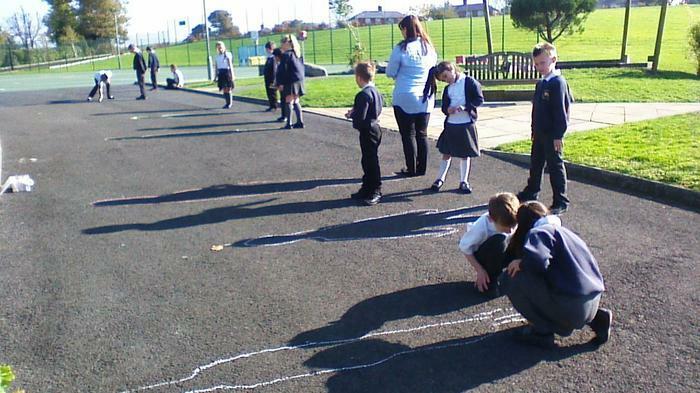 We arrived in school to an unusually sunny February morning so we took our learning outside. 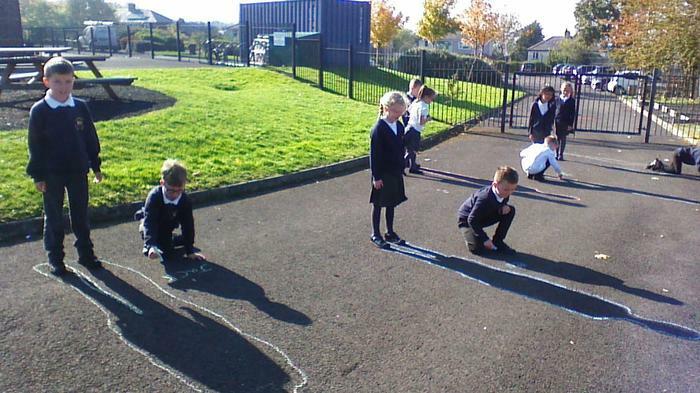 We enjoyed finding as many right angles as possible on the playground using right angle finders. 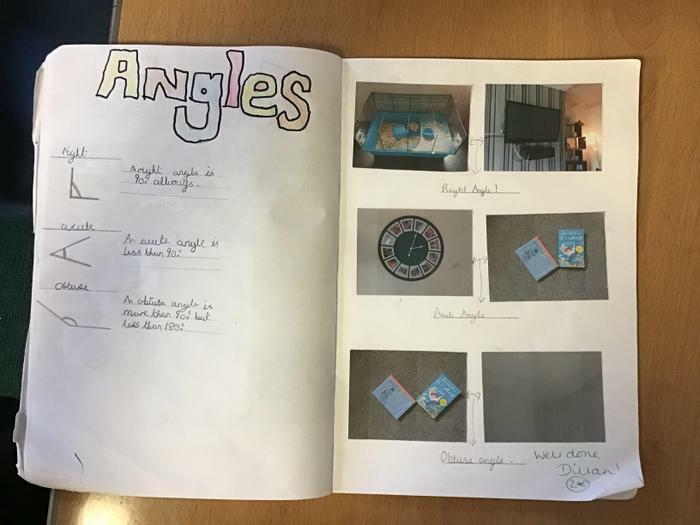 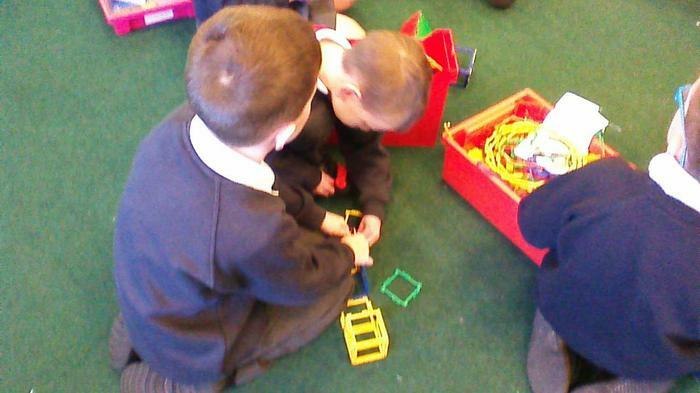 We checked to make sure each right angle measured 90 degrees. 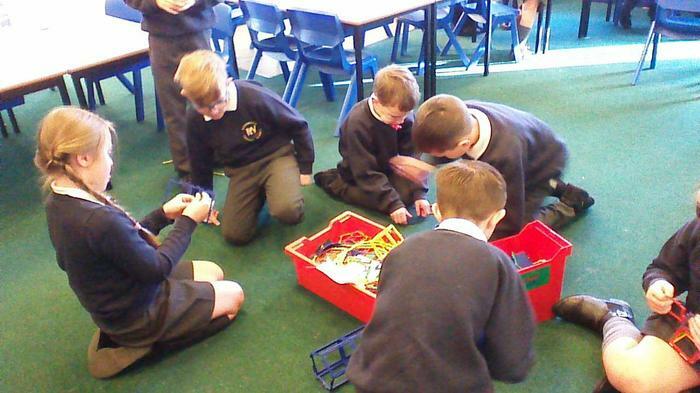 In year 4, we are learning about food chains. 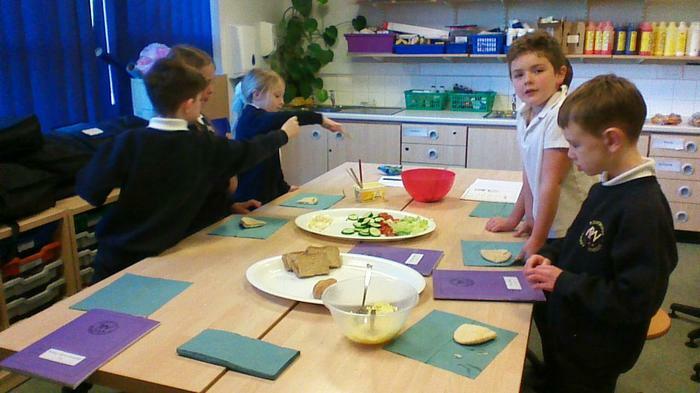 We created our own art which showed various food chains. 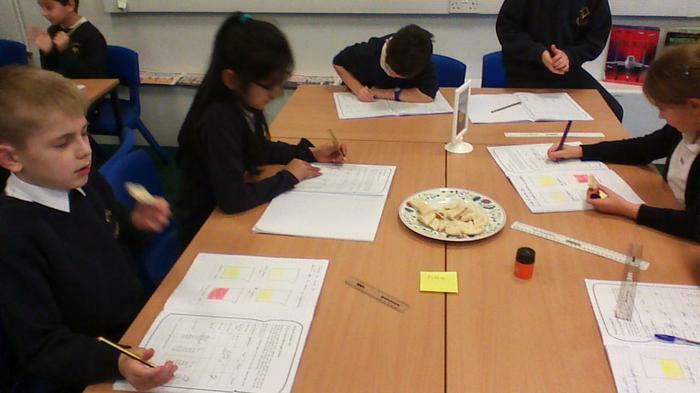 We had to think about the diet of the animal and their habitats. 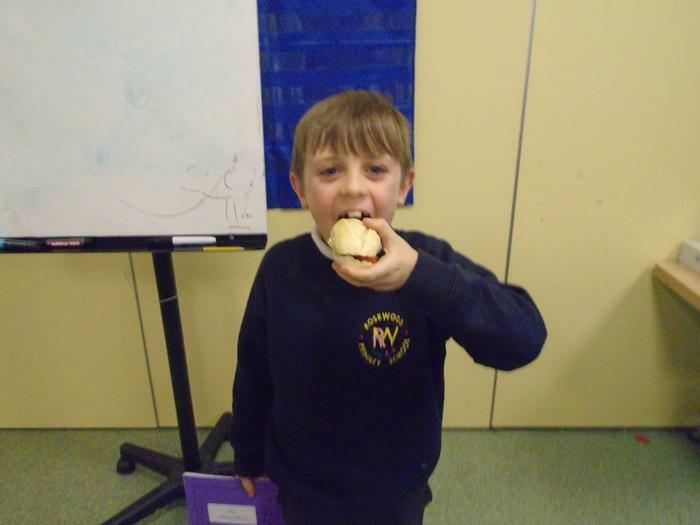 We also noticed that herbivores, carnivores and omnivores all had different types of teeth. 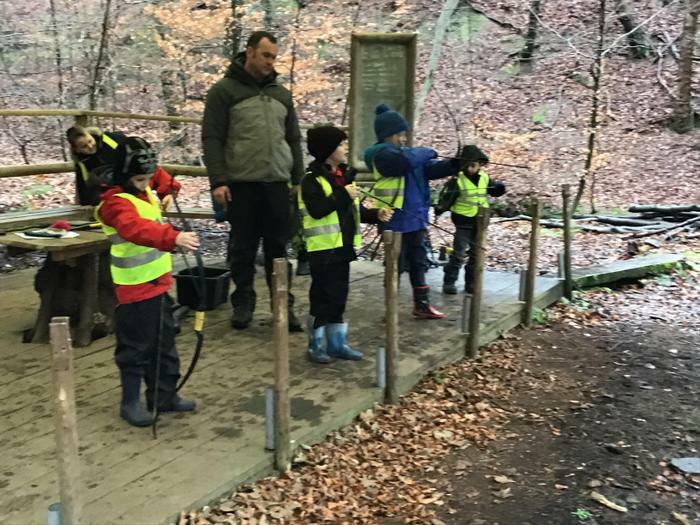 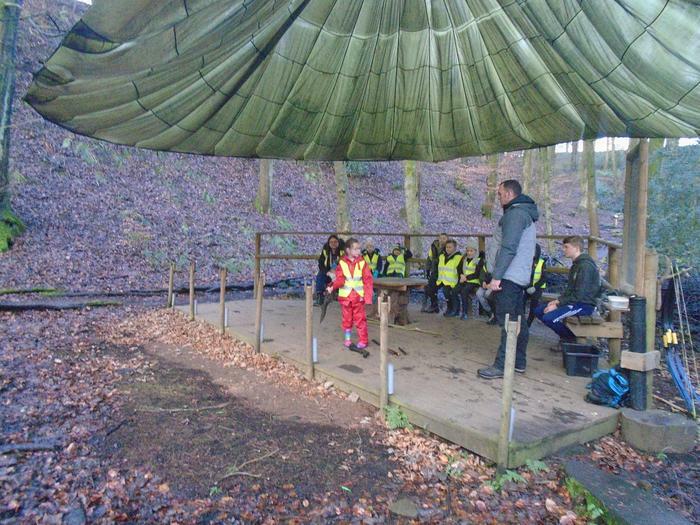 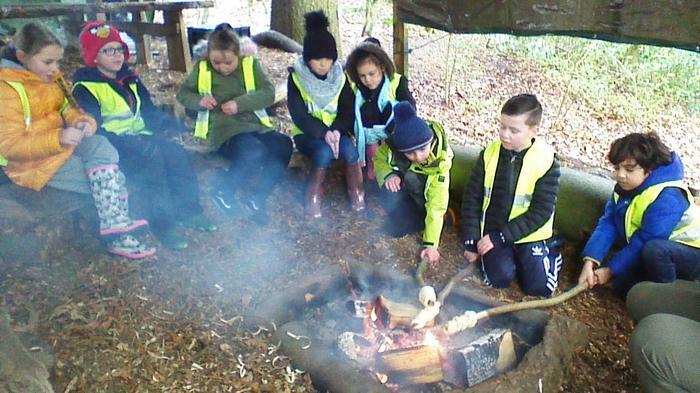 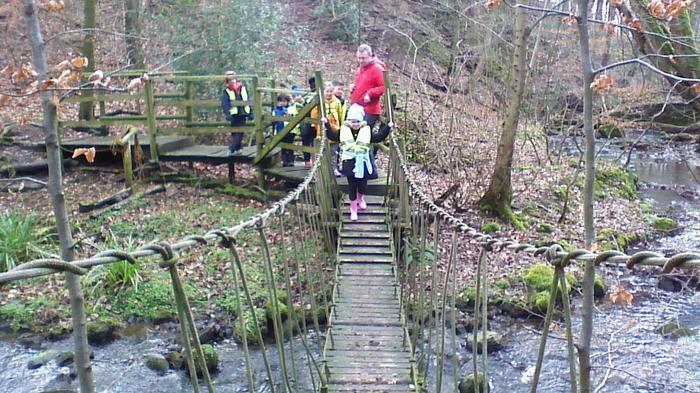 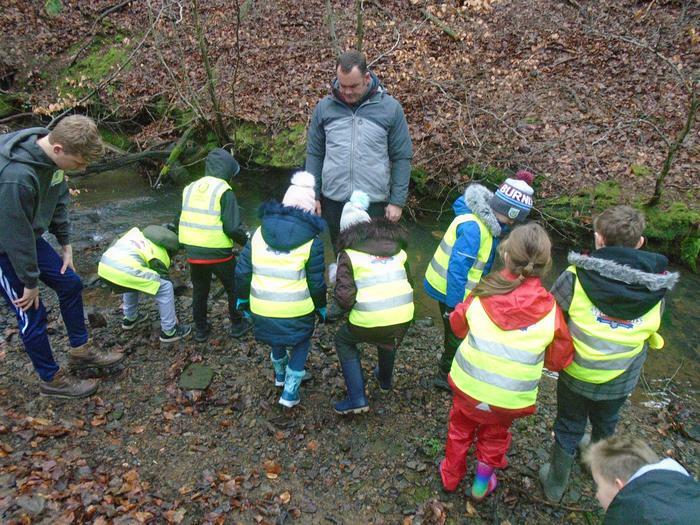 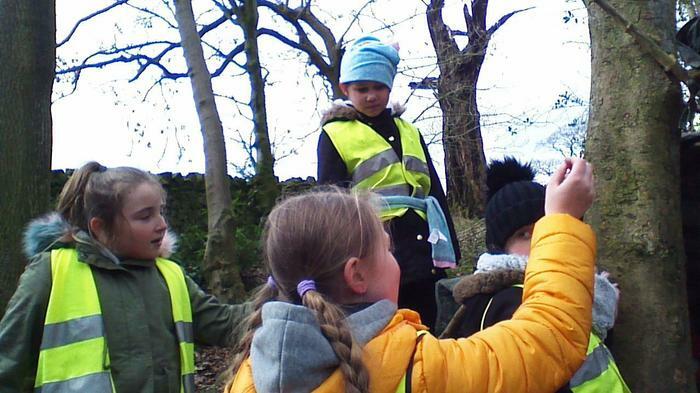 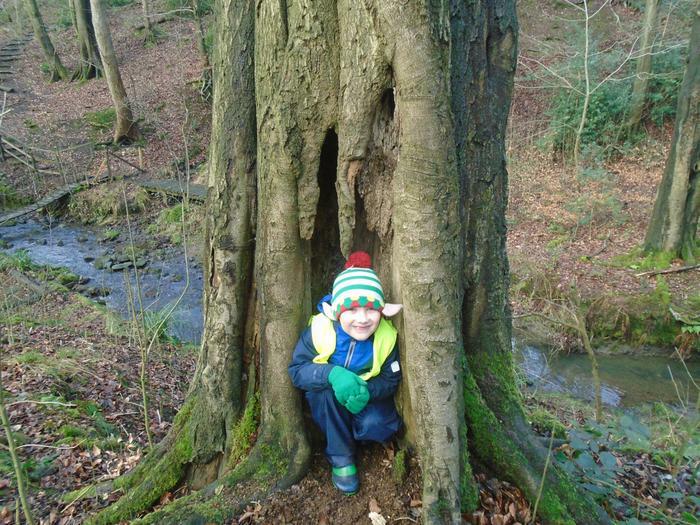 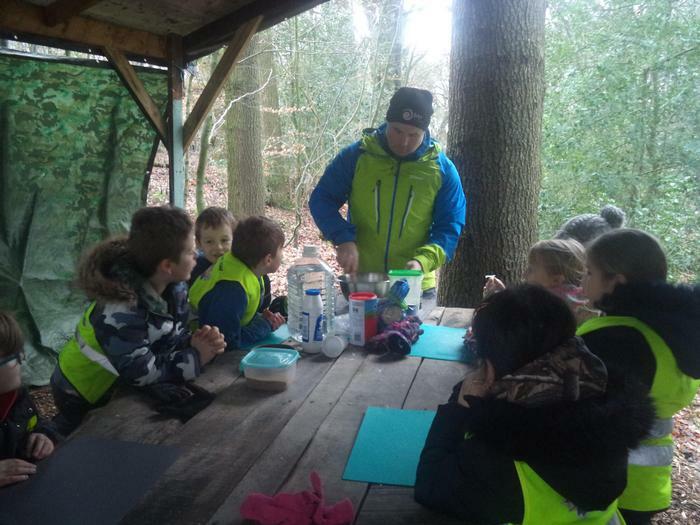 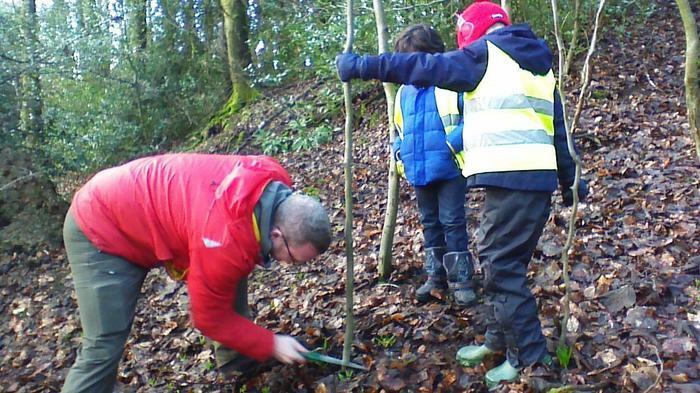 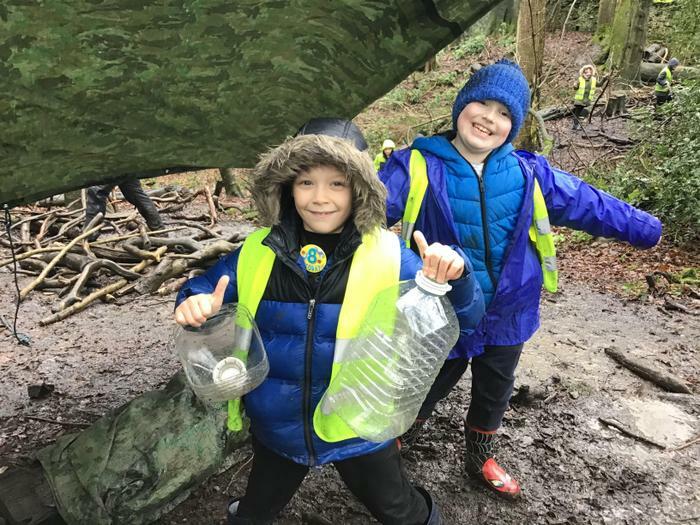 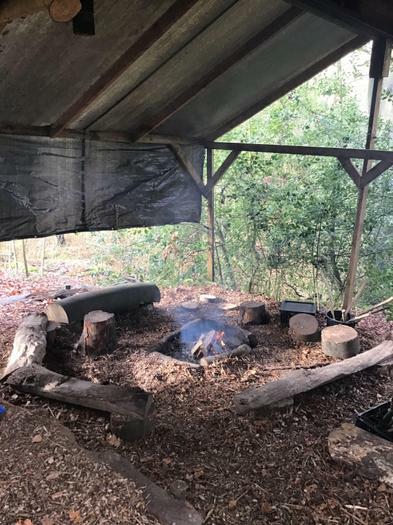 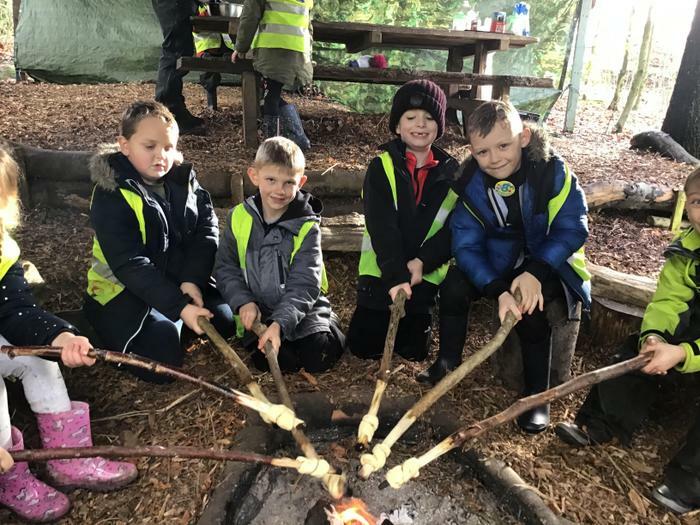 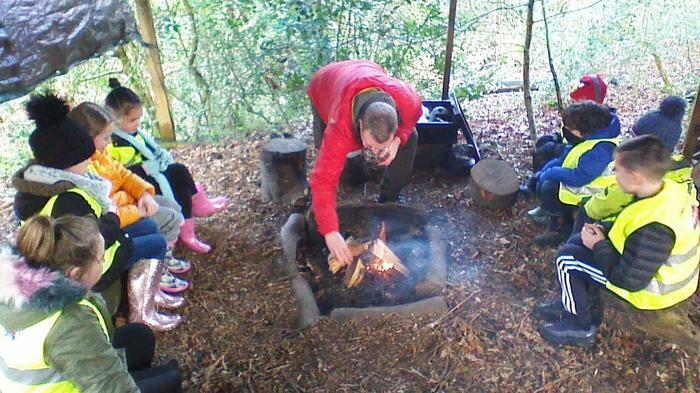 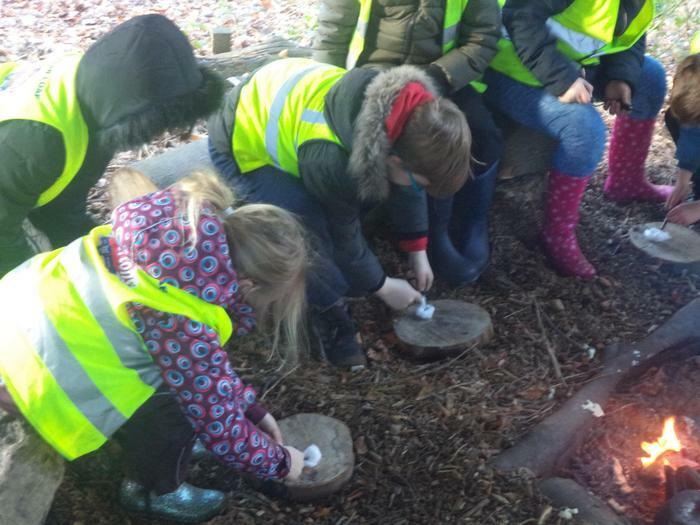 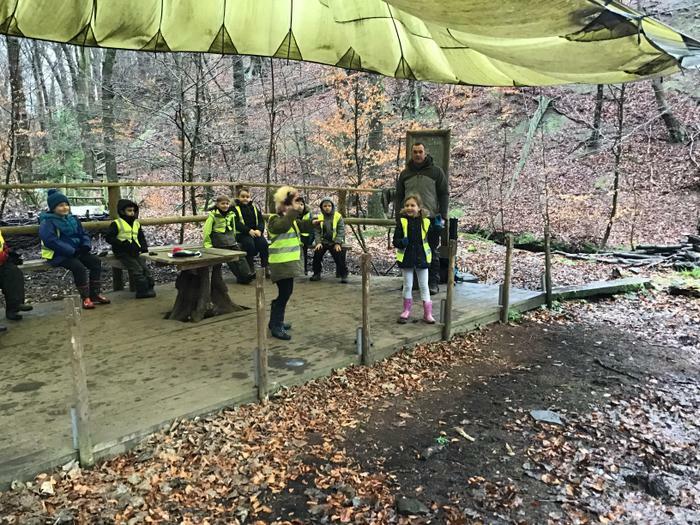 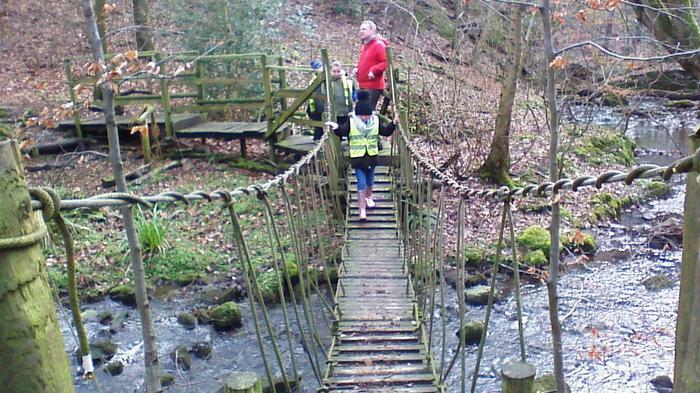 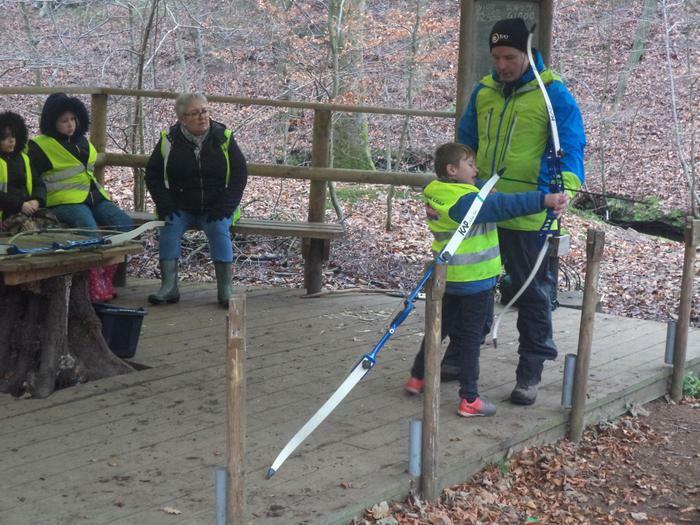 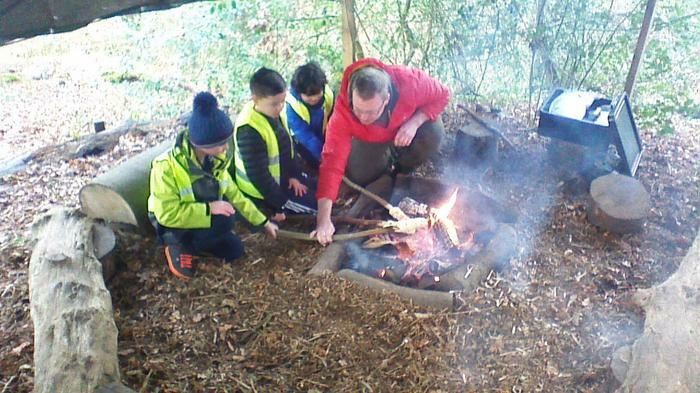 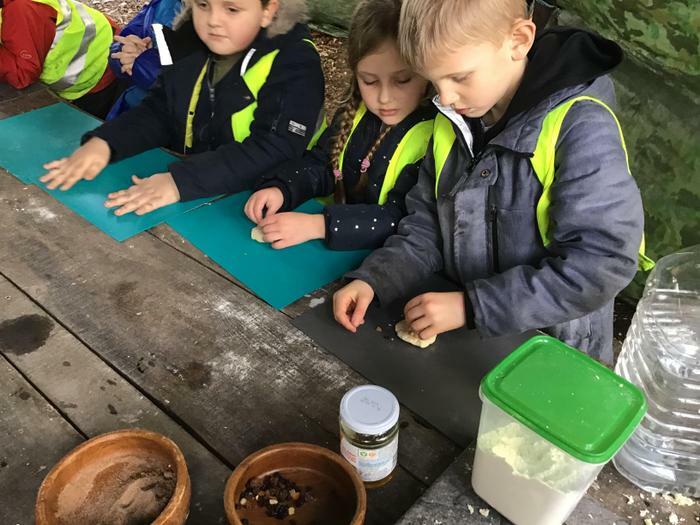 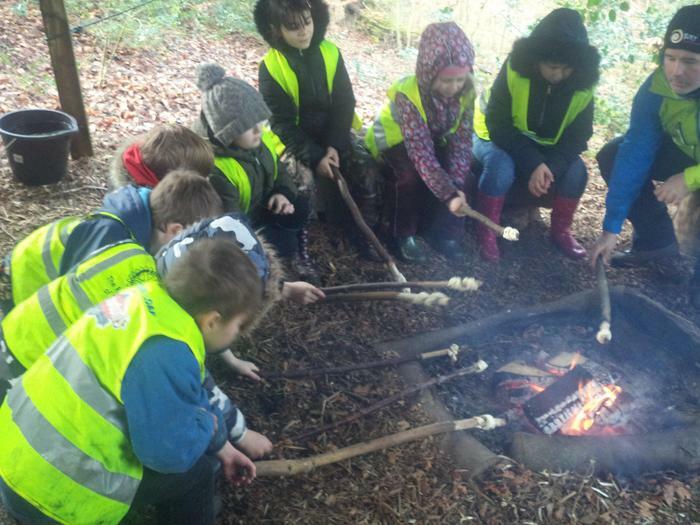 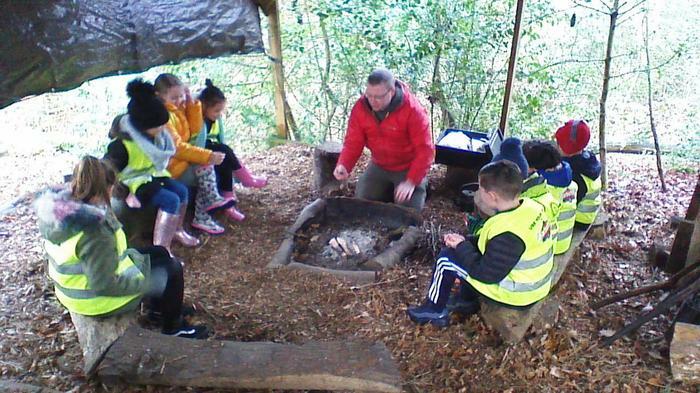 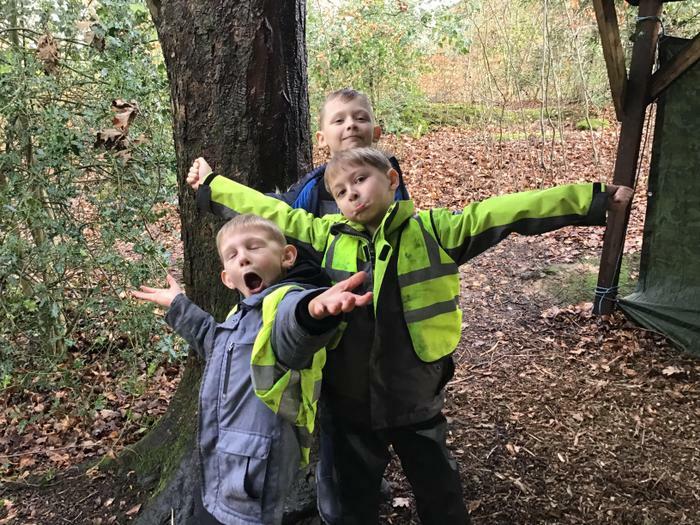 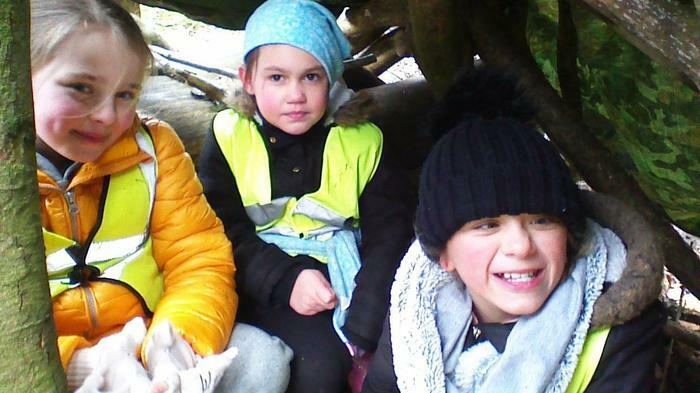 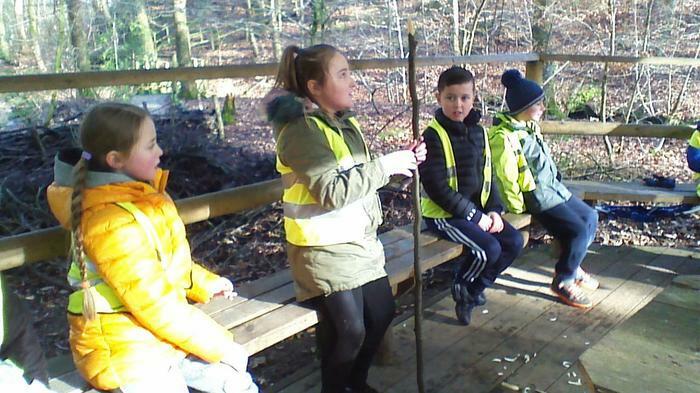 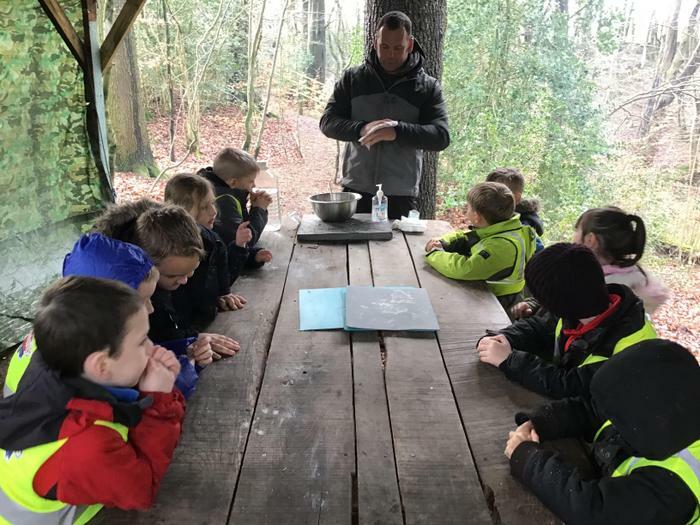 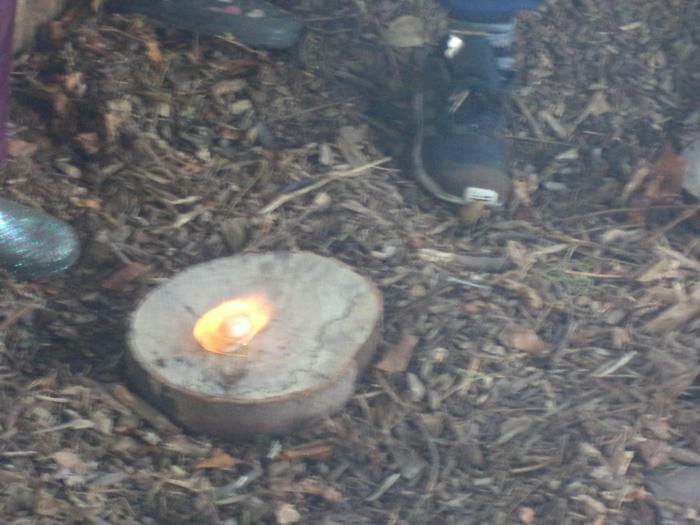 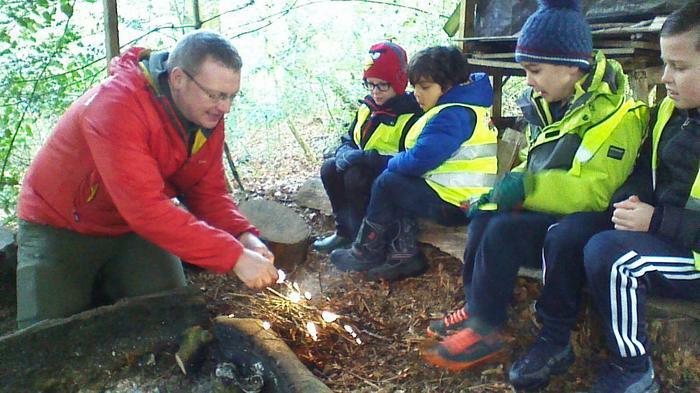 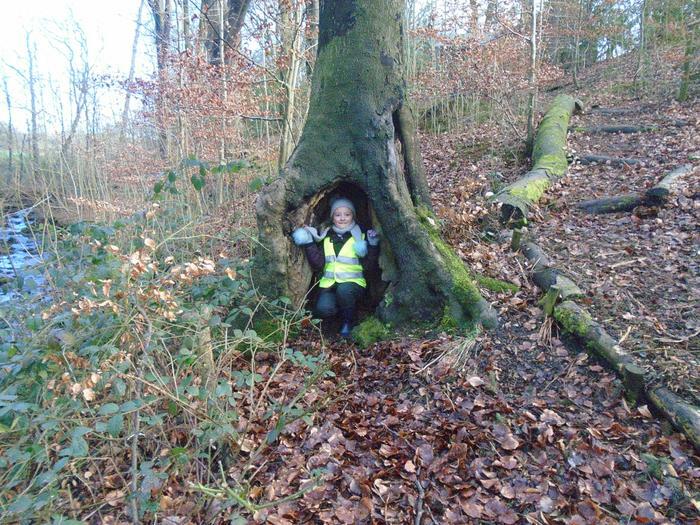 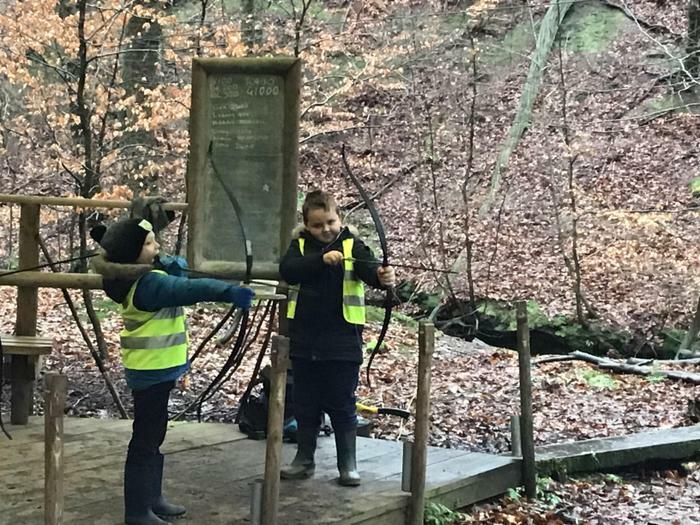 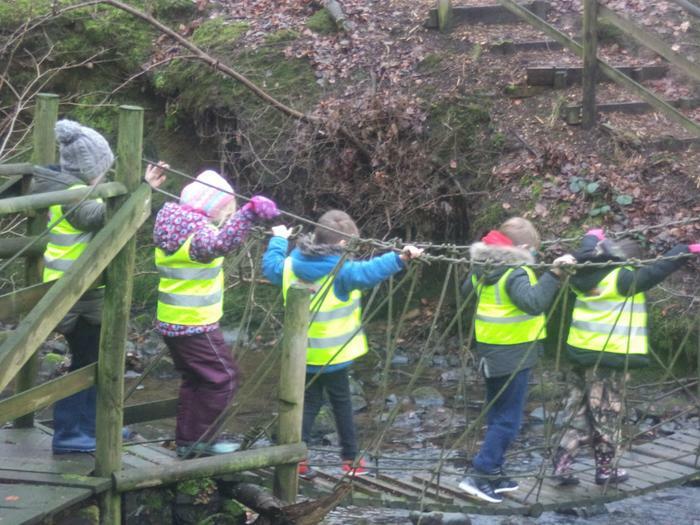 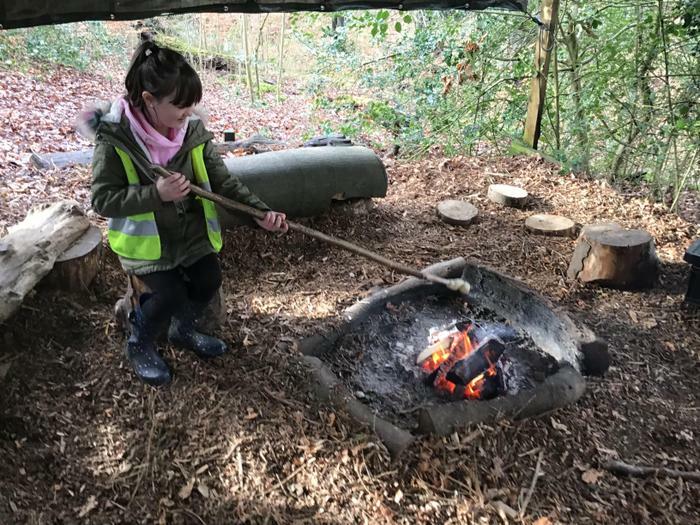 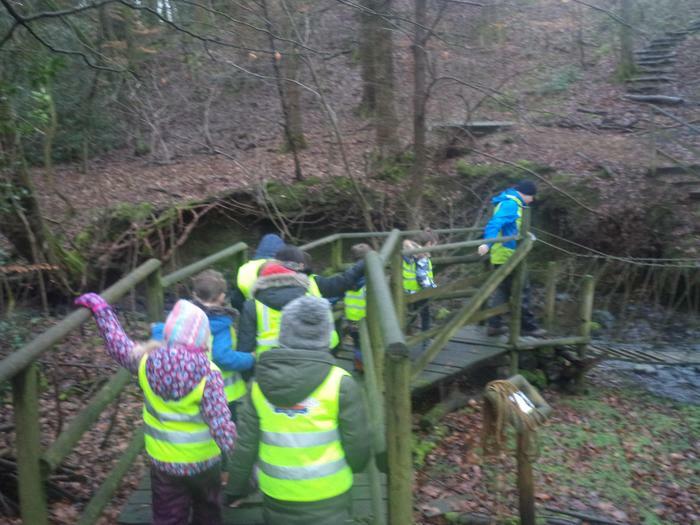 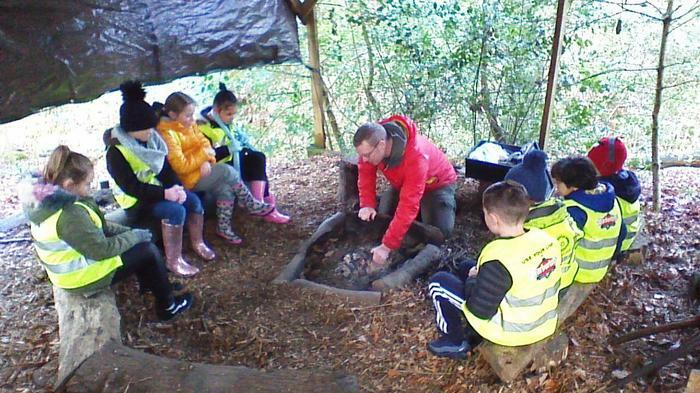 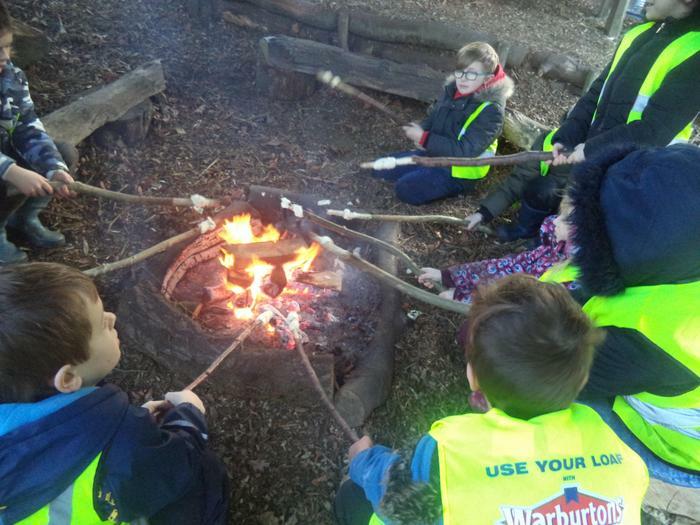 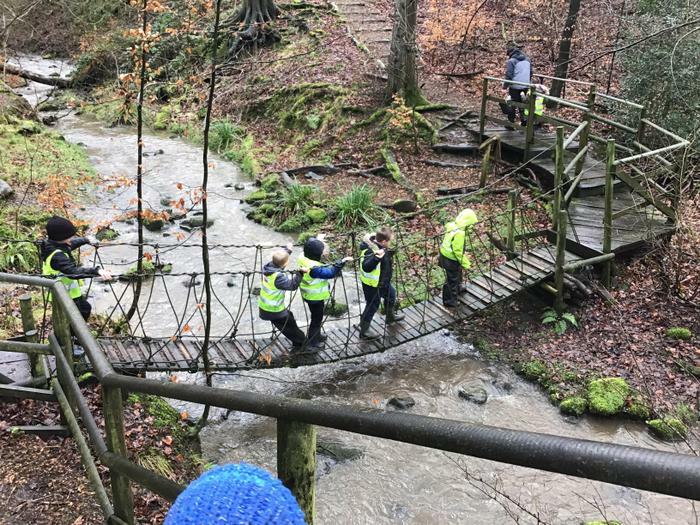 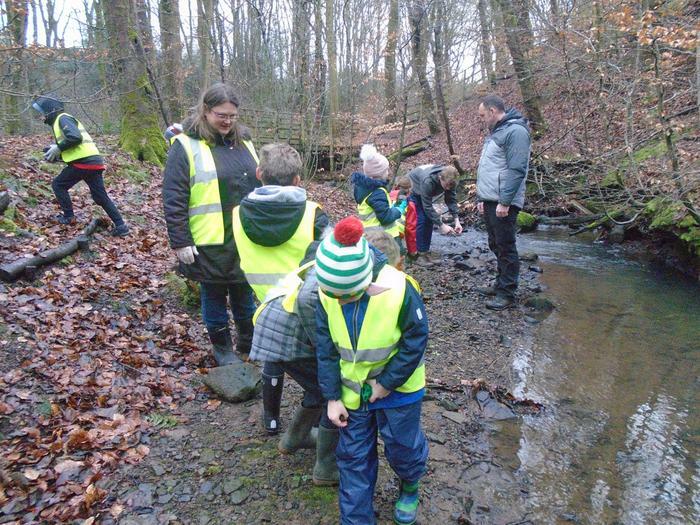 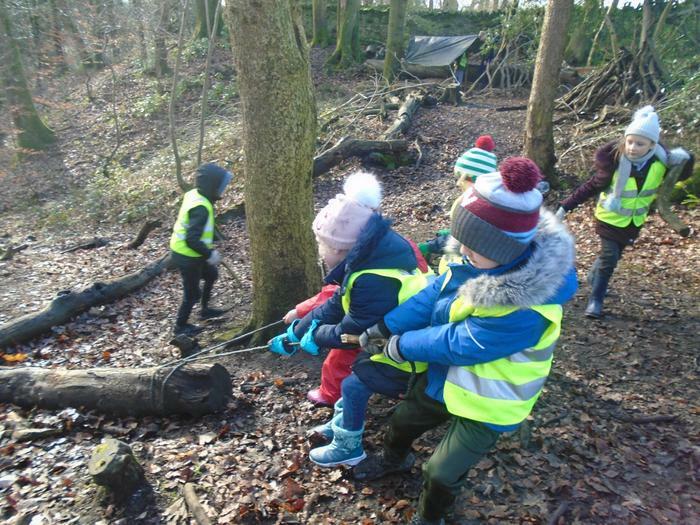 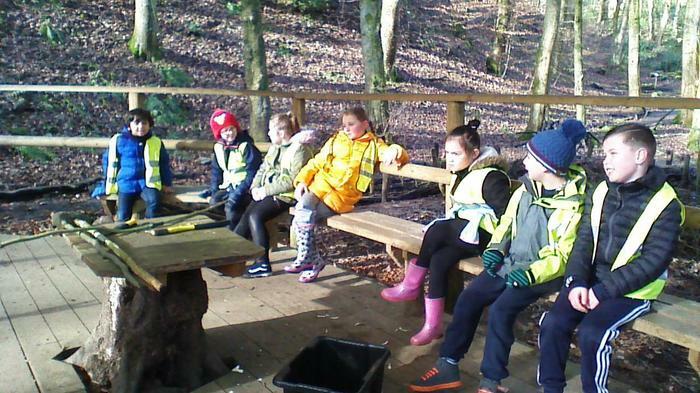 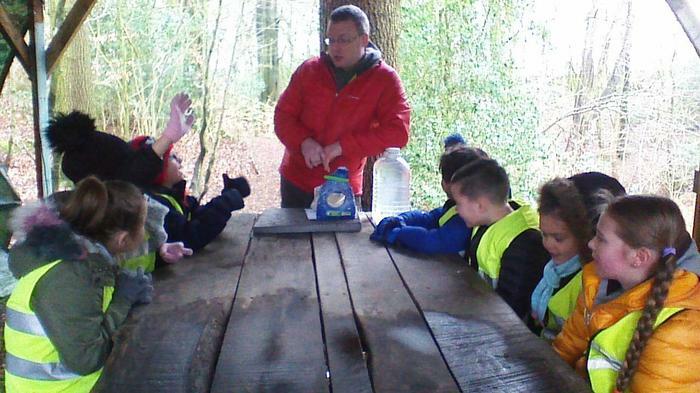 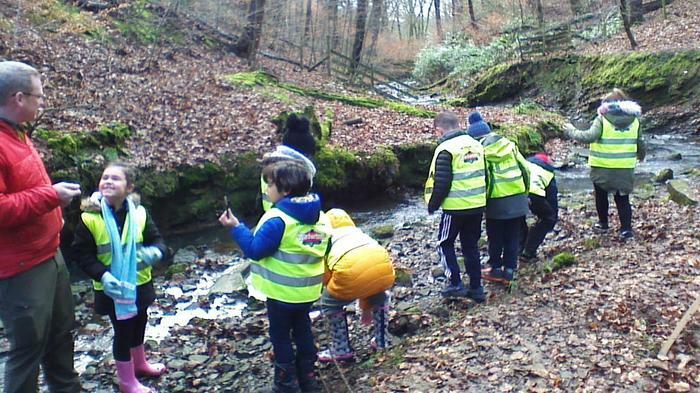 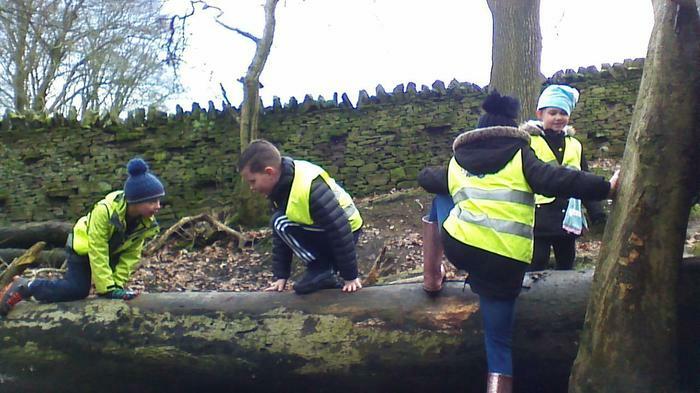 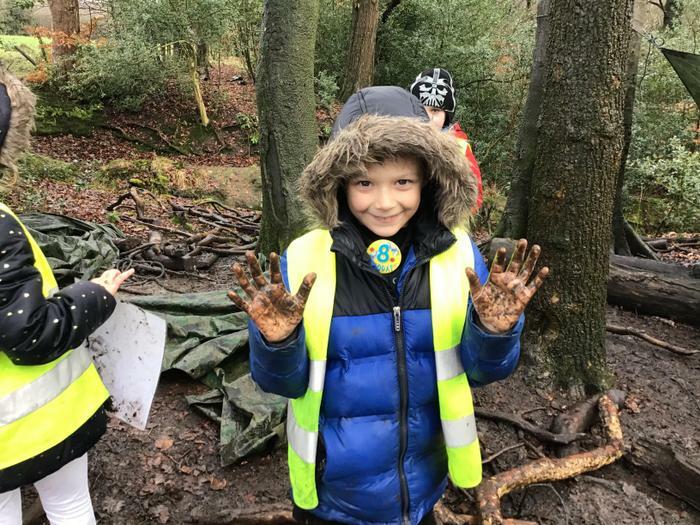 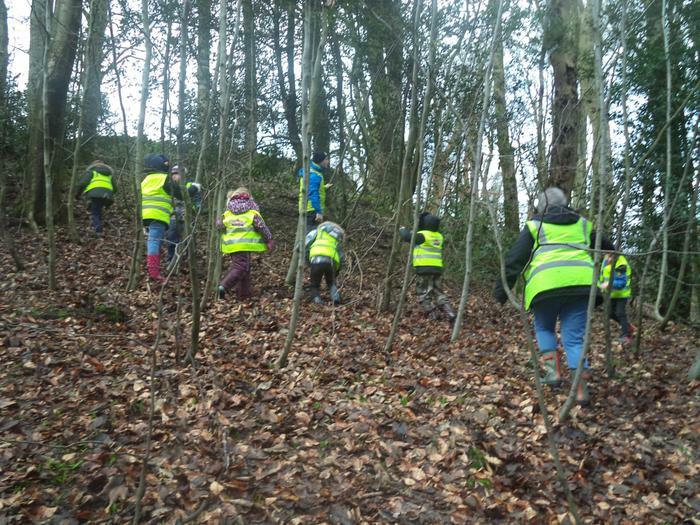 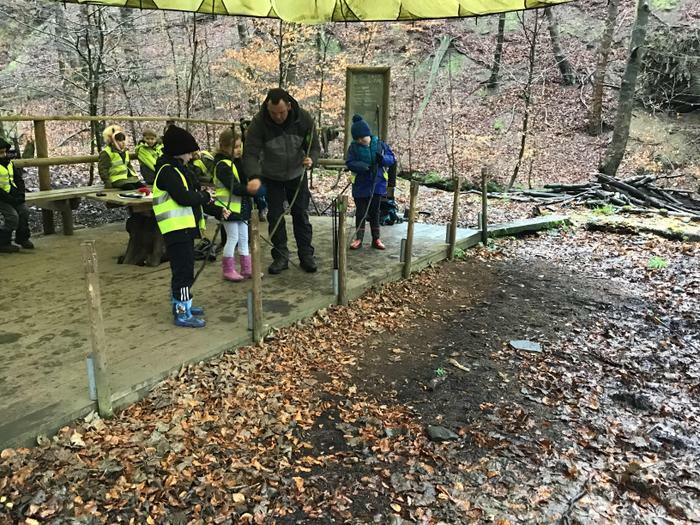 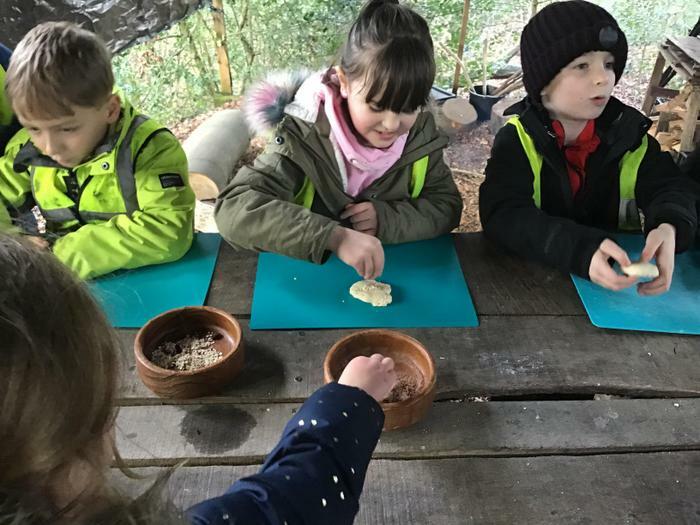 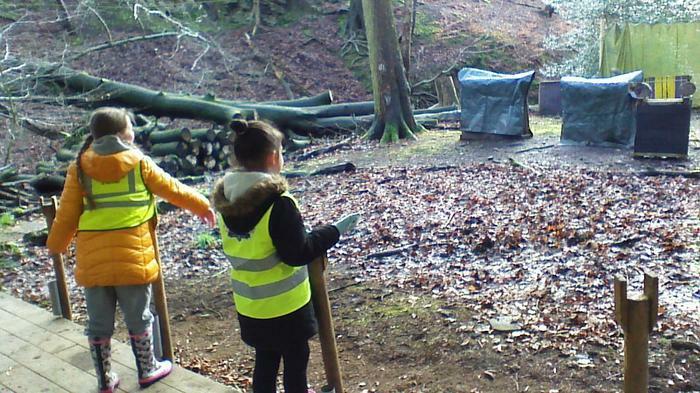 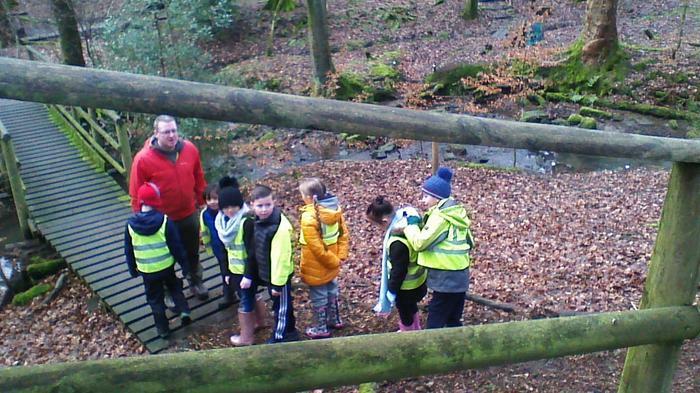 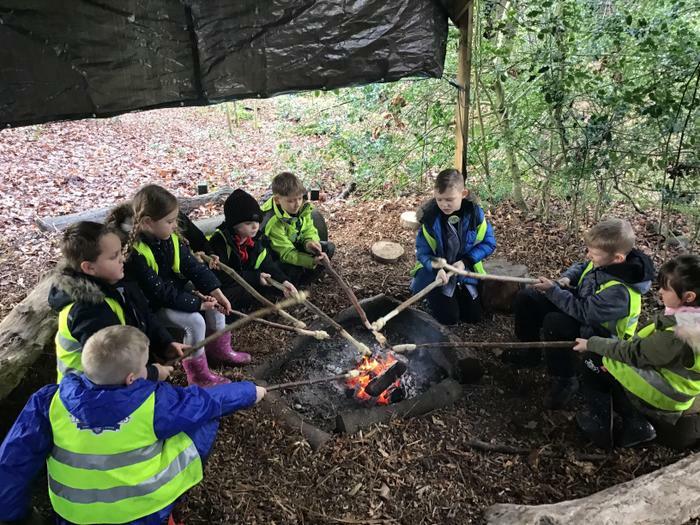 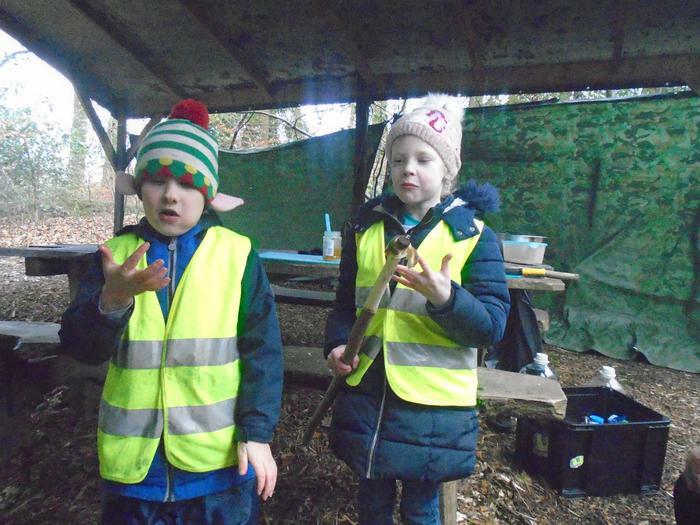 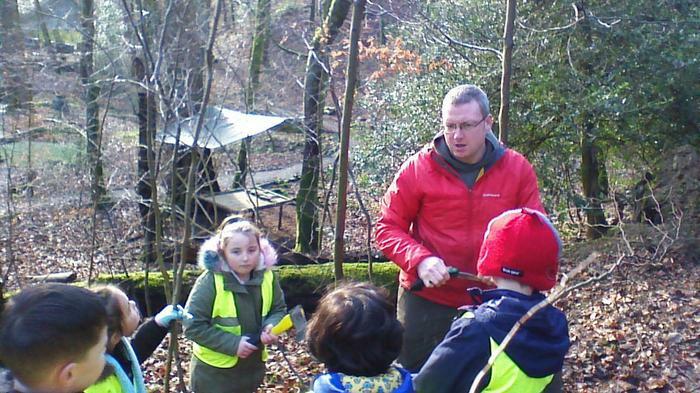 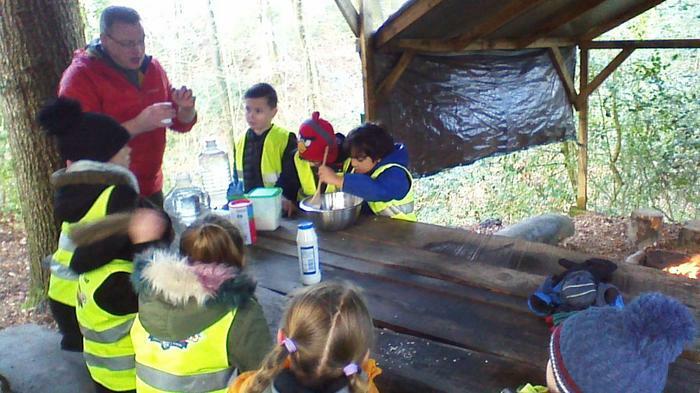 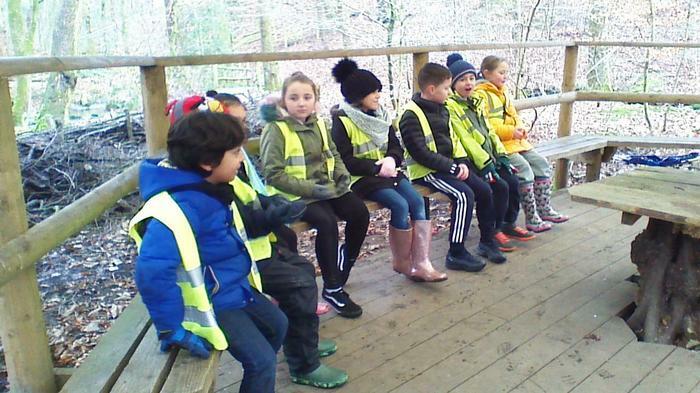 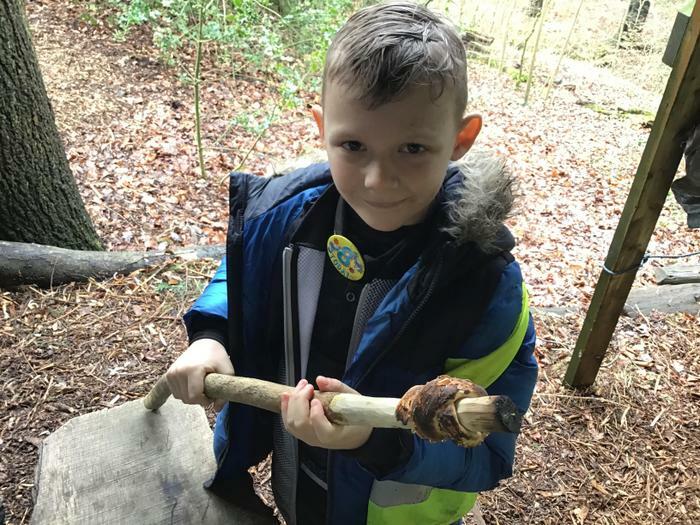 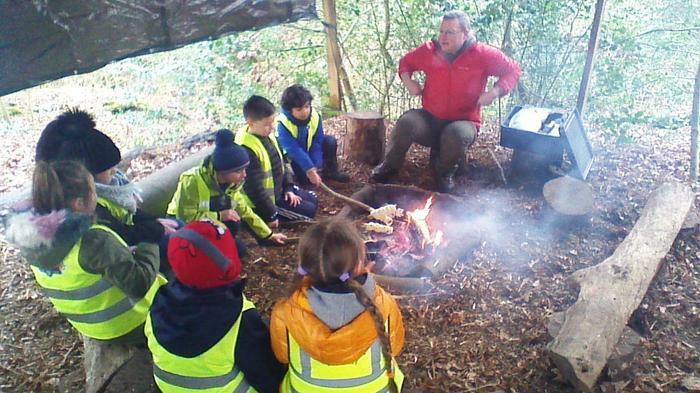 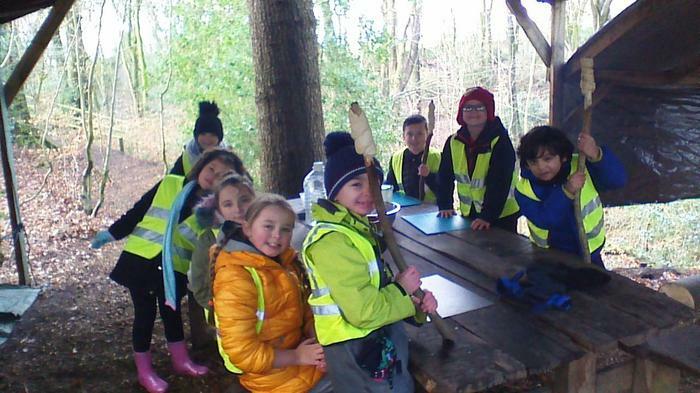 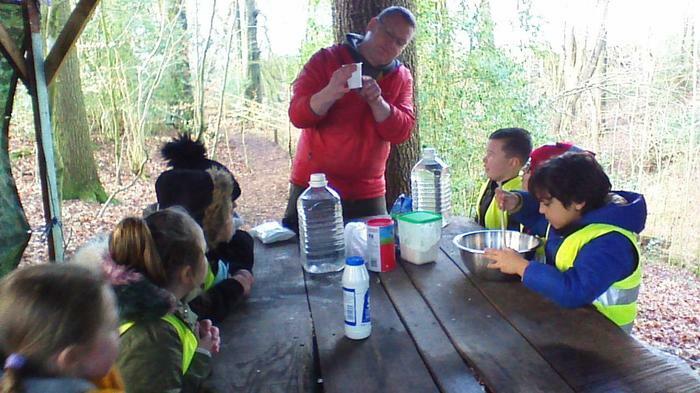 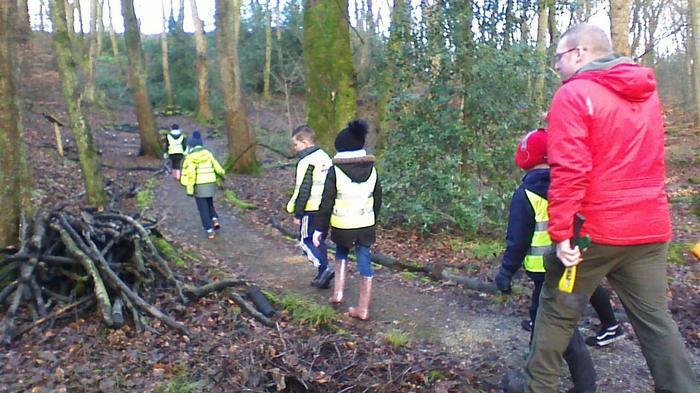 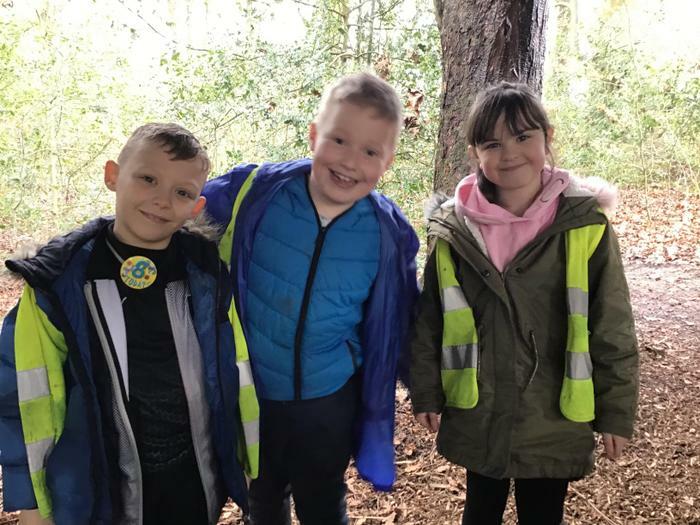 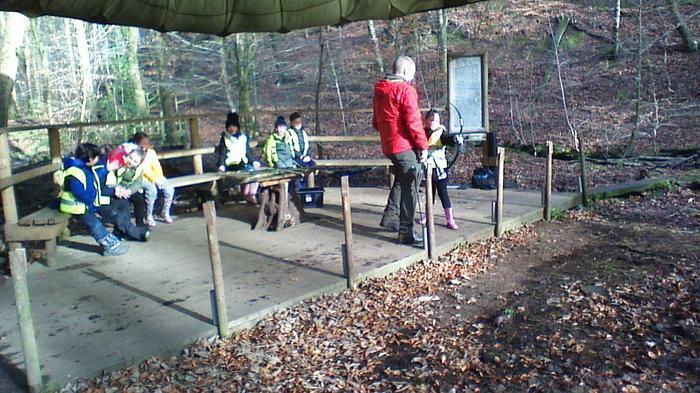 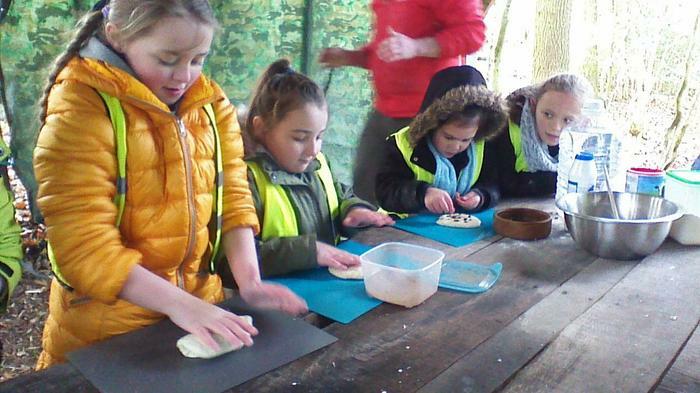 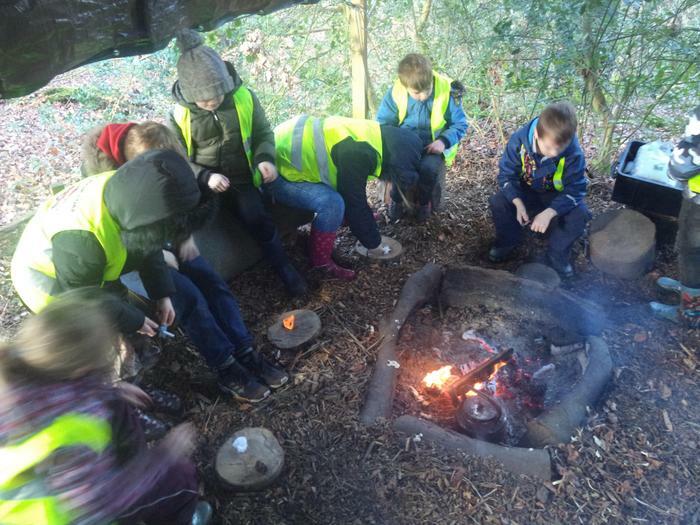 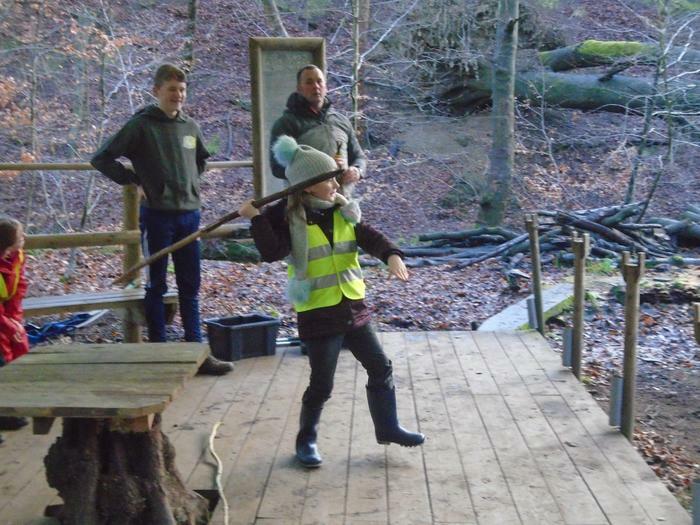 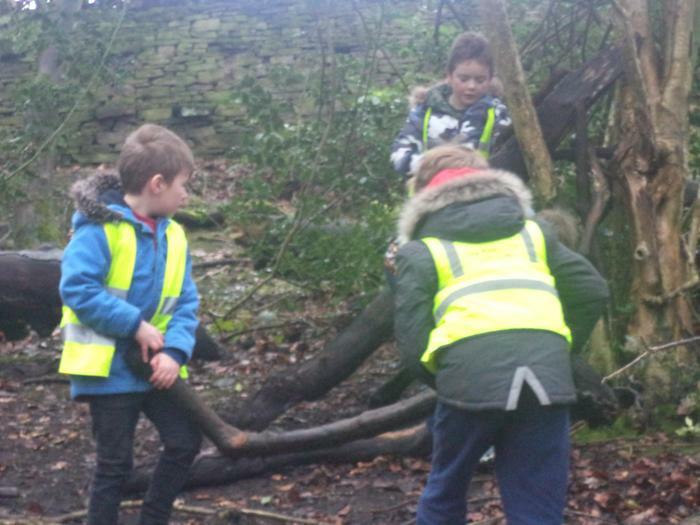 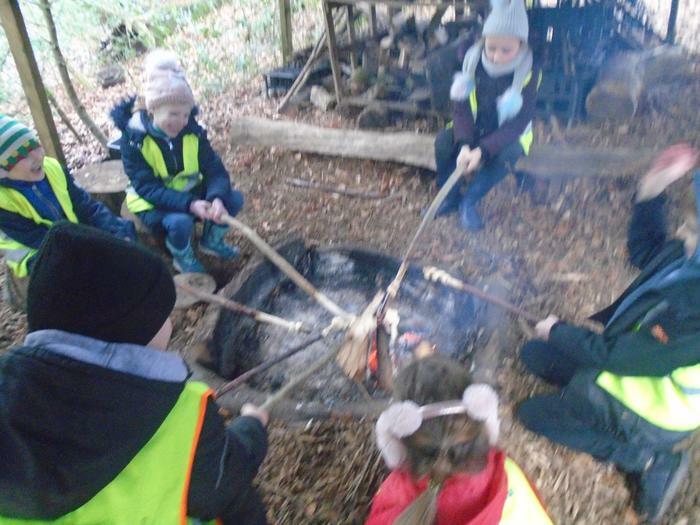 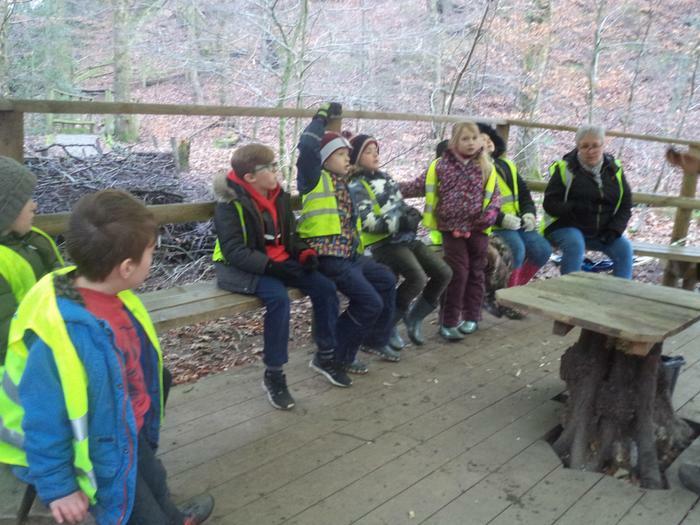 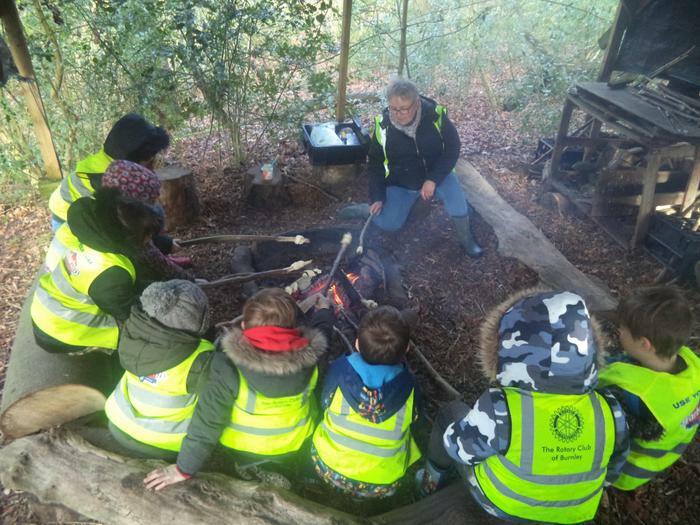 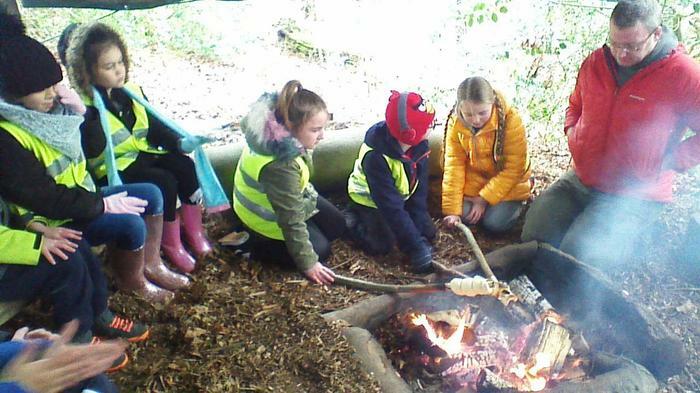 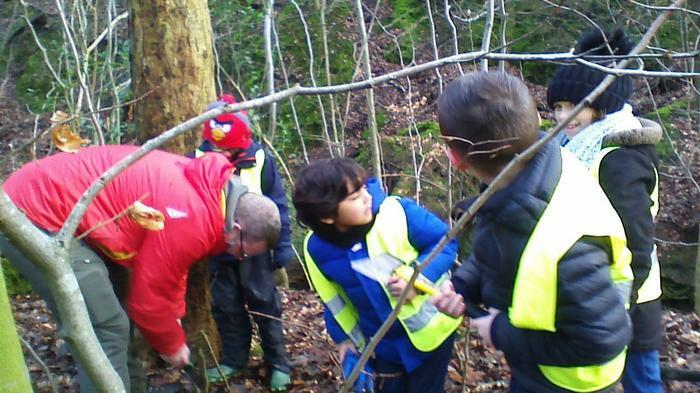 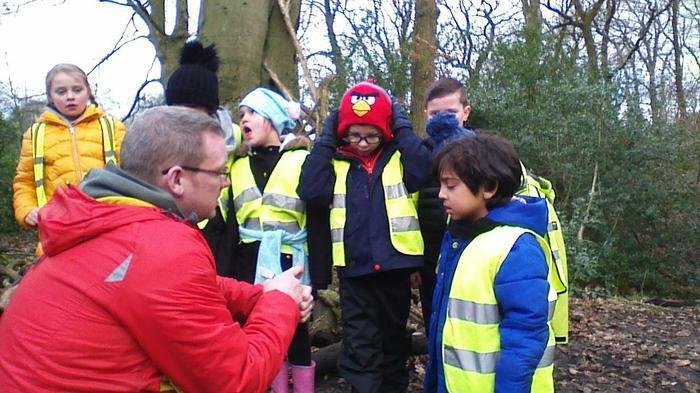 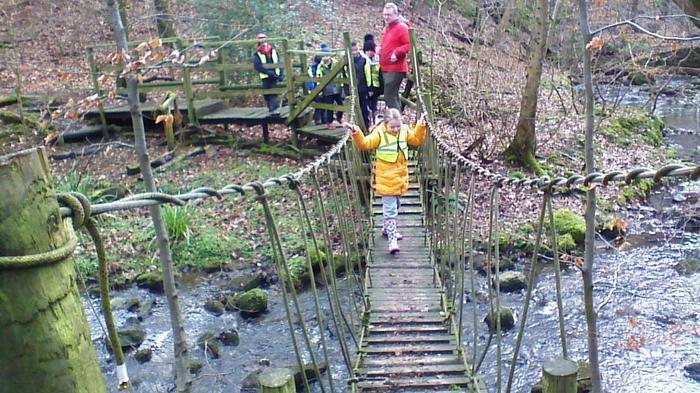 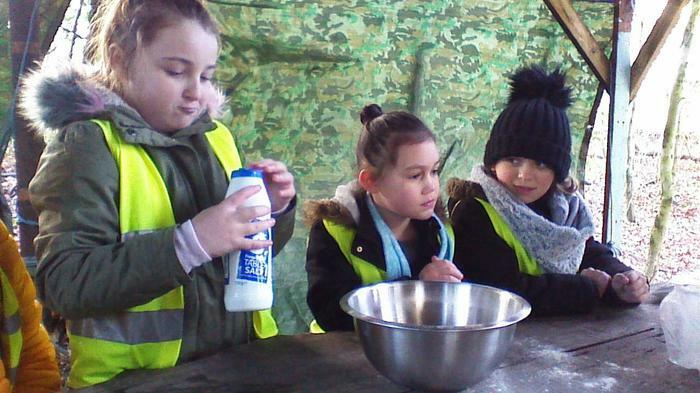 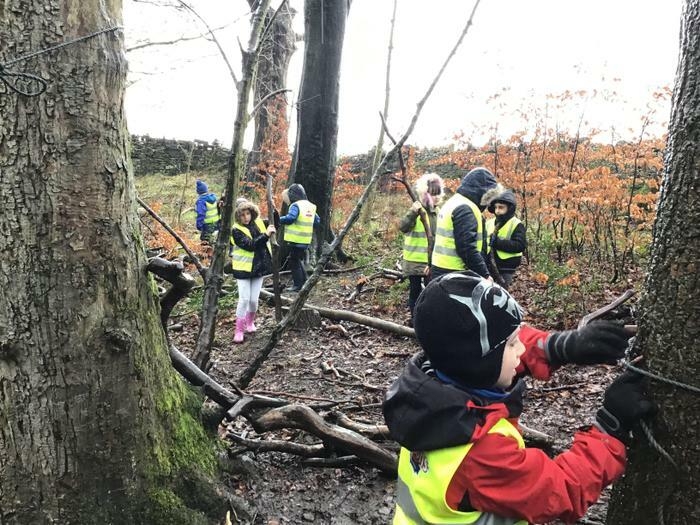 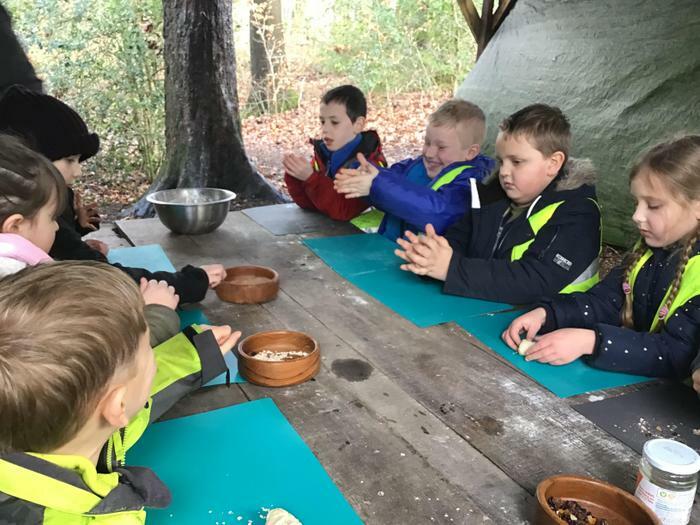 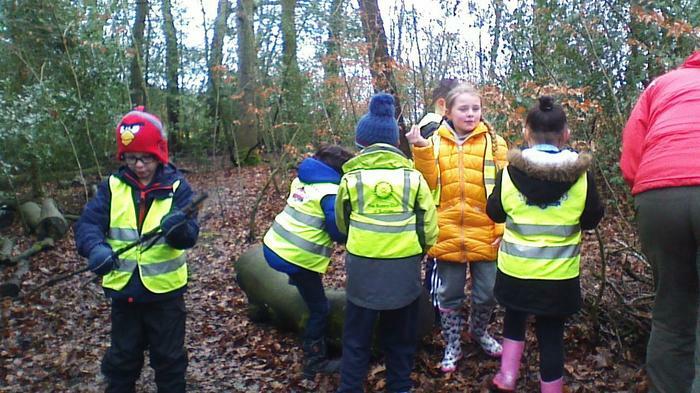 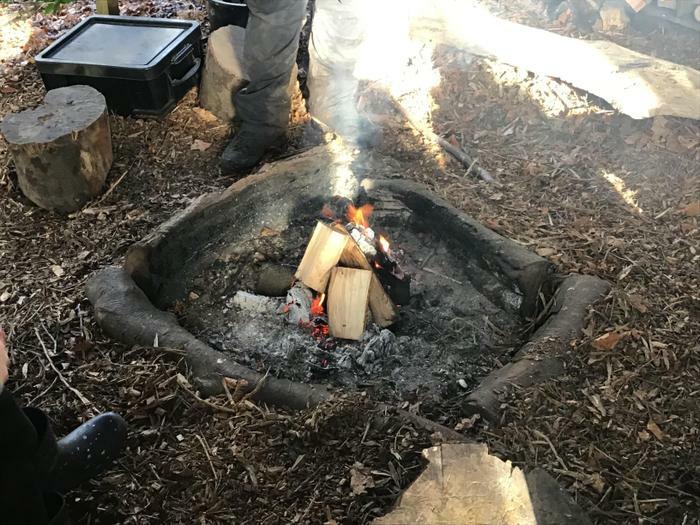 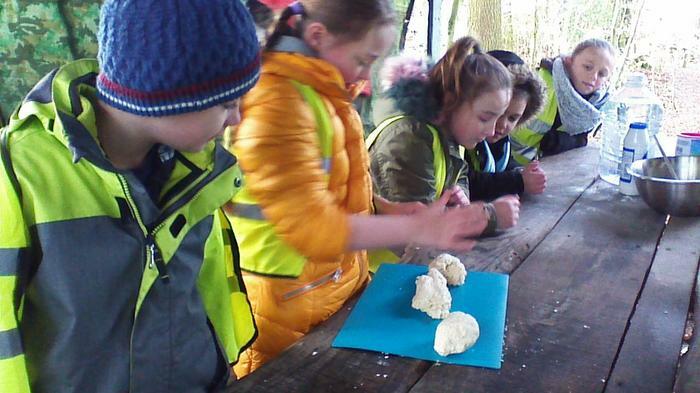 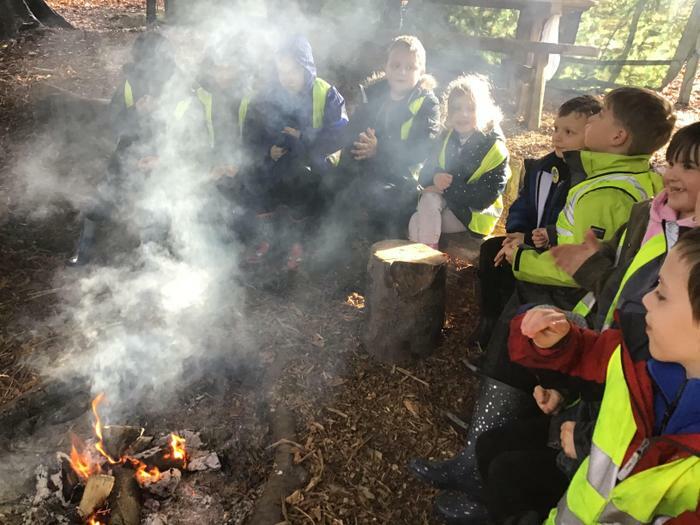 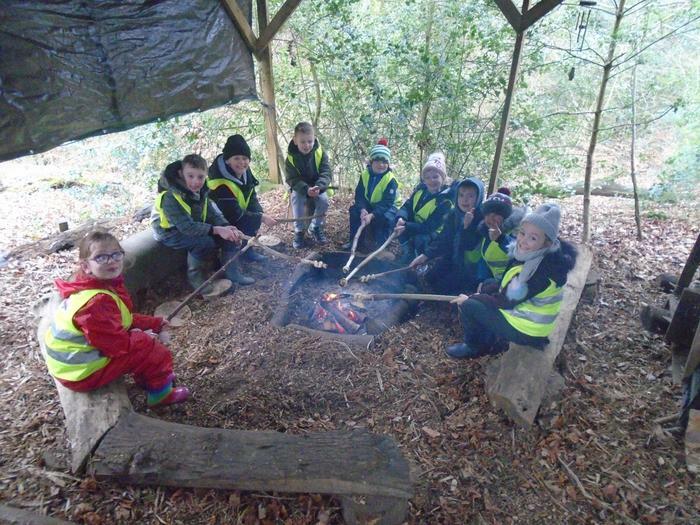 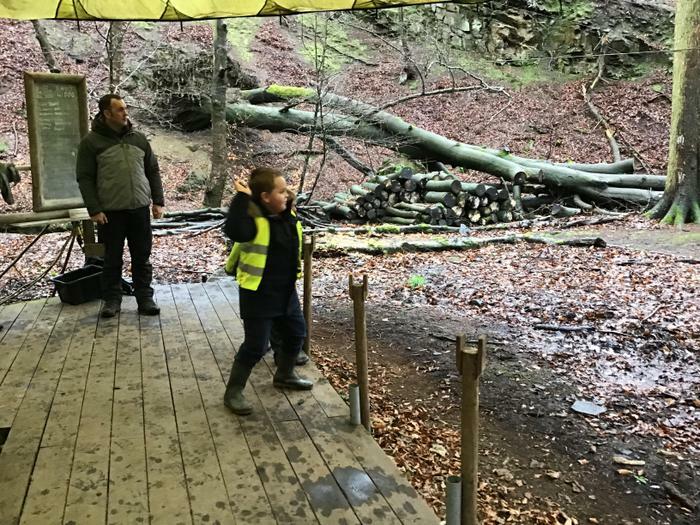 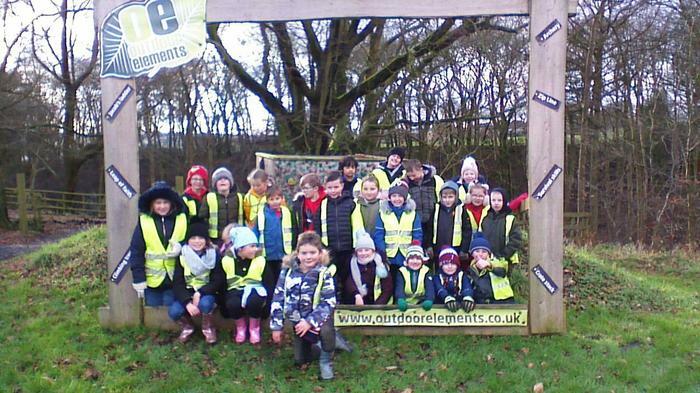 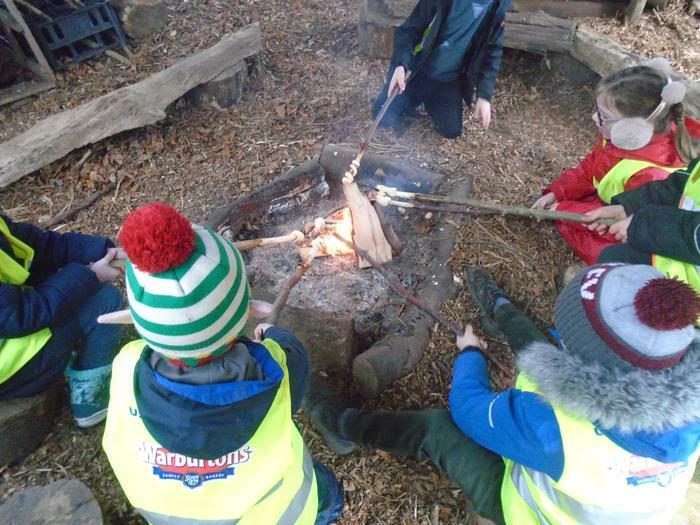 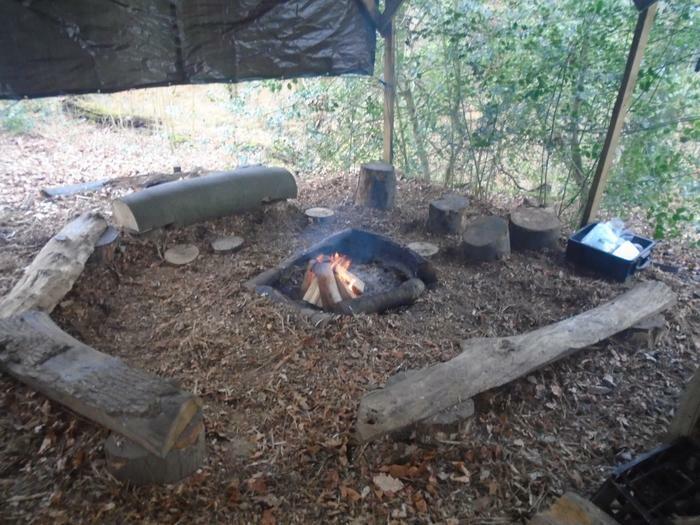 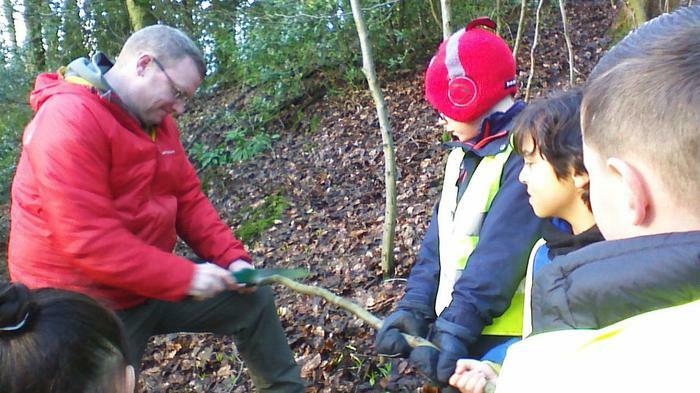 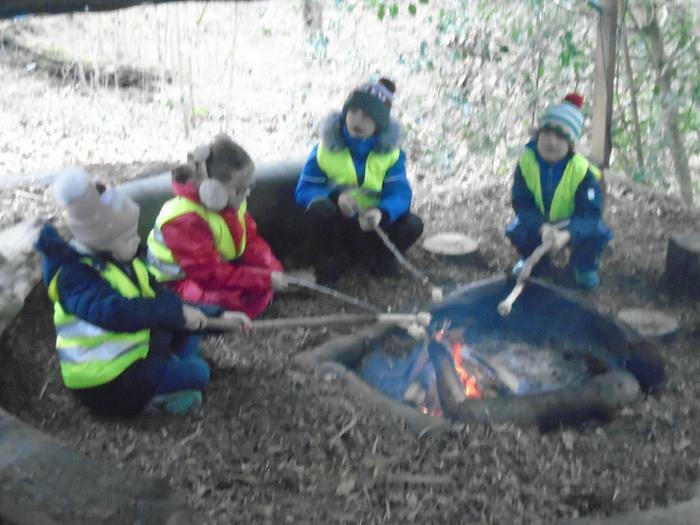 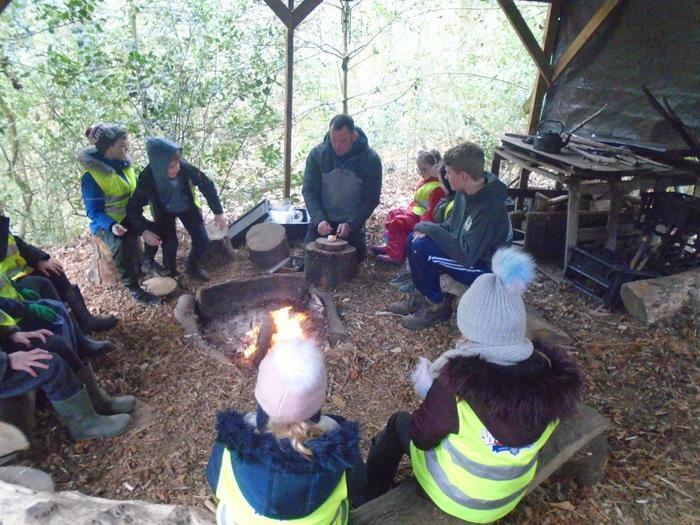 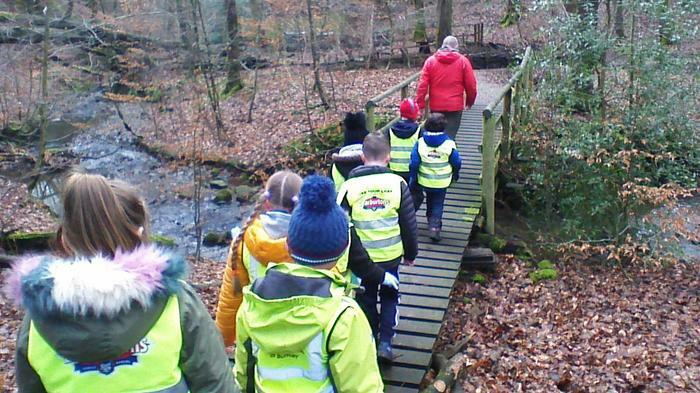 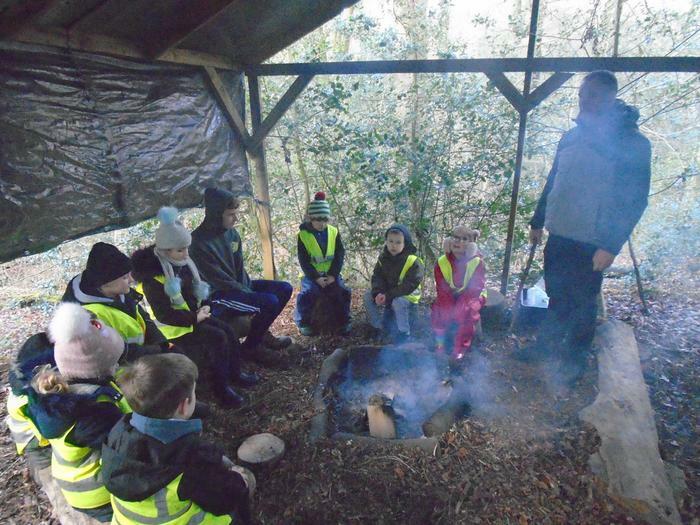 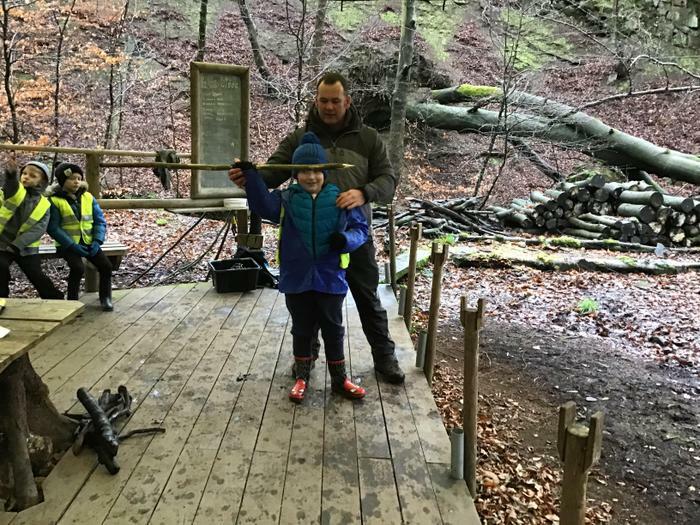 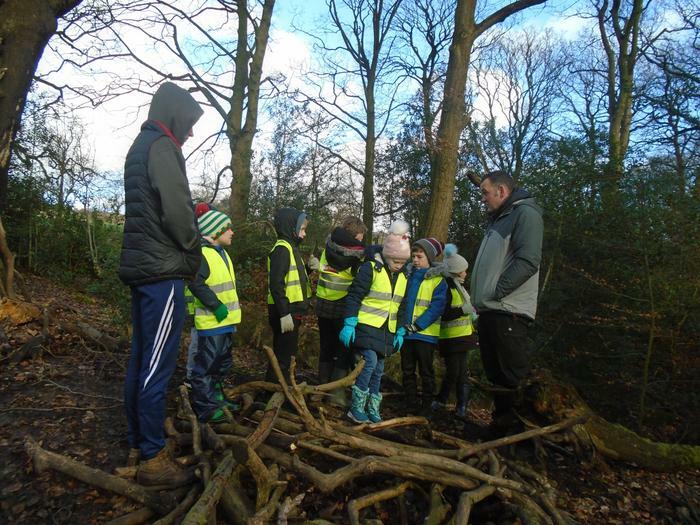 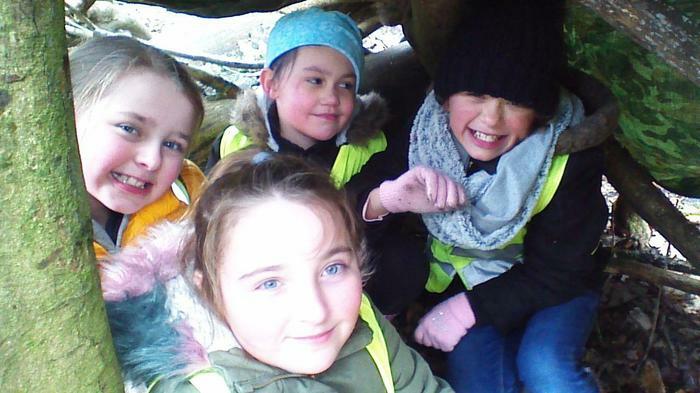 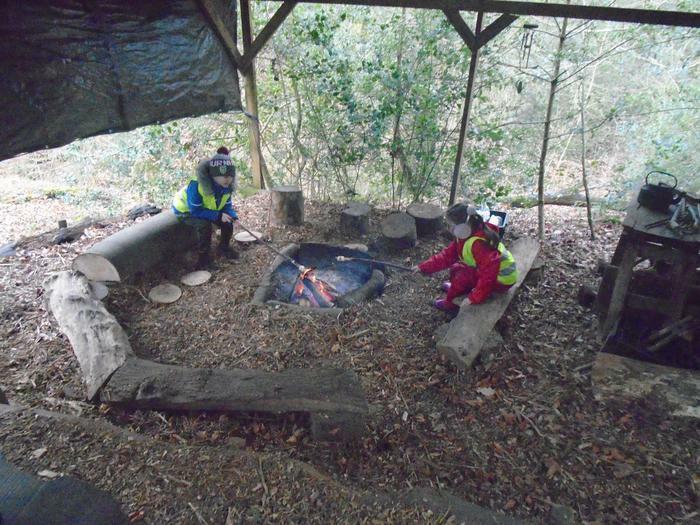 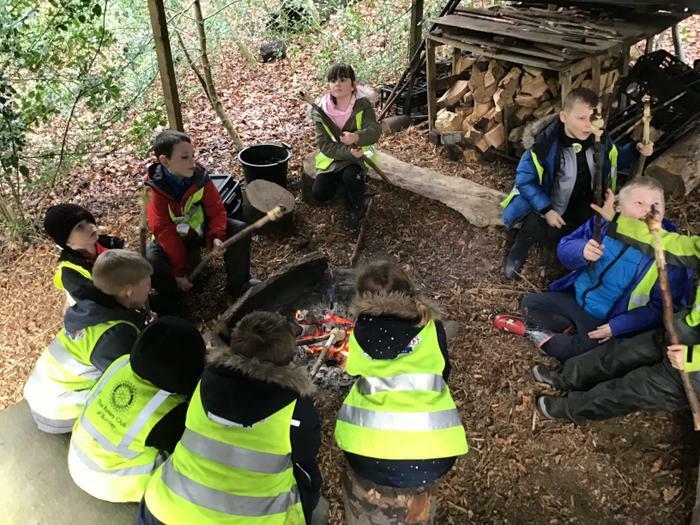 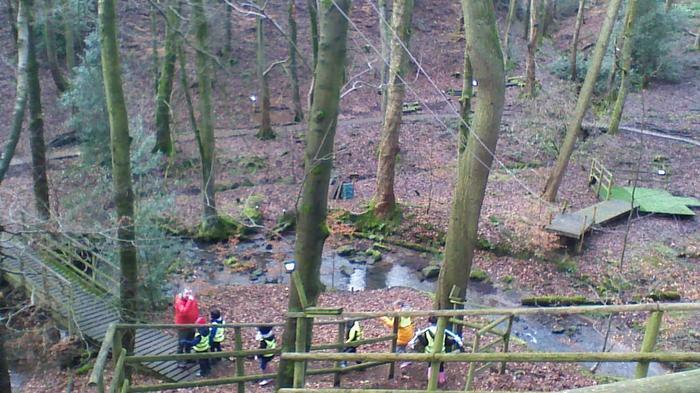 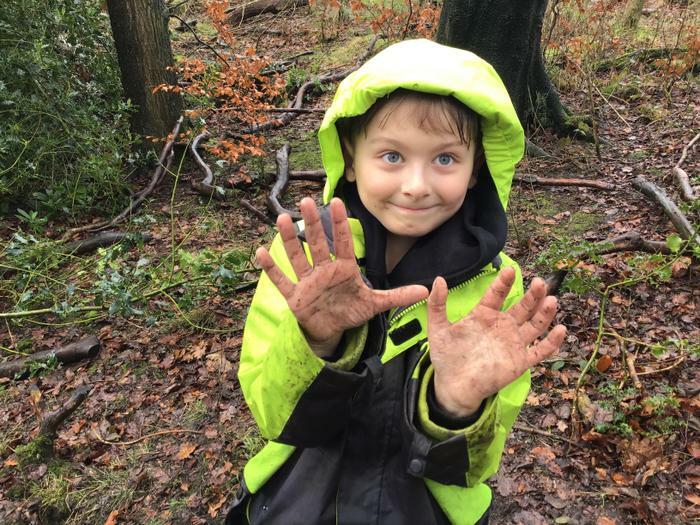 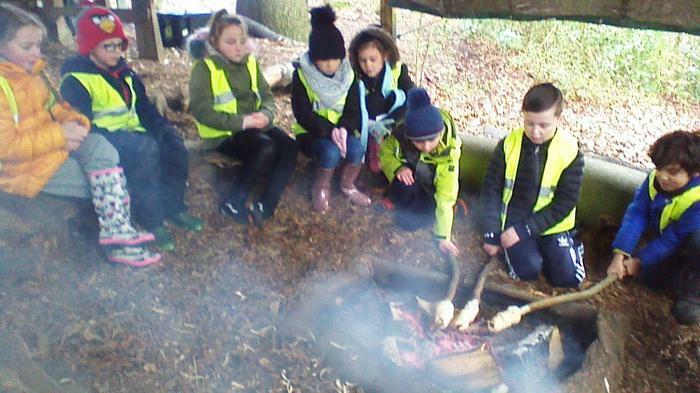 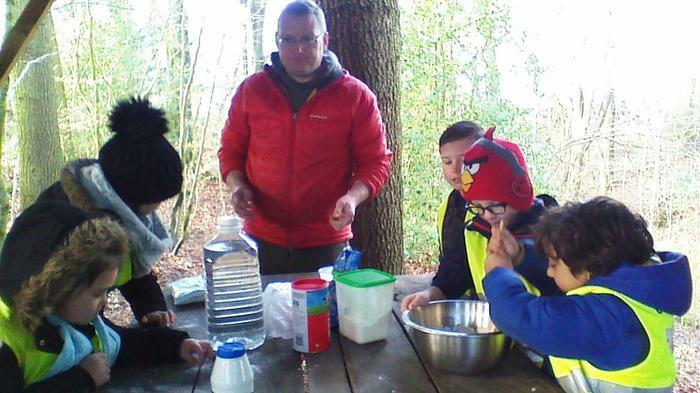 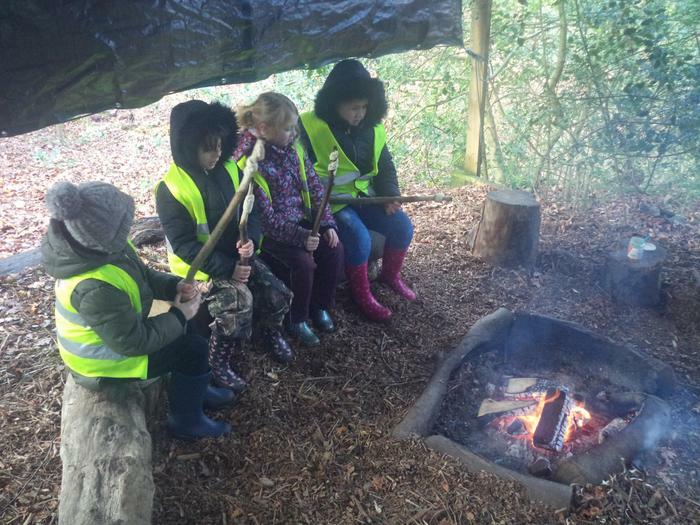 Year 3 had a fantastic time at Outdoor Elements where they experienced what life was like during the Stone Age. 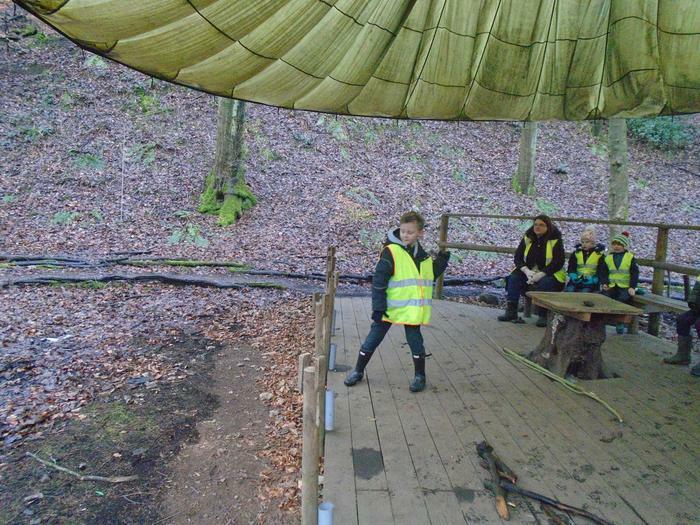 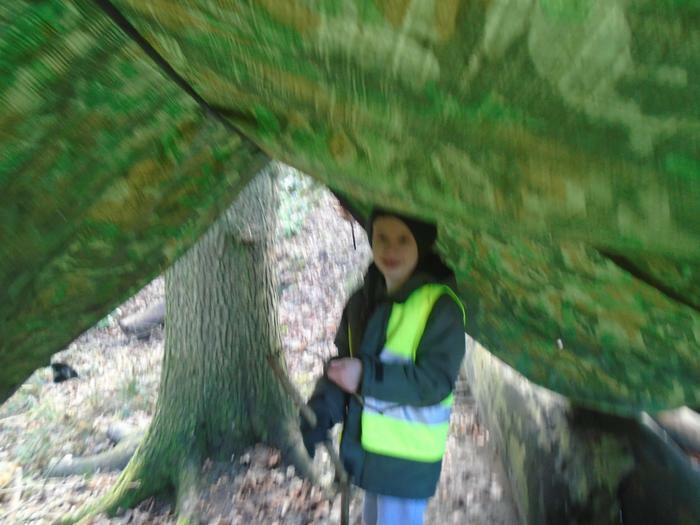 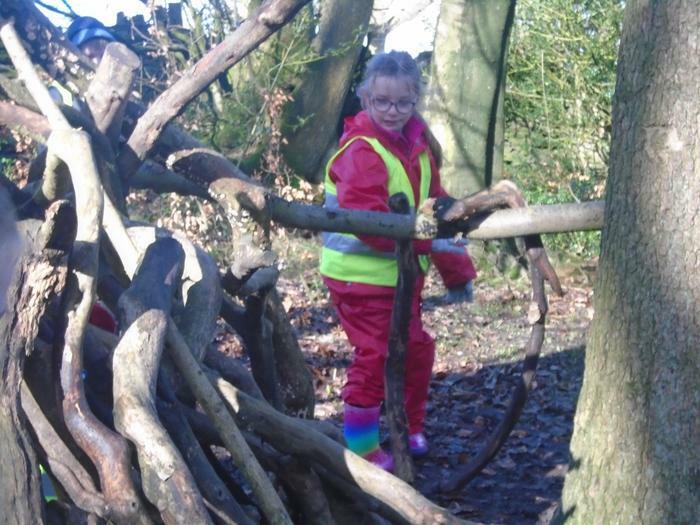 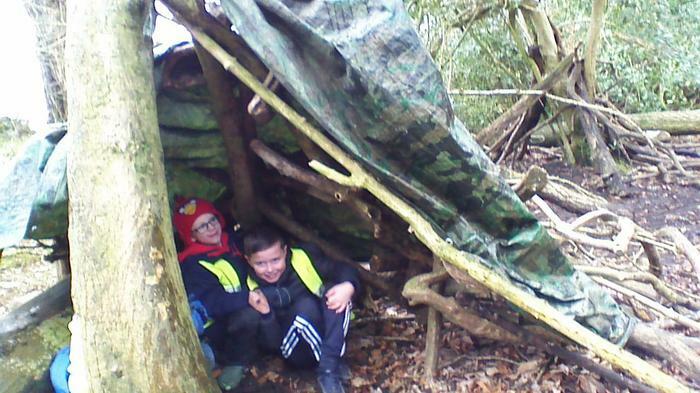 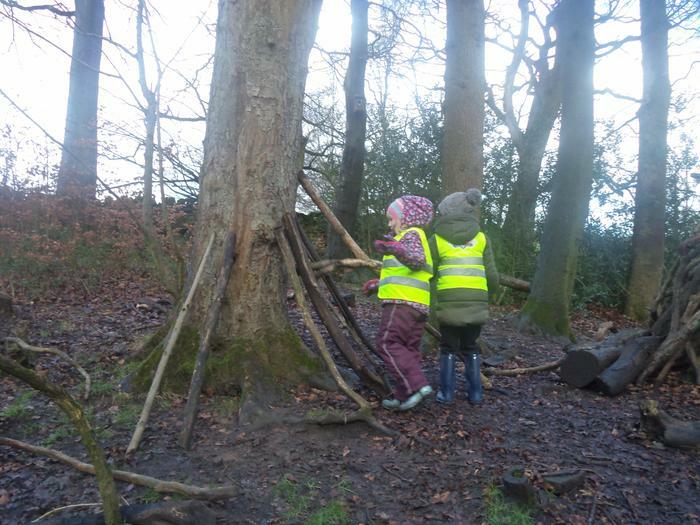 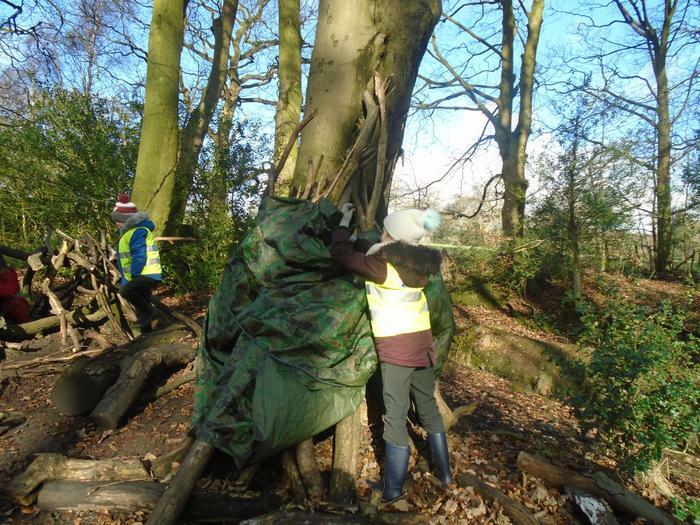 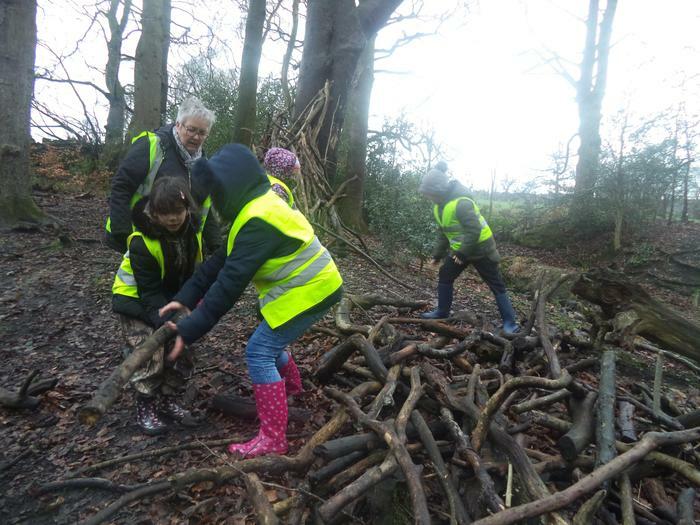 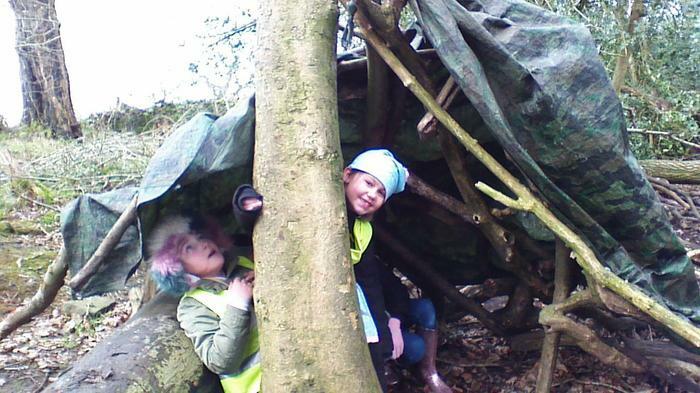 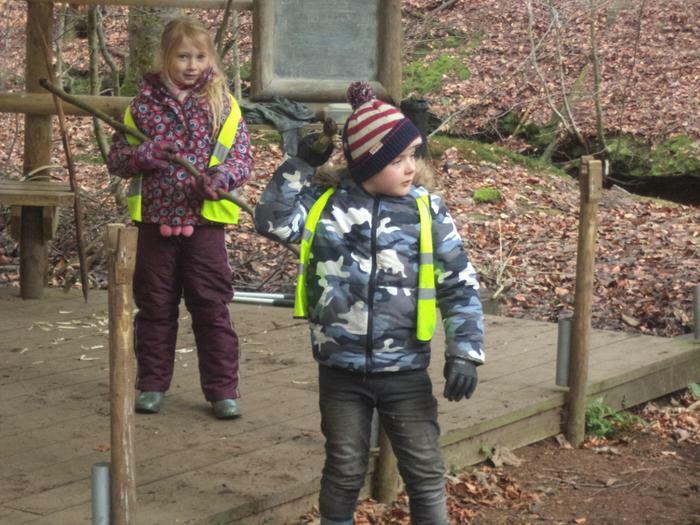 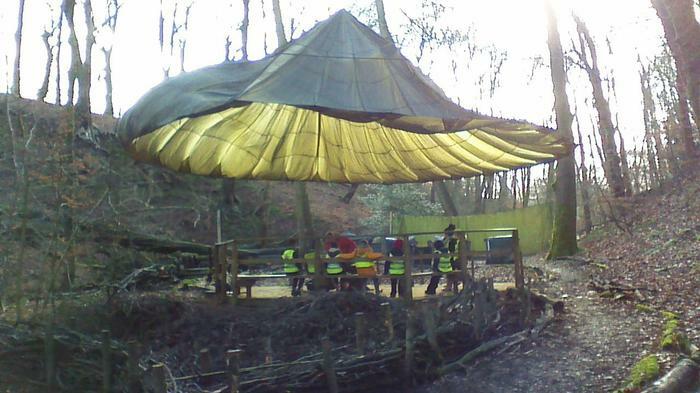 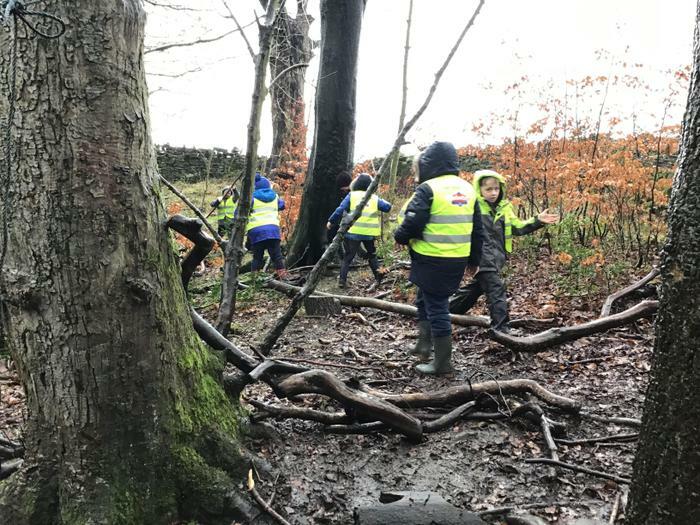 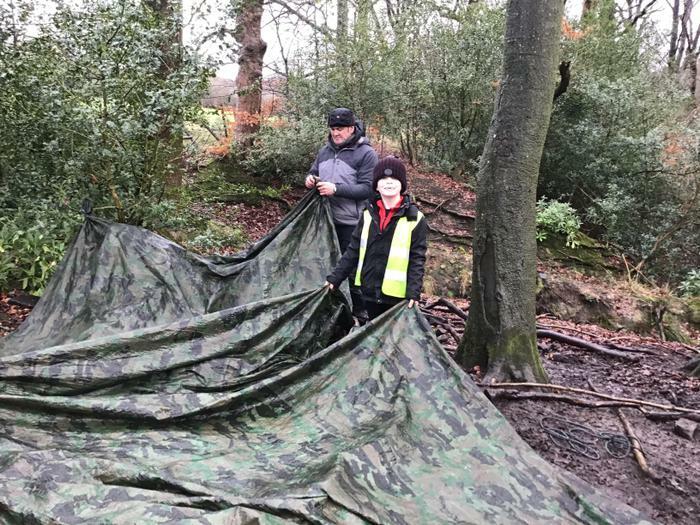 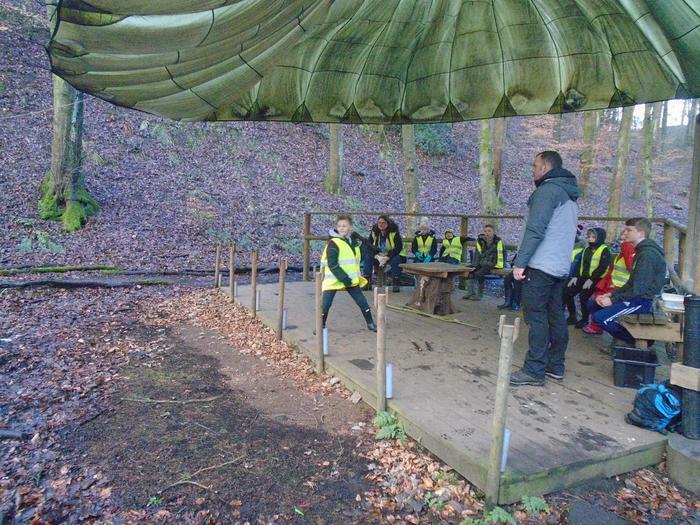 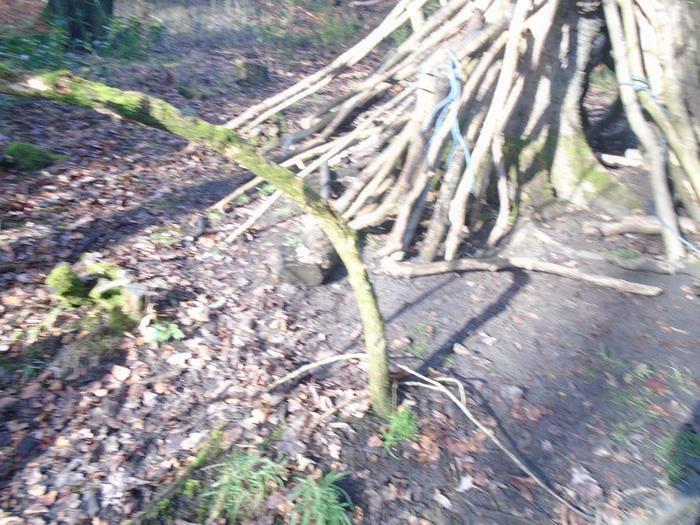 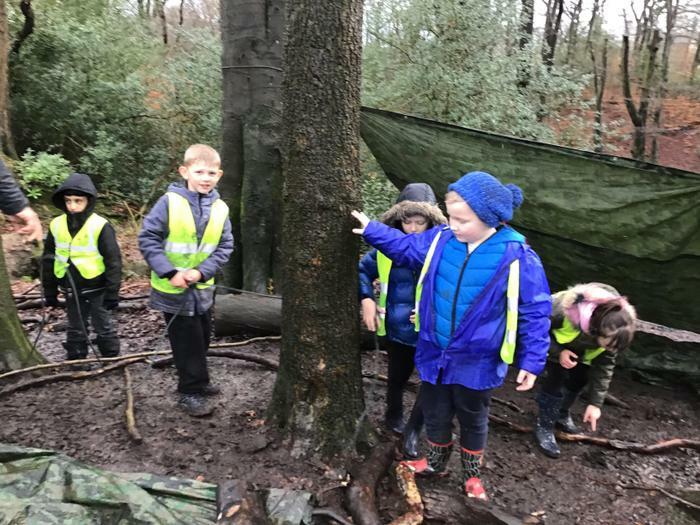 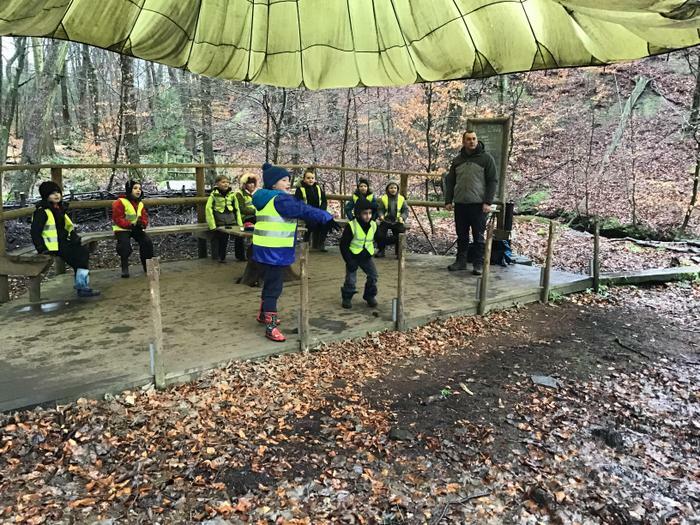 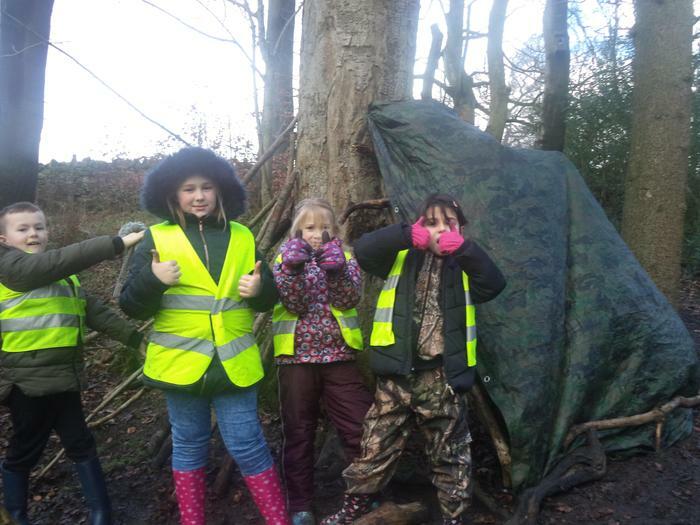 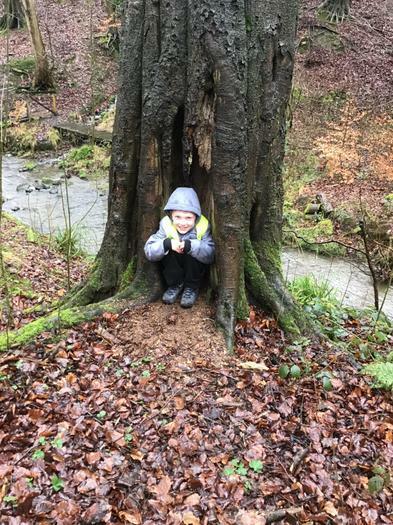 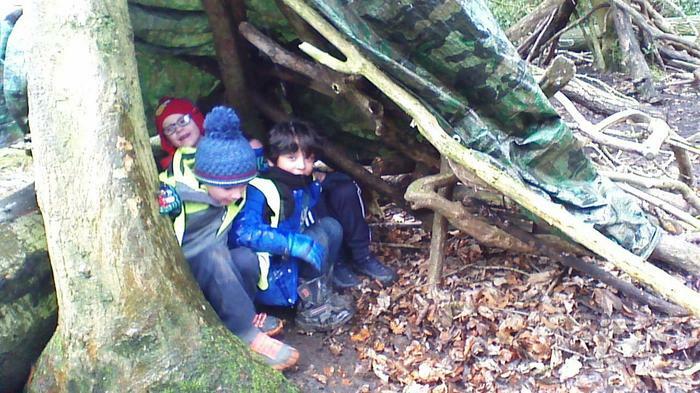 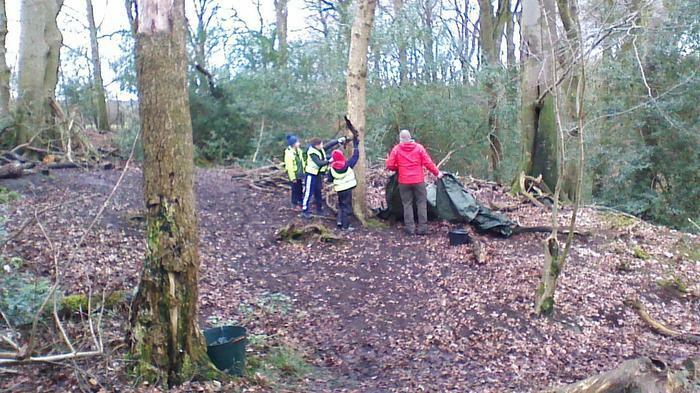 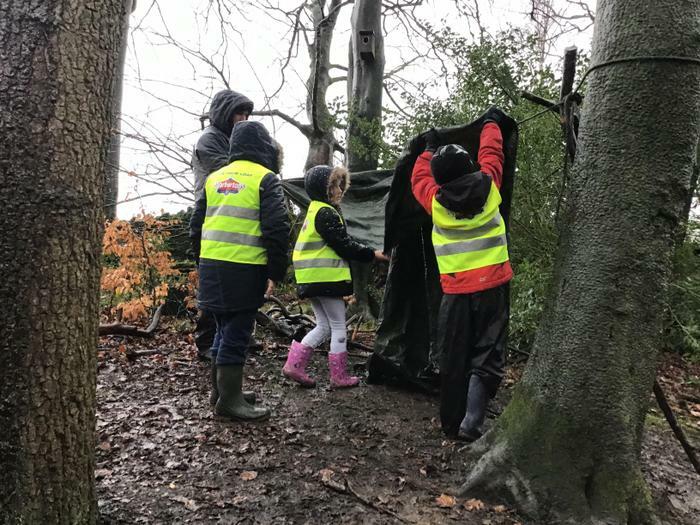 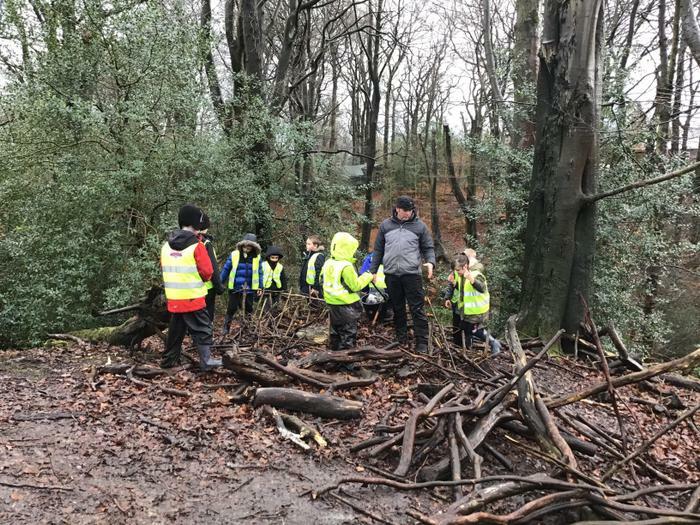 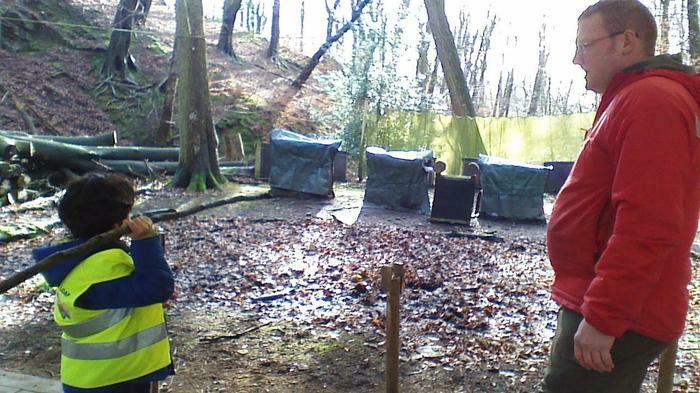 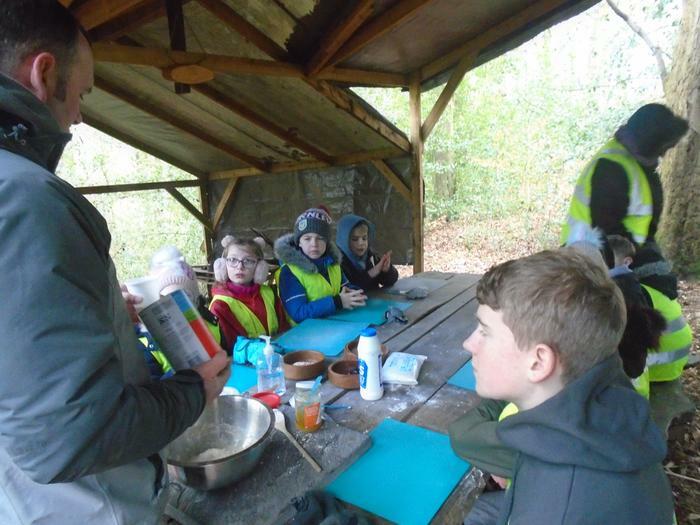 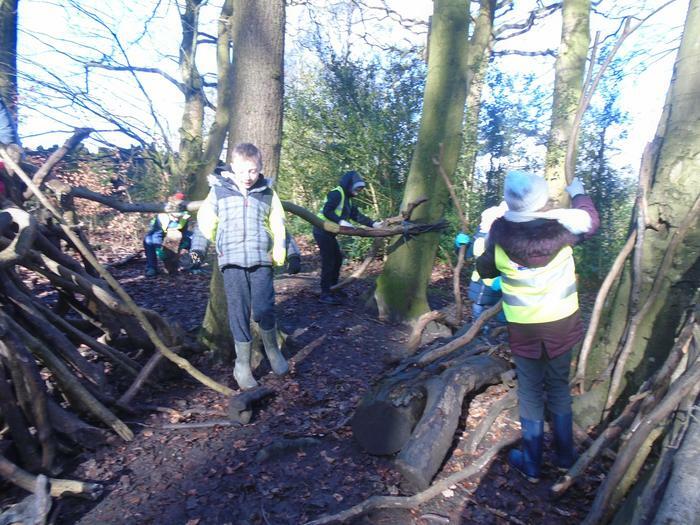 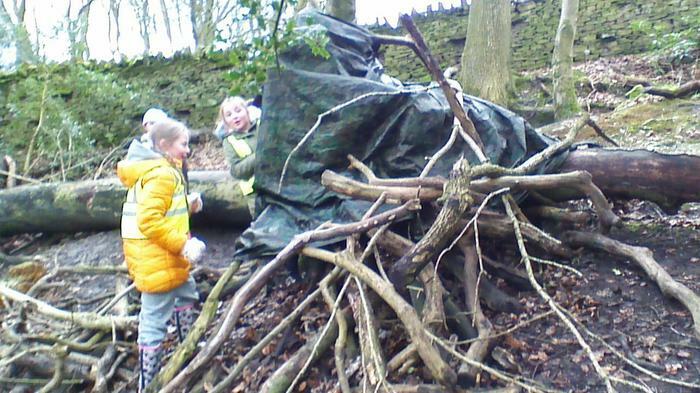 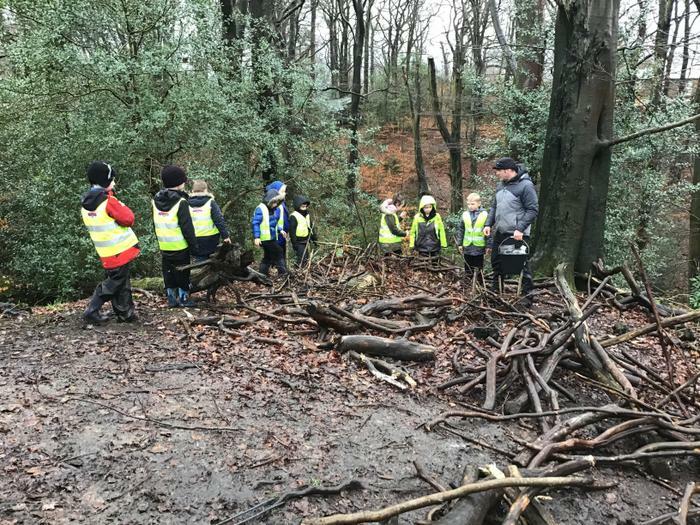 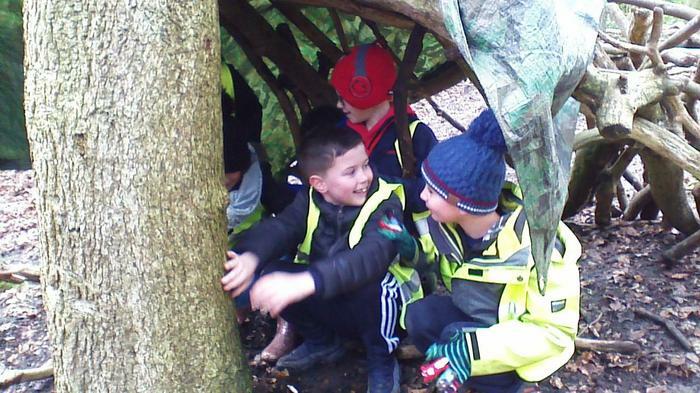 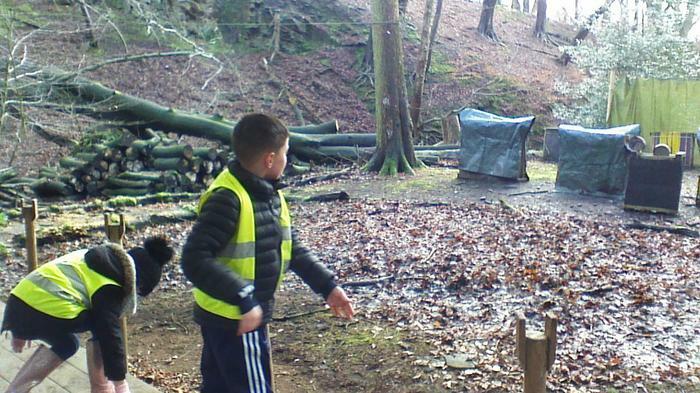 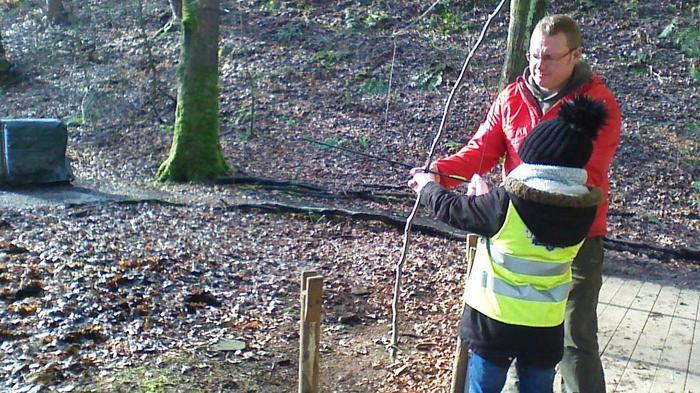 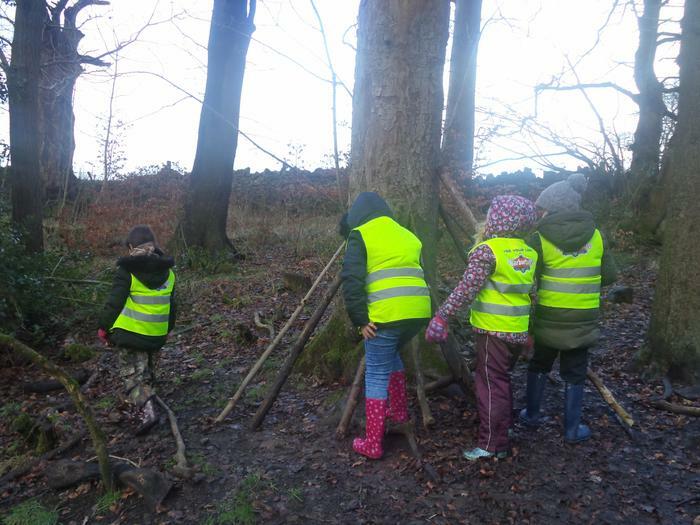 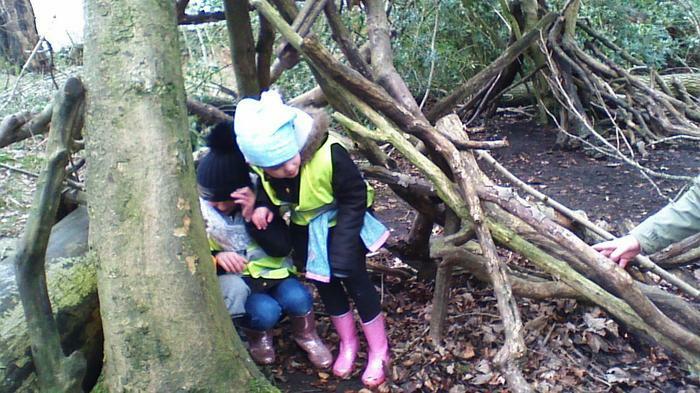 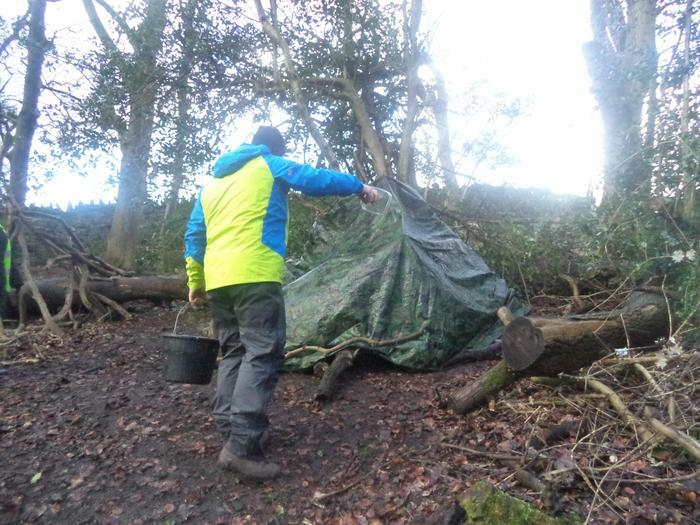 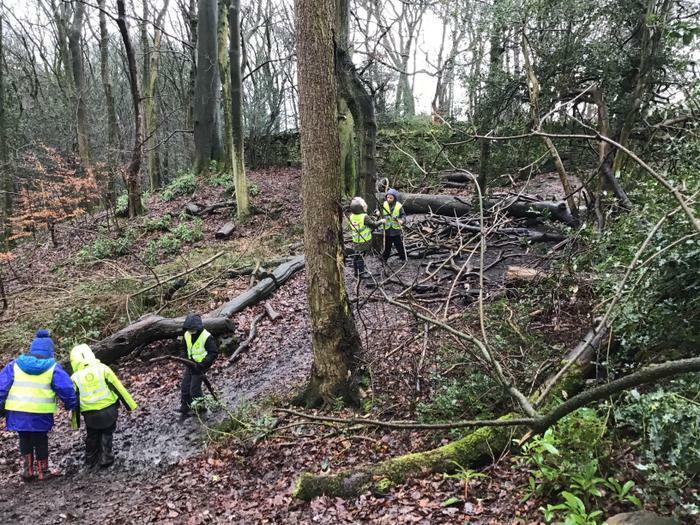 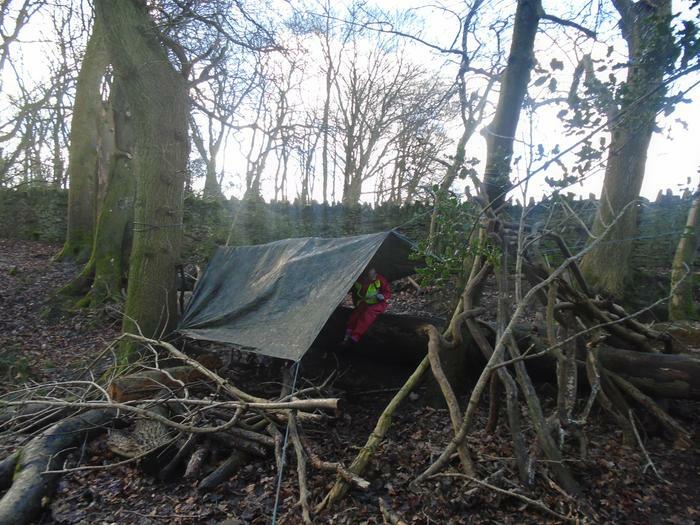 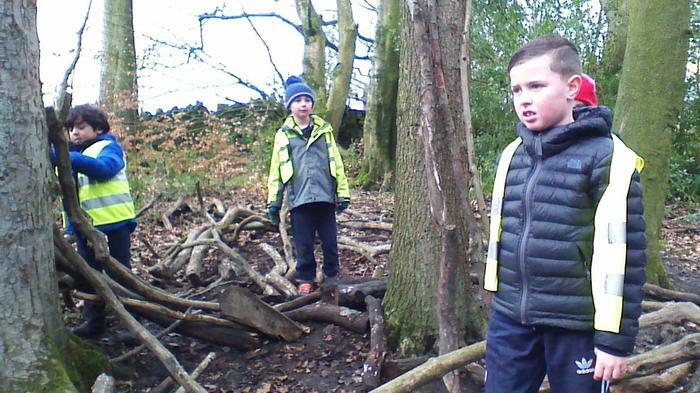 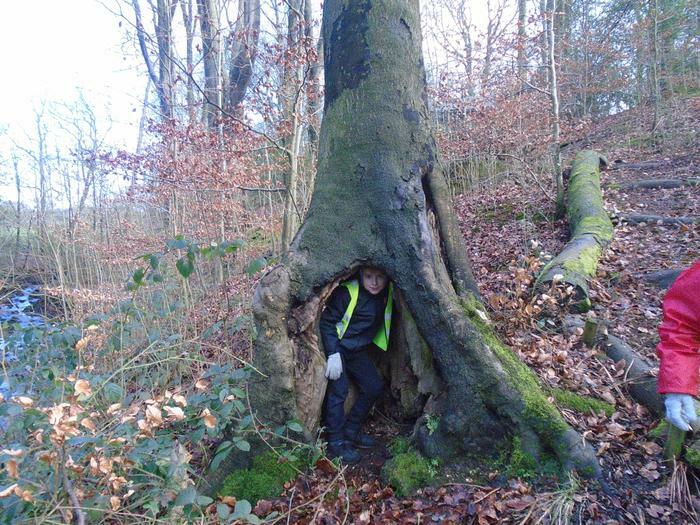 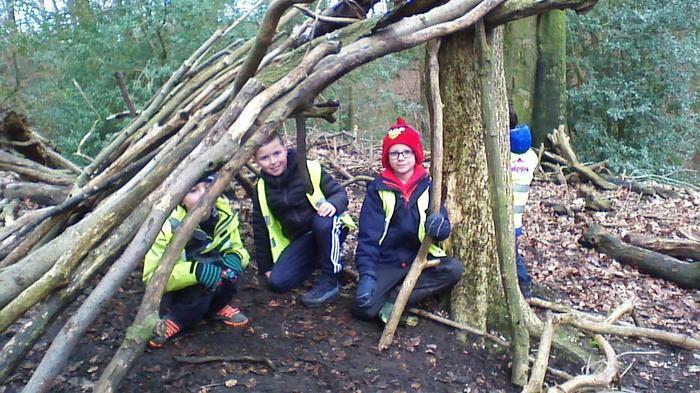 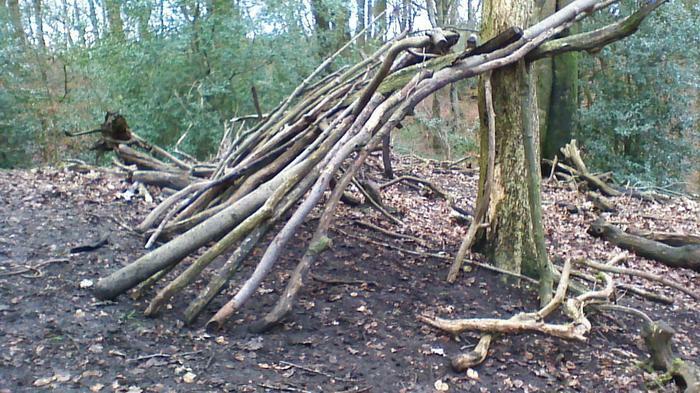 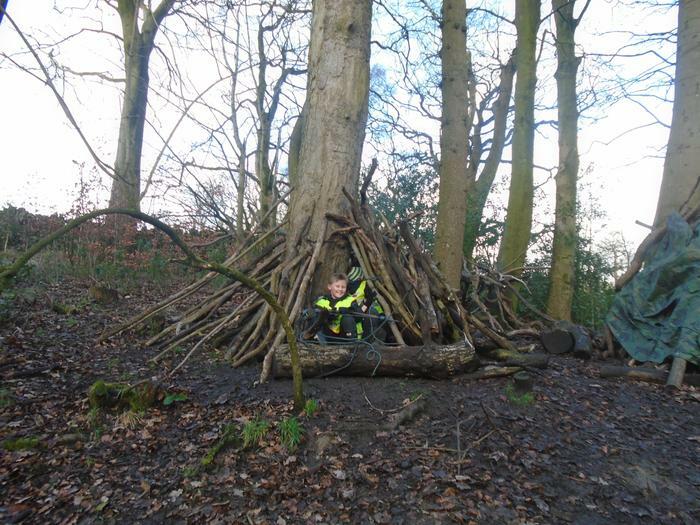 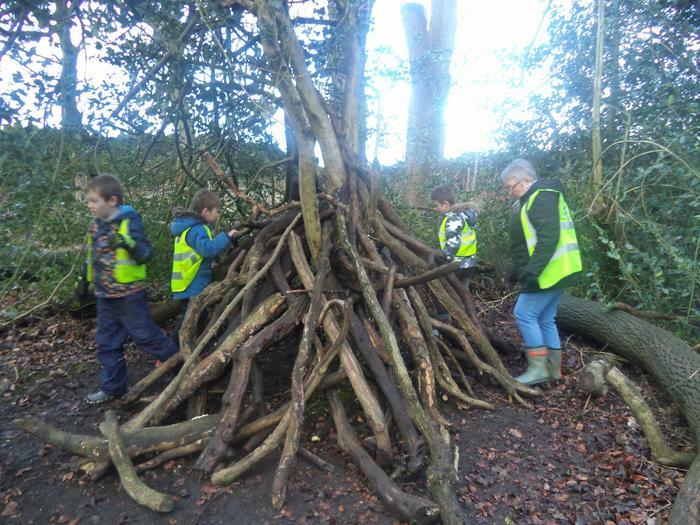 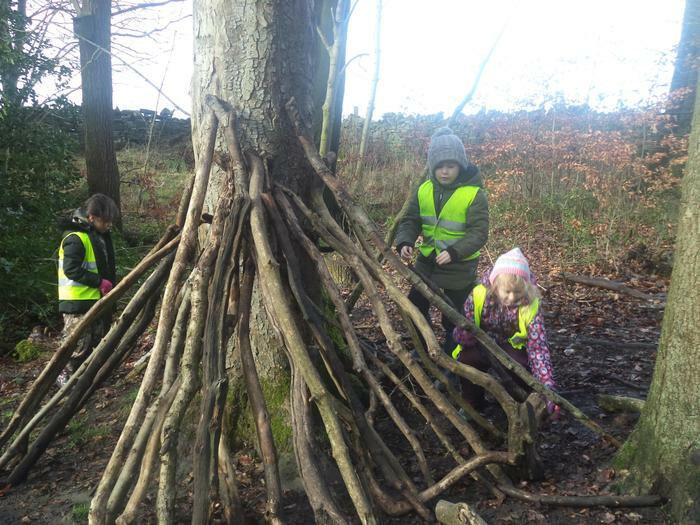 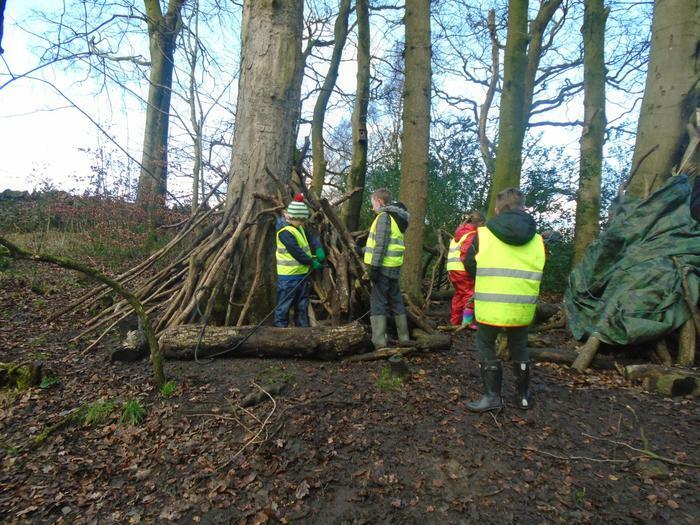 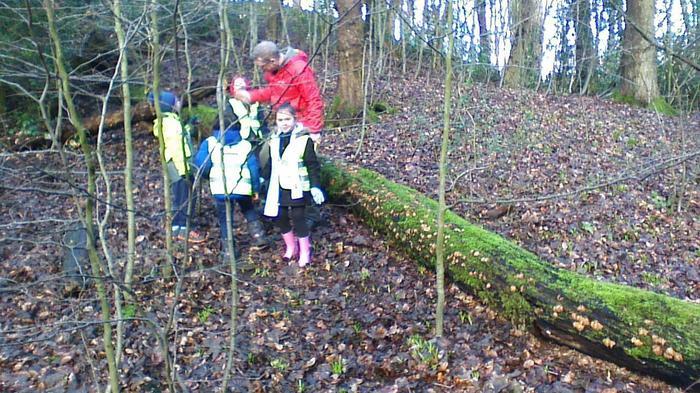 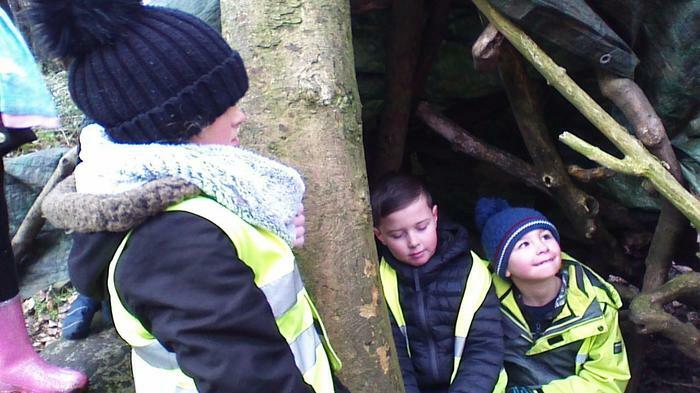 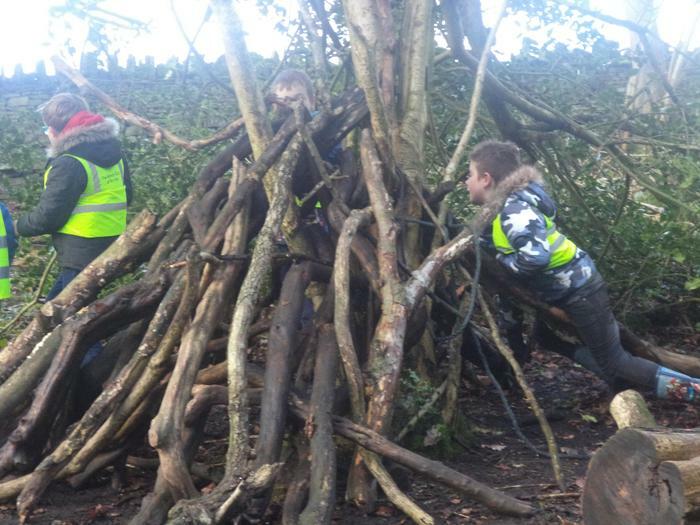 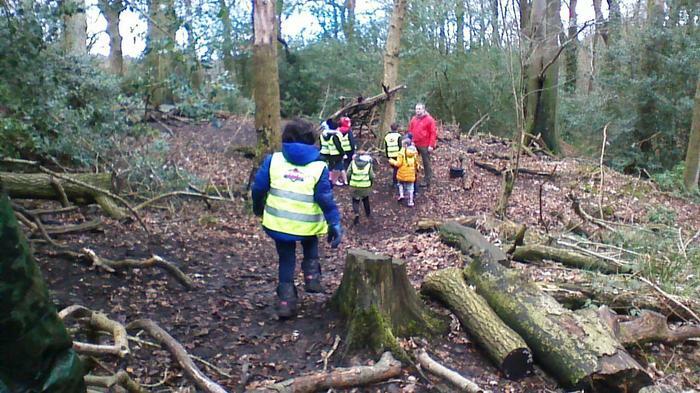 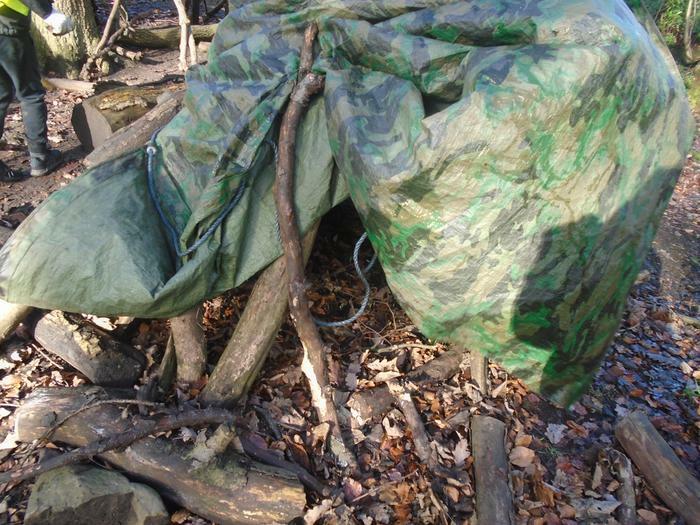 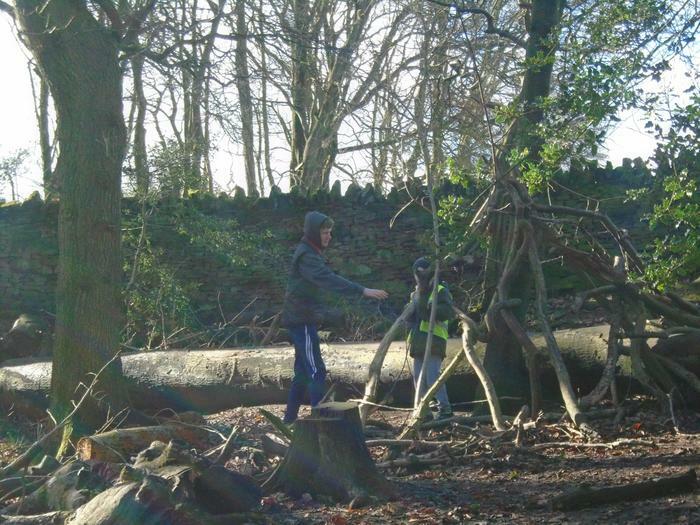 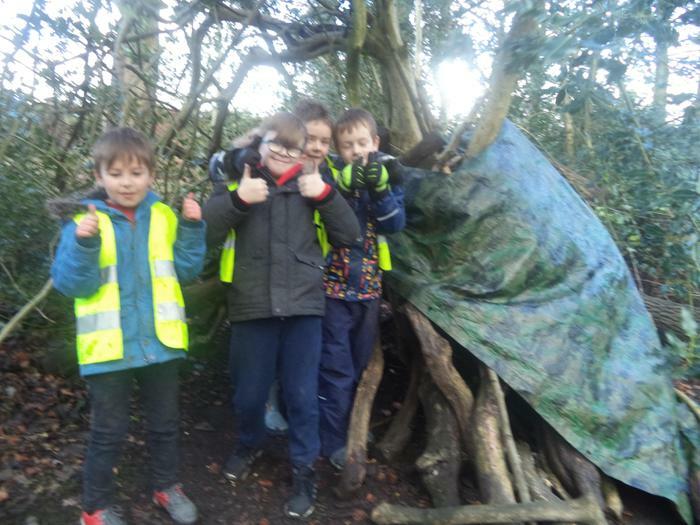 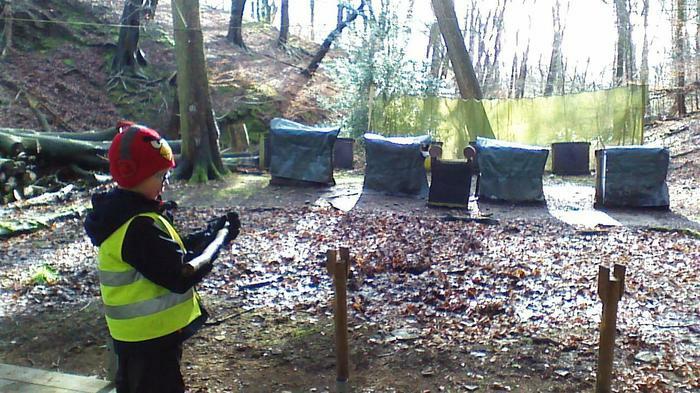 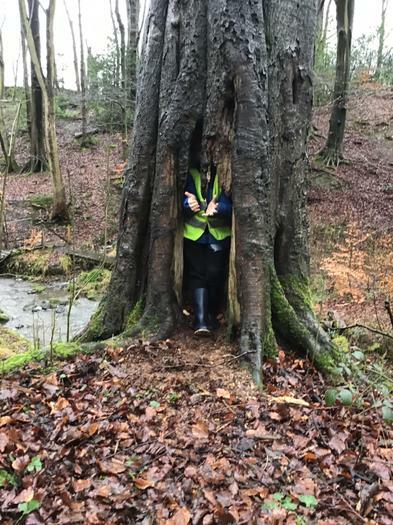 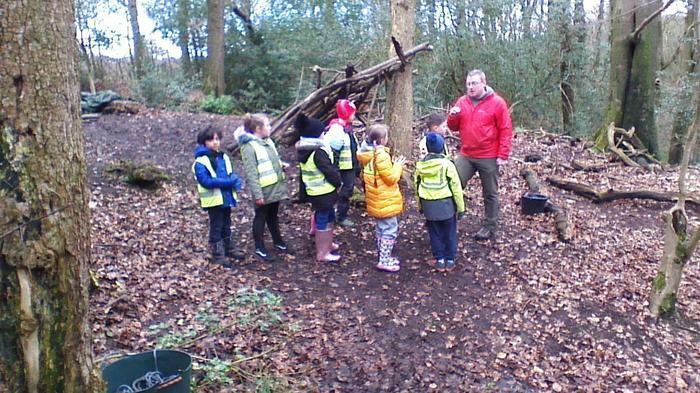 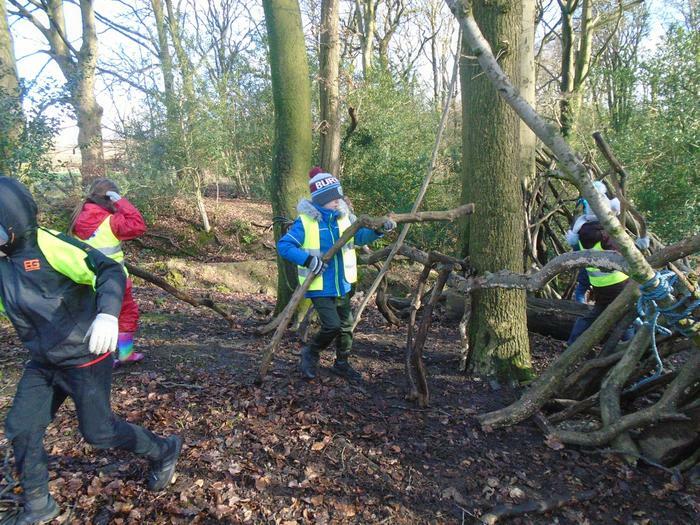 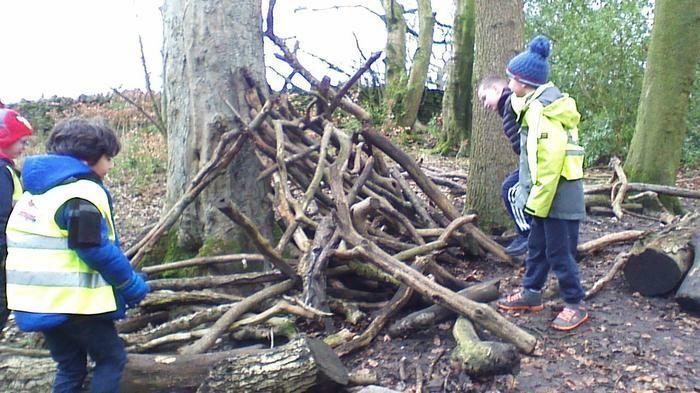 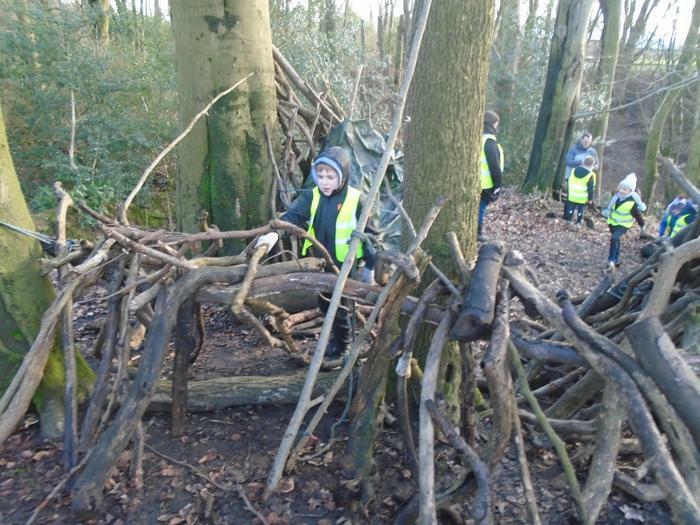 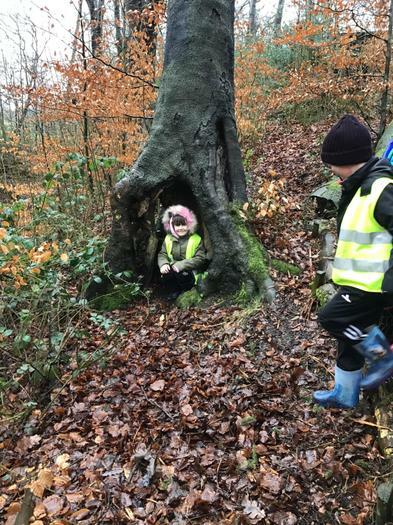 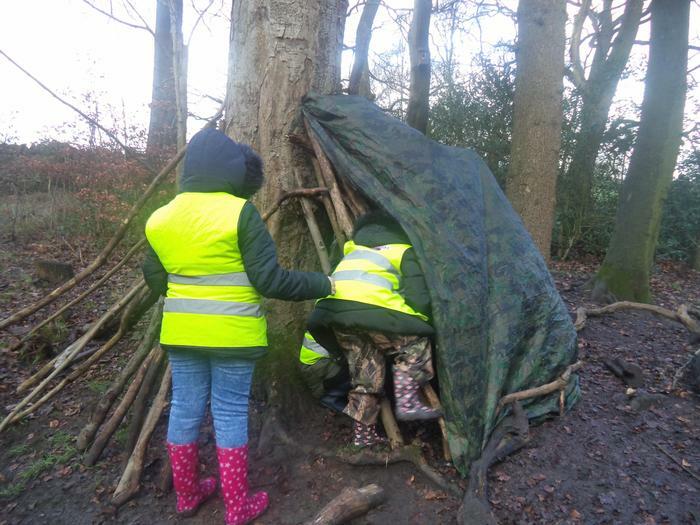 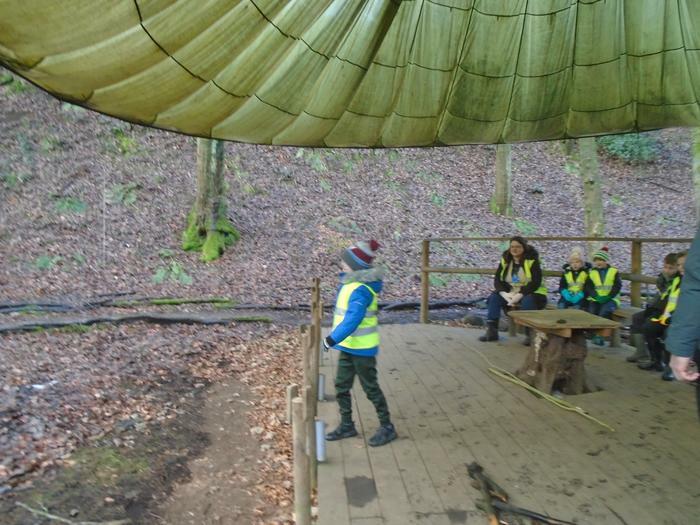 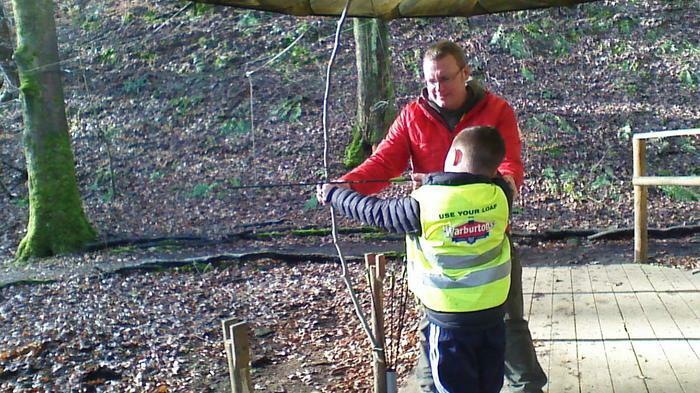 Despite the cold weather, we had a great time building a shelter in the woodland and testing whether it was waterproof. 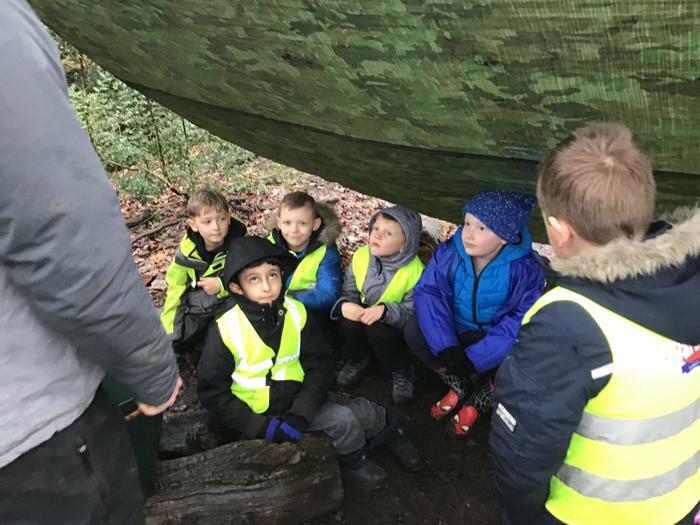 The children in 3G were brilliant as they continued to build through the torrential downpour. 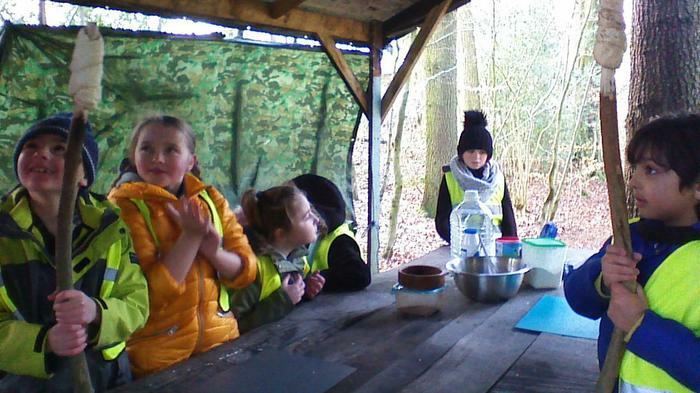 By lunch time, some of us were starving! 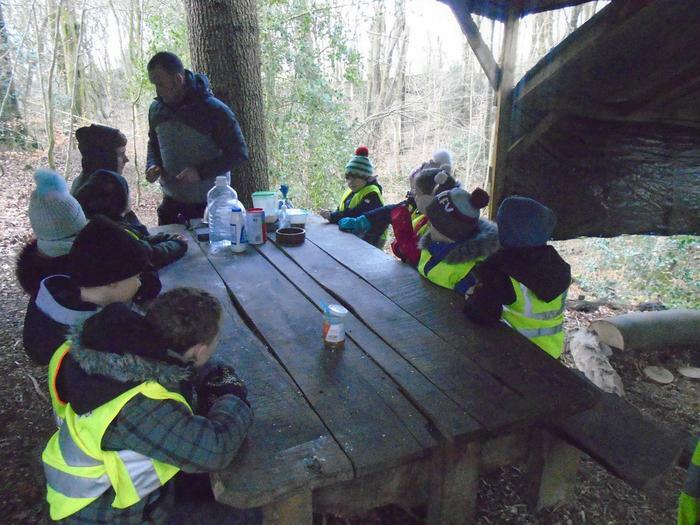 Luckily, we didn’t have to hunt for food and had our packed lunches. 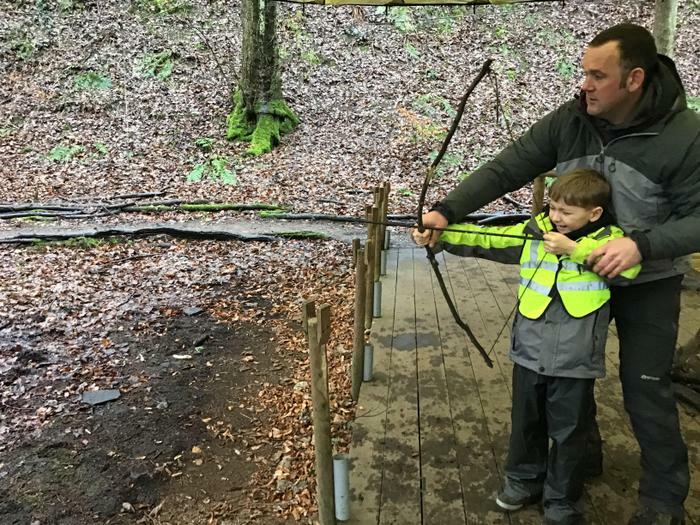 Unfortunately, it took us a while making our own spear and bow and arrow. 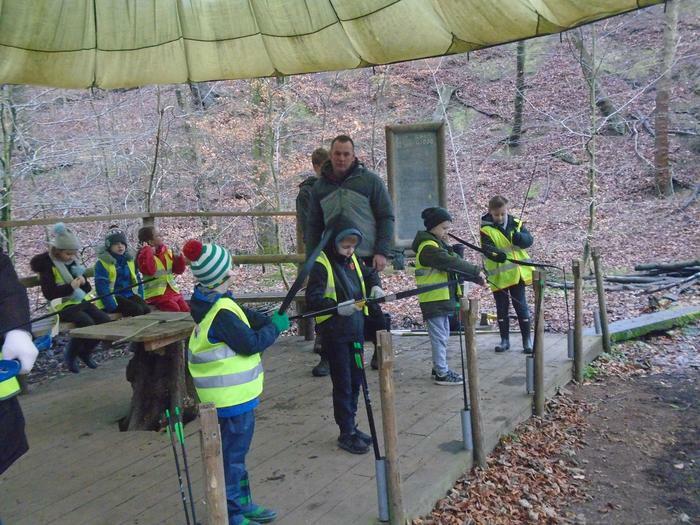 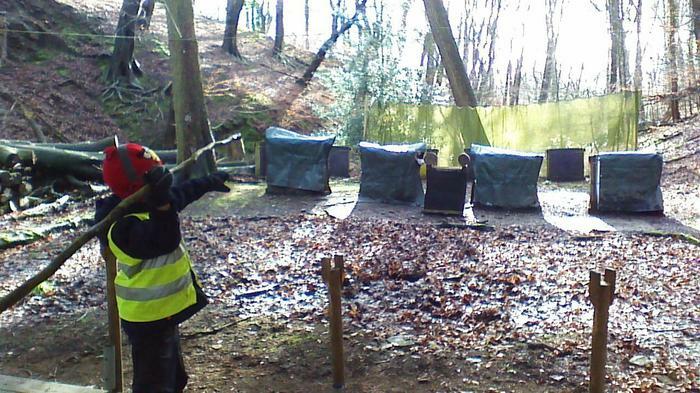 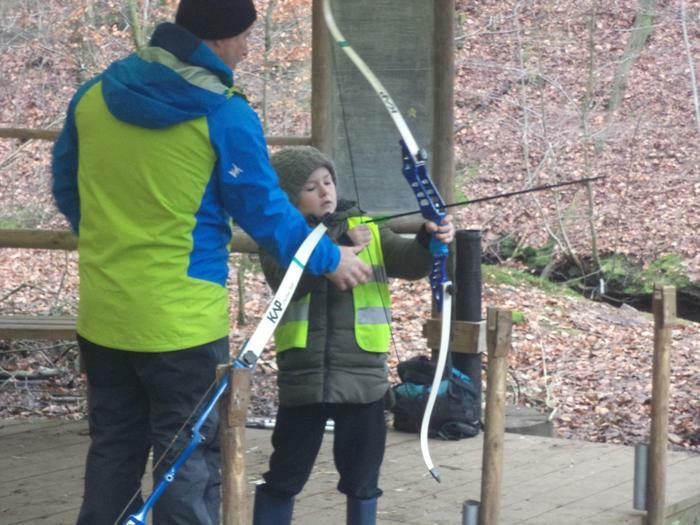 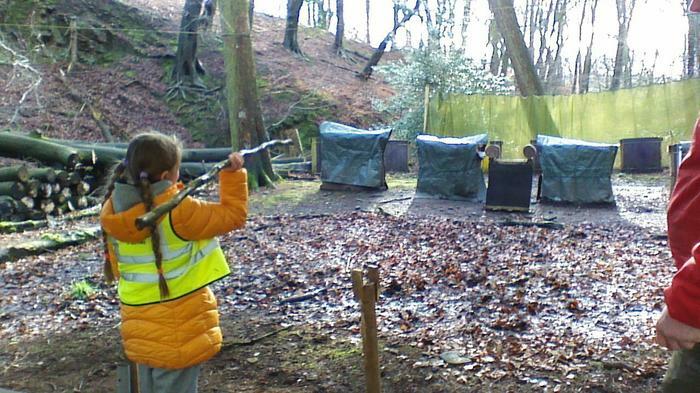 When we were finally prepared, it was tricky hitting the target but our aim improved with more practise. 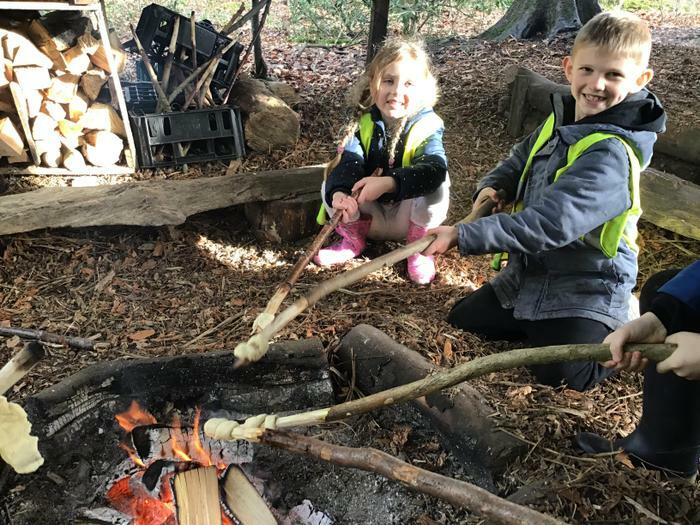 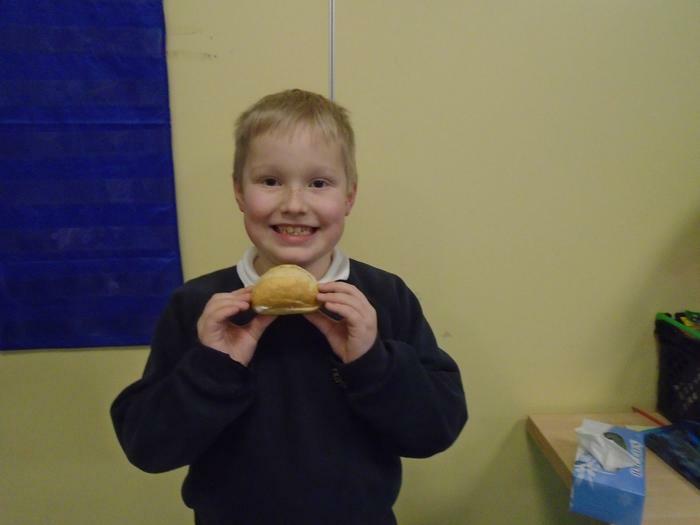 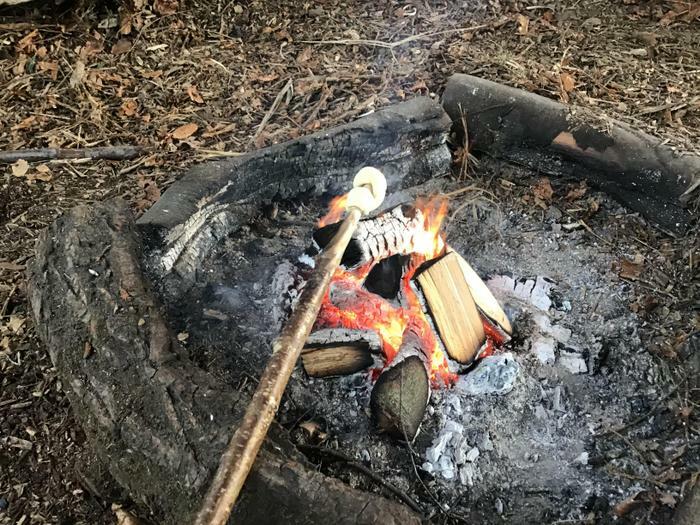 We cooked flavoured bread over a fire and were surprised at how good it tasted. 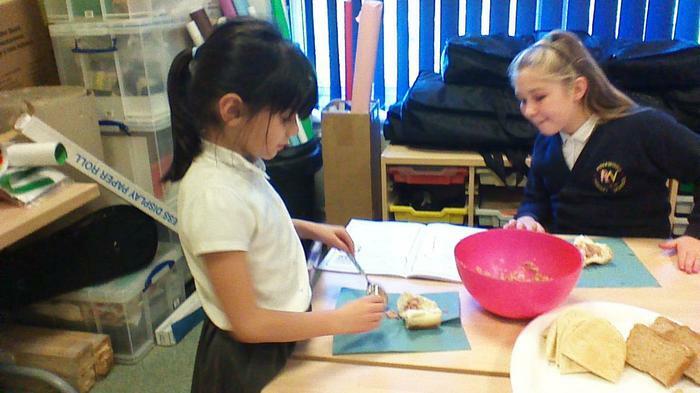 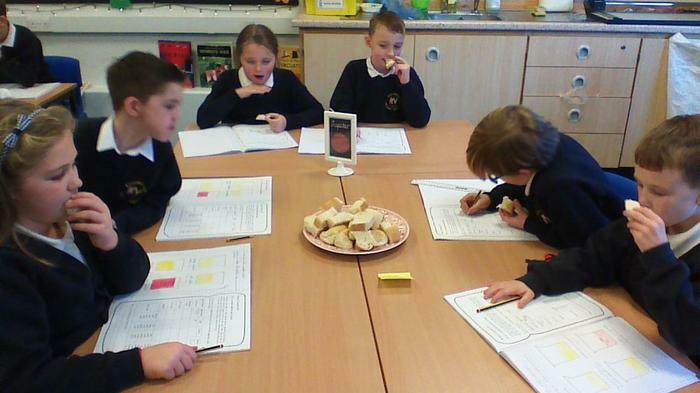 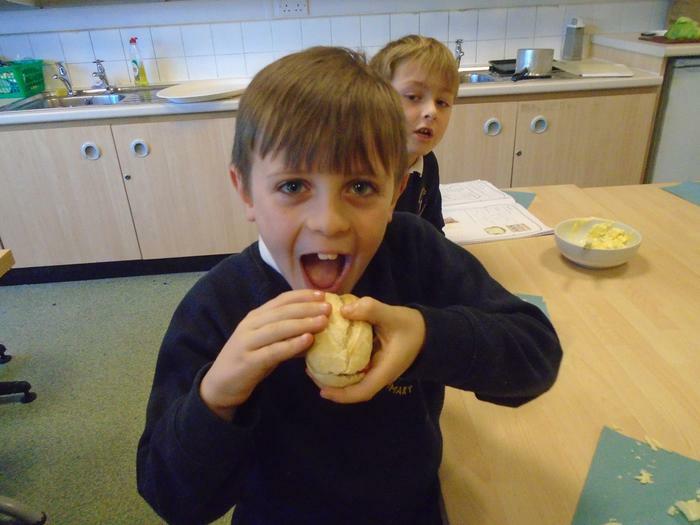 We discovered life in the Stone Age was challenging and are glad that we have supermarkets to buy food instead! 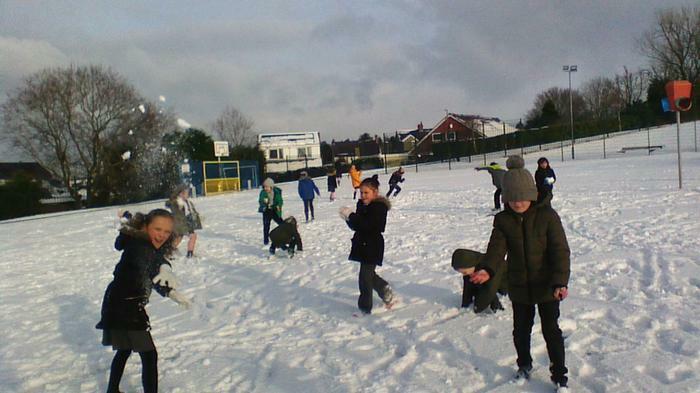 After a week of wet play times, we were eager to get outside in the snow. 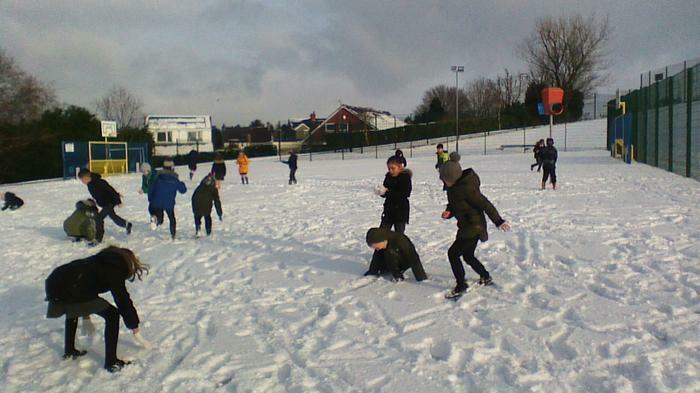 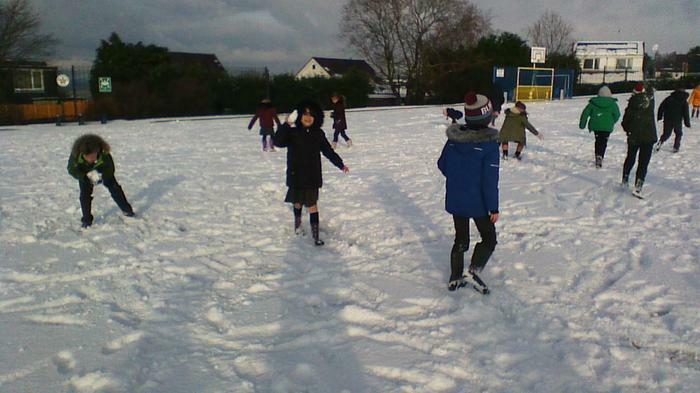 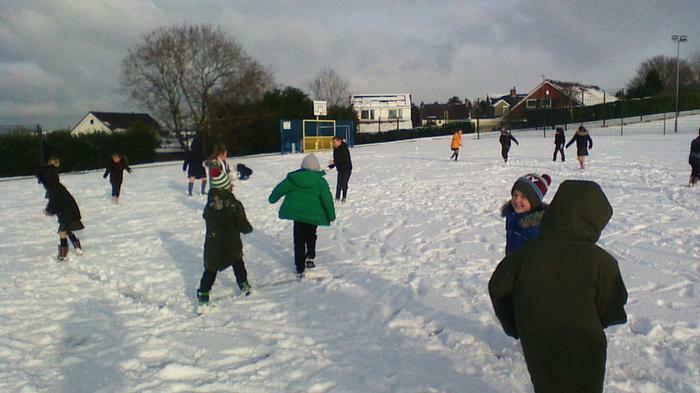 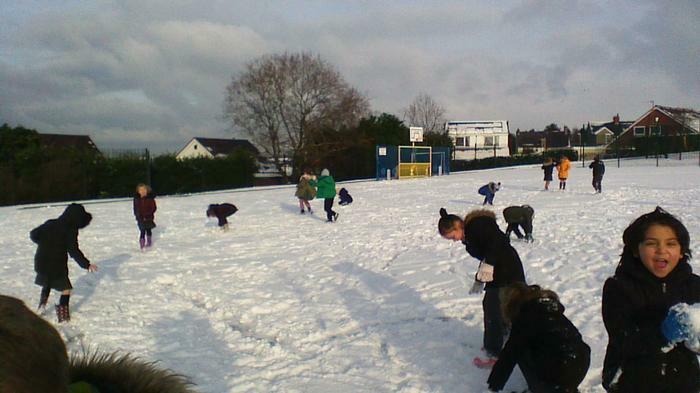 We had a great time making snowballs and aiming them accidentally at teachers. 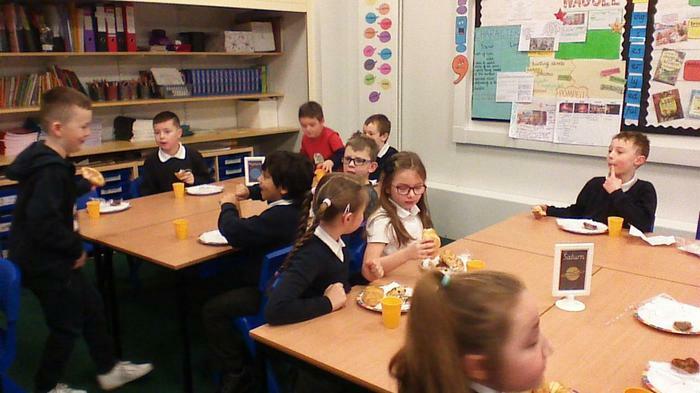 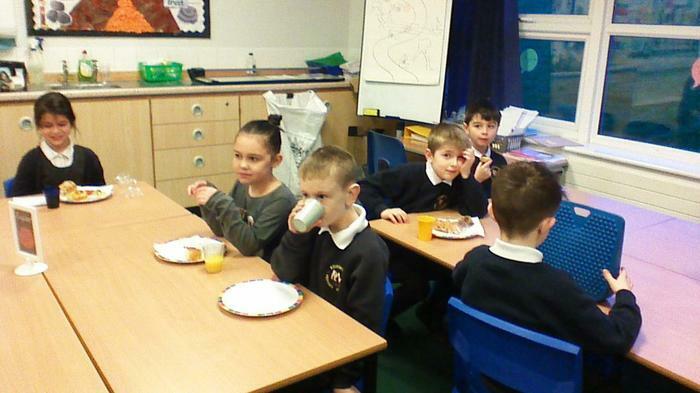 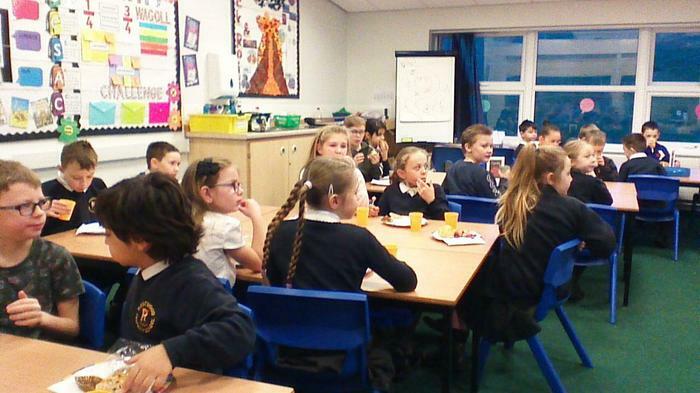 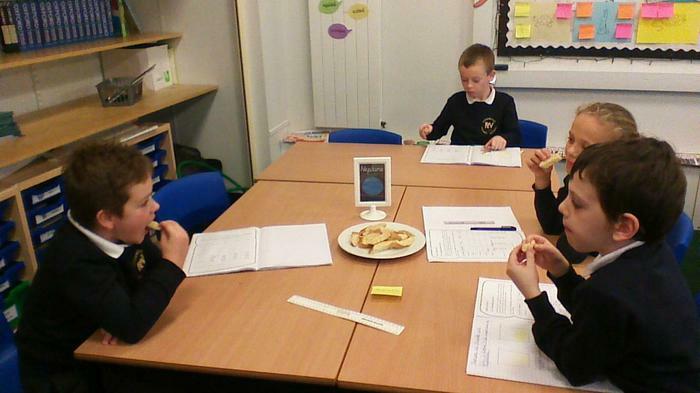 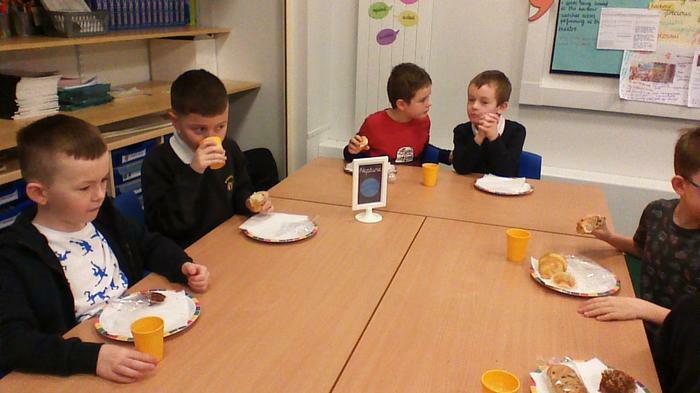 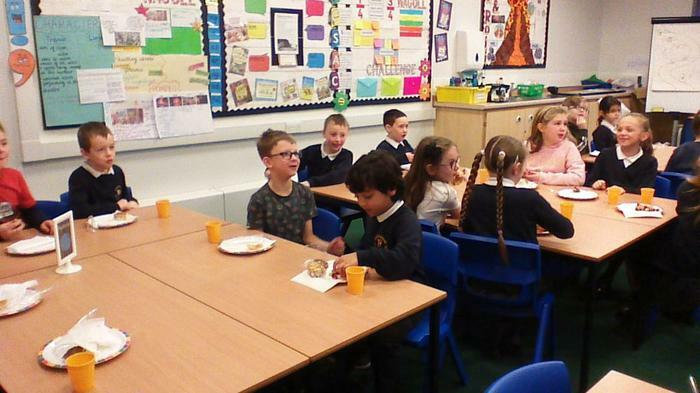 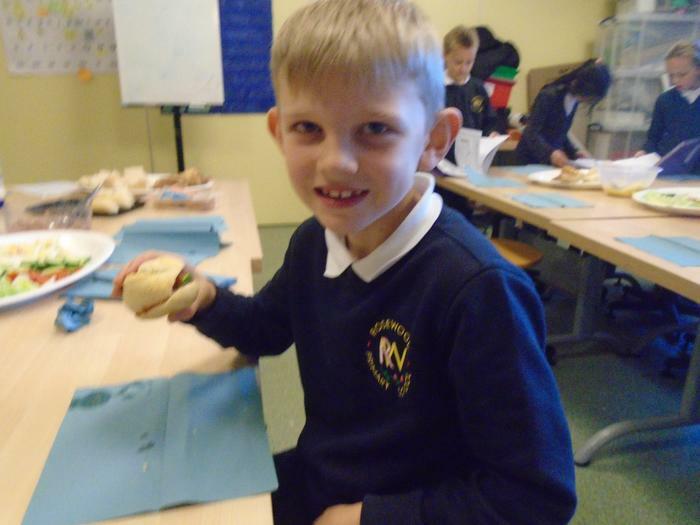 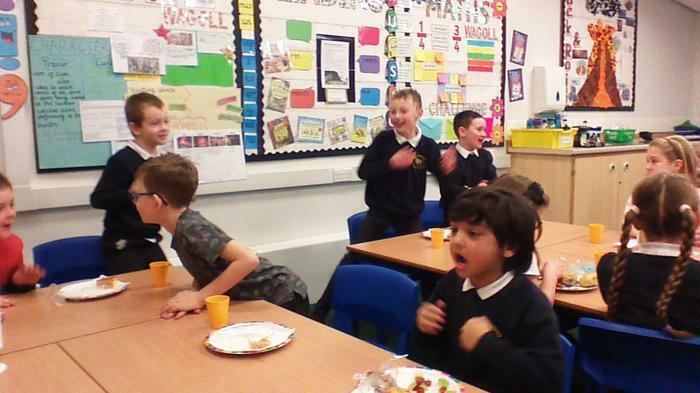 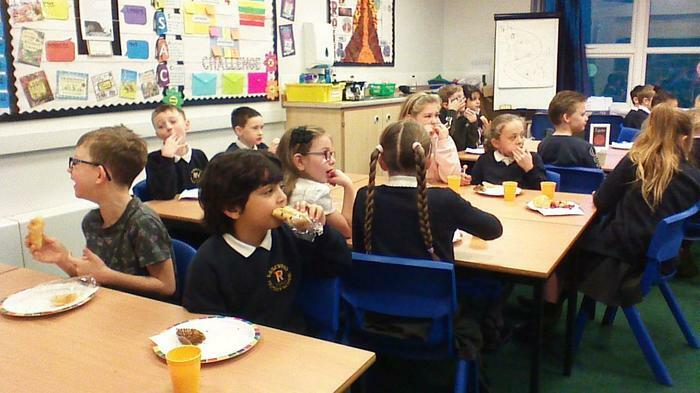 3A were treated to a VIP breakfast for achieving the best attendance throughout school for the Autumn Term. 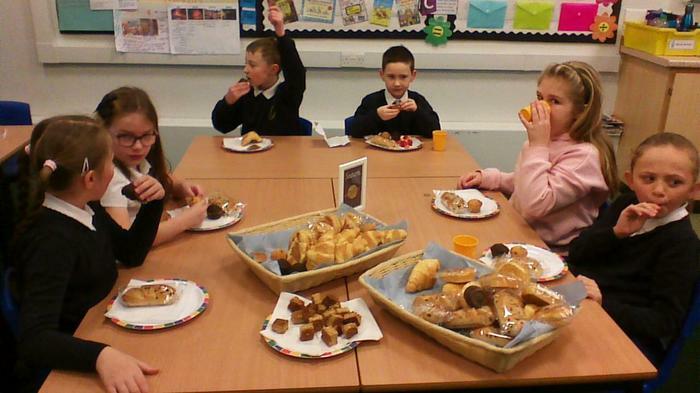 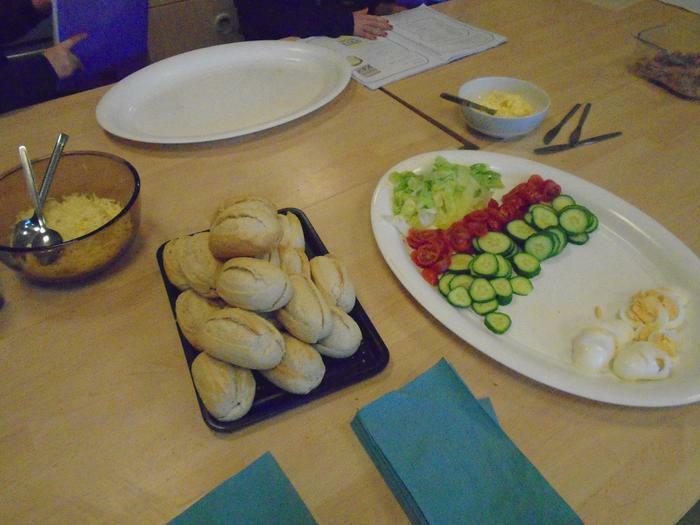 The children were treated to pastries, fresh fruit, breakfast muffins and juice. 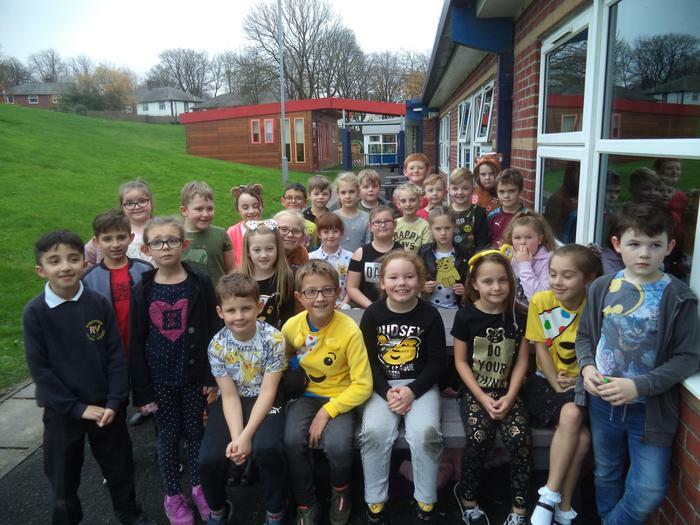 Keep up the super attendance 3A! 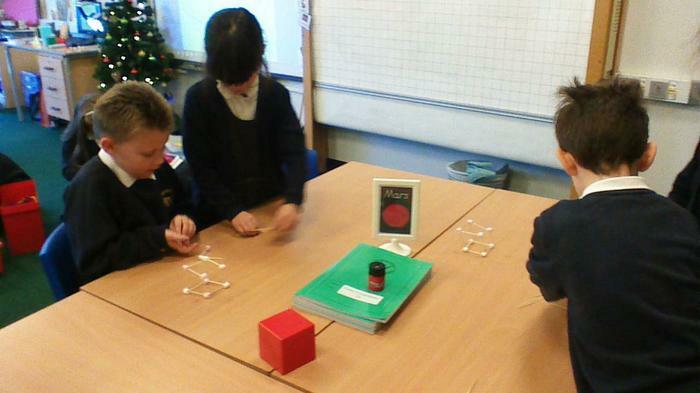 In Year 3, we have been finding, identifying and counting vertices, edges and faces in 3D shapes. 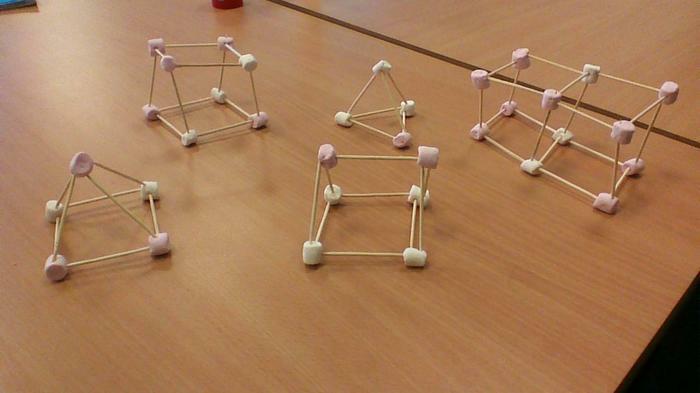 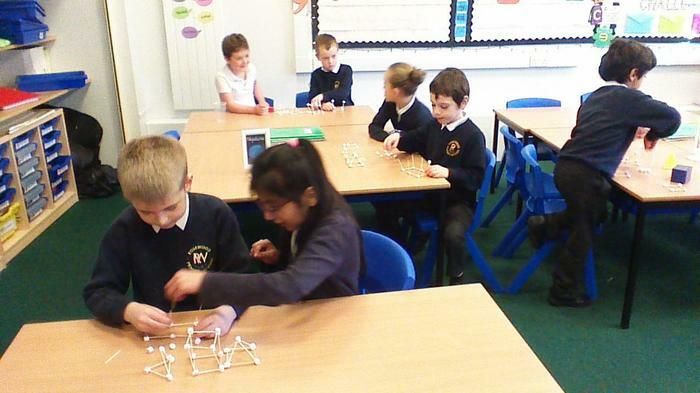 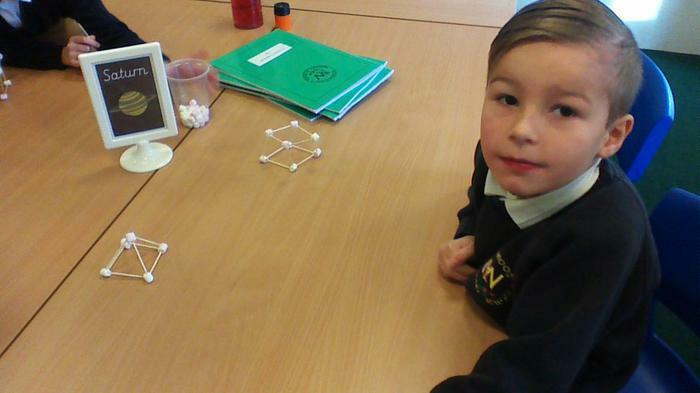 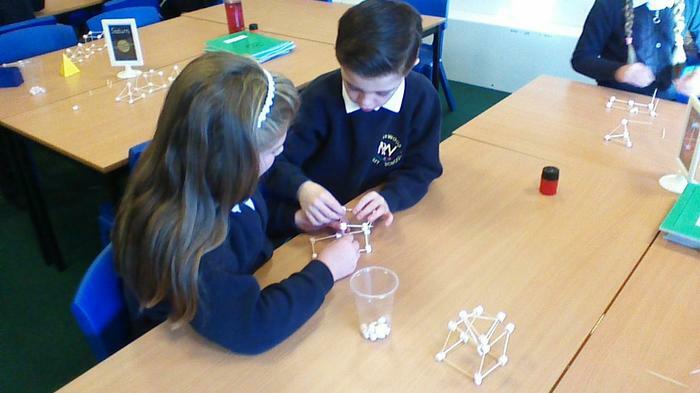 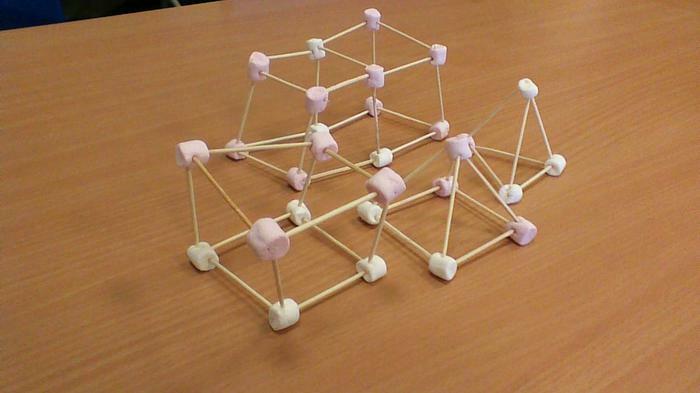 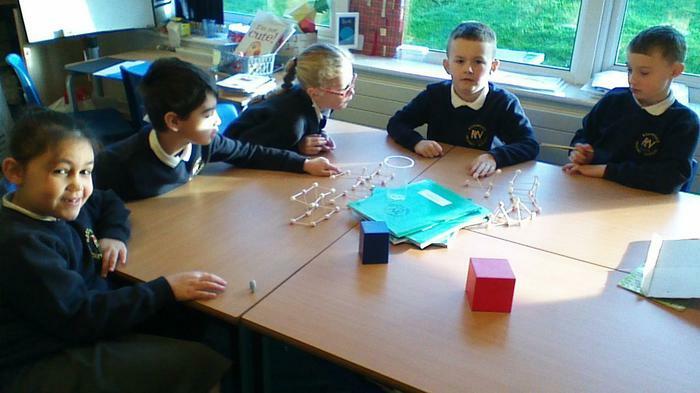 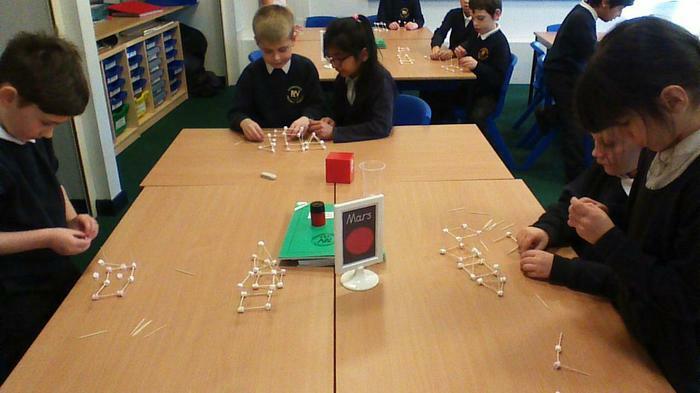 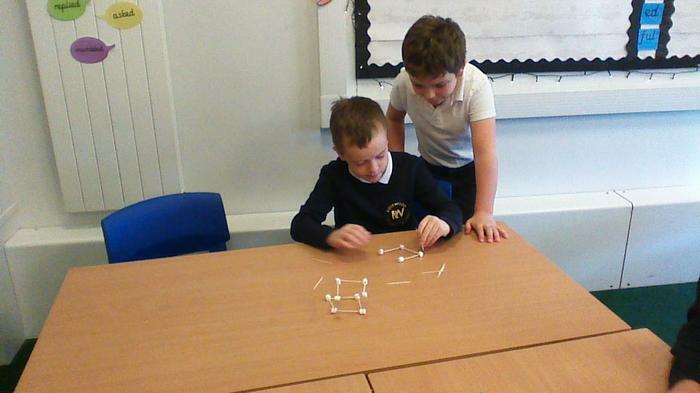 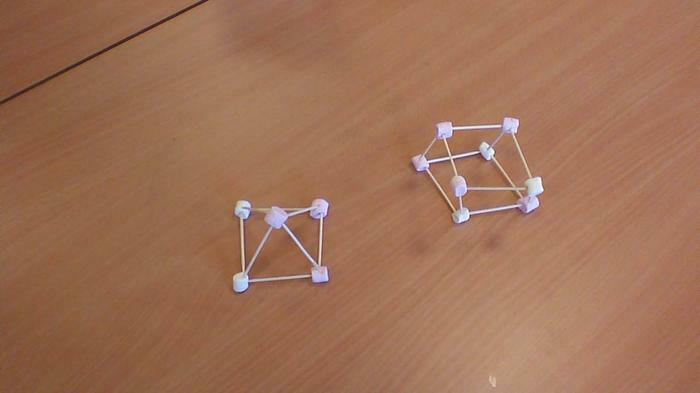 We have been trying to make 3D shapes using cocktail sticks and marshmallows. 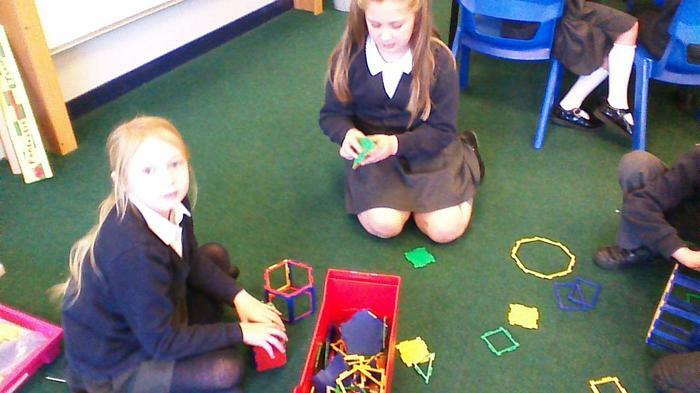 Which shapes can you spot? 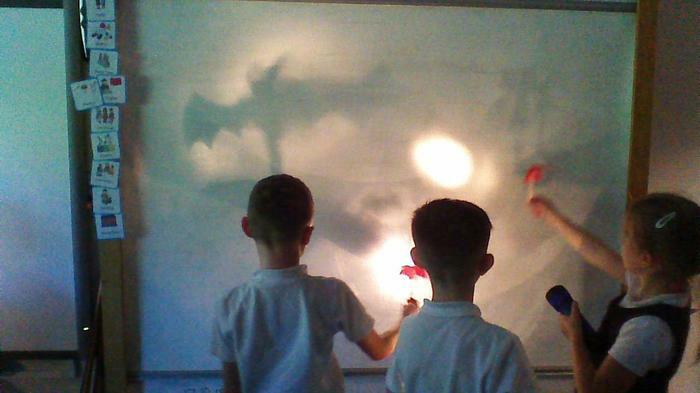 As part of our topic, The Great Plague, Year 4 have looked at various artists who have studied skulls. 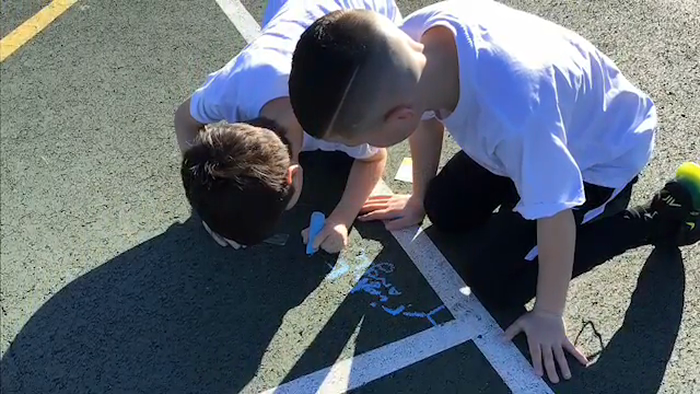 Artists included: Escher and Jean Basquiat. 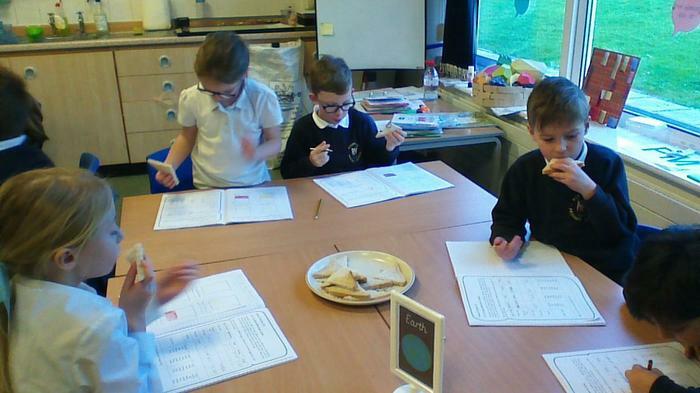 We practised drawing skulls looking closely at the proportion of features. 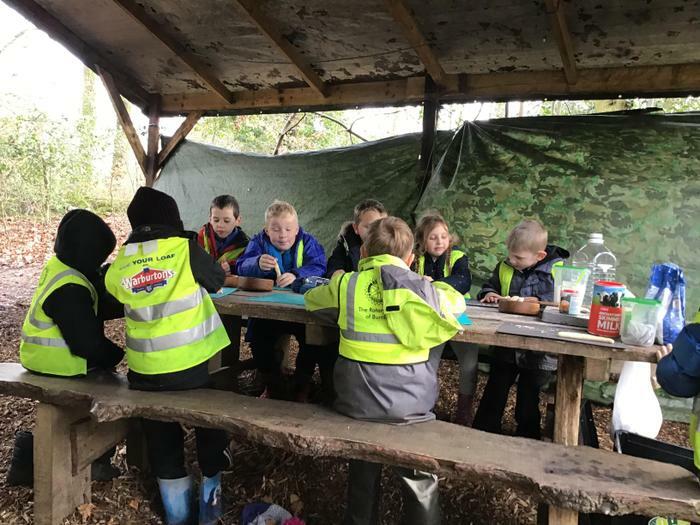 Once we were happy with our drawing skills, we looked at different media, including: oil pastels, charcoal, pencil crayon and wax crayon. 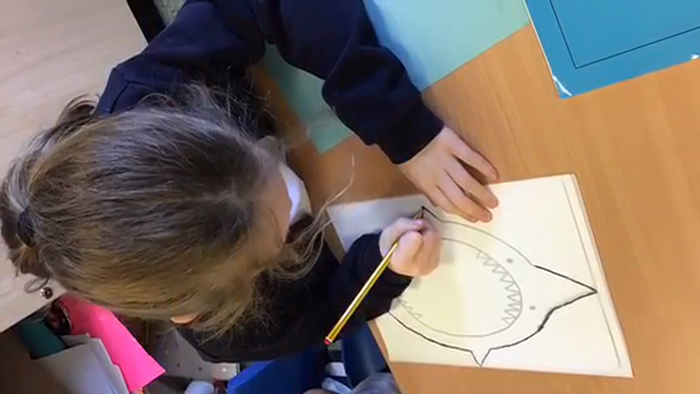 Finally, we drew a skull with our favourite artist in mind. 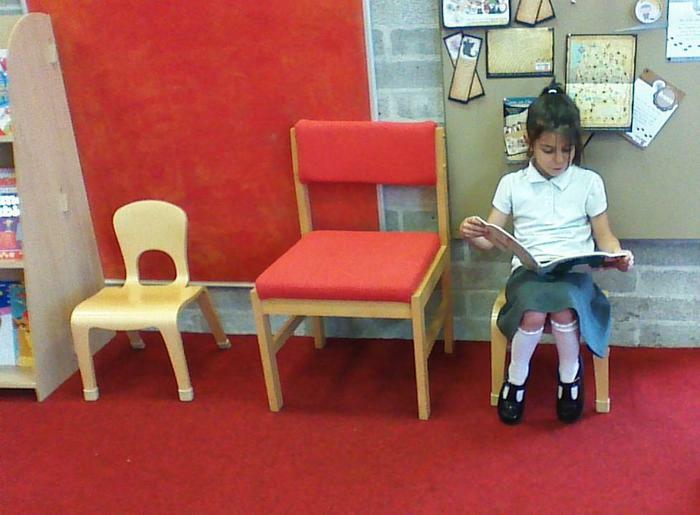 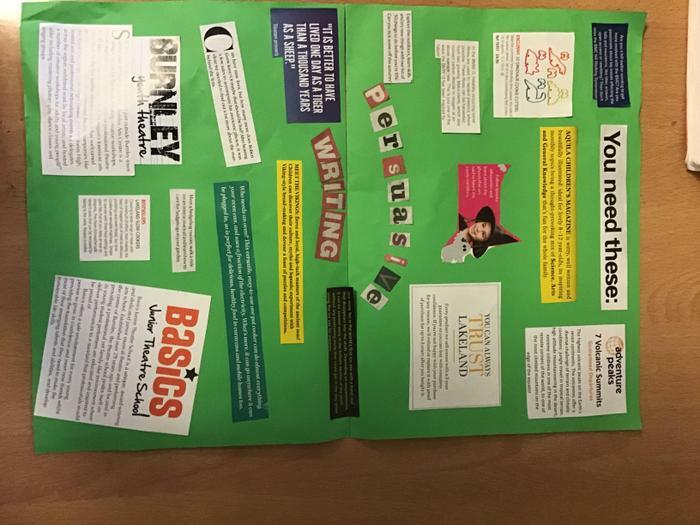 We chose our favourite media and applied colour. 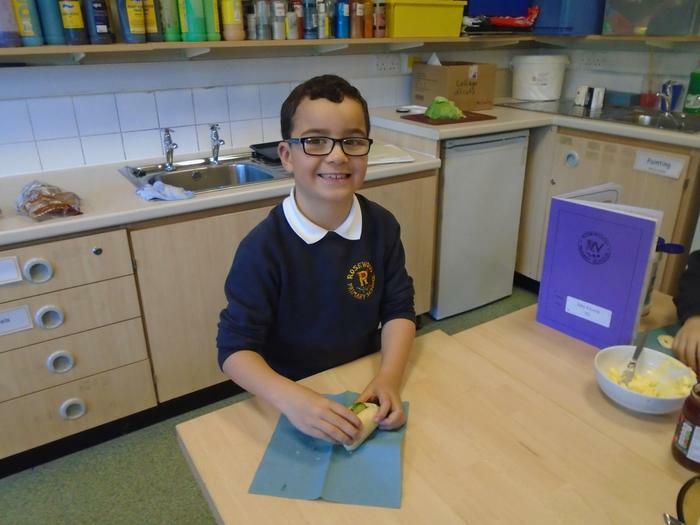 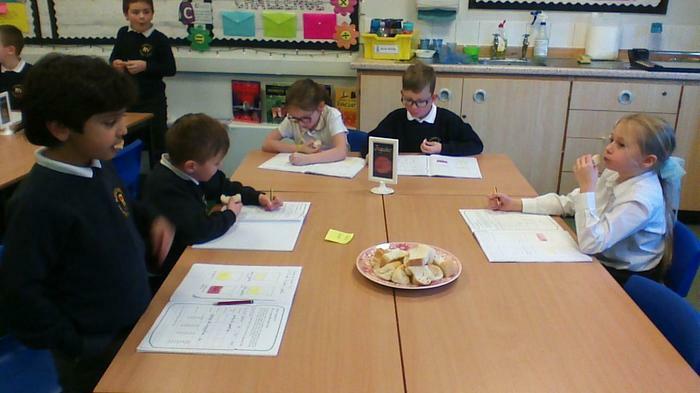 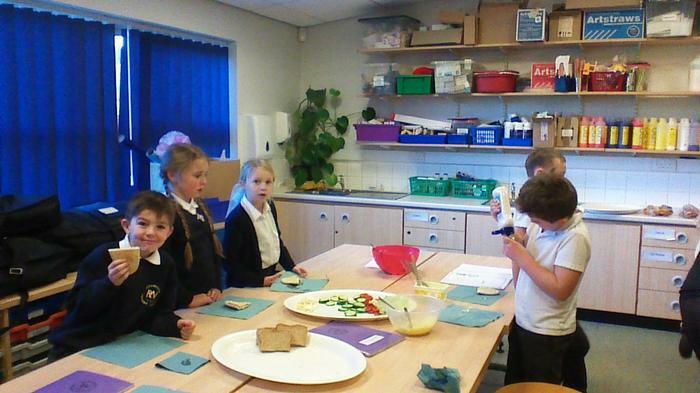 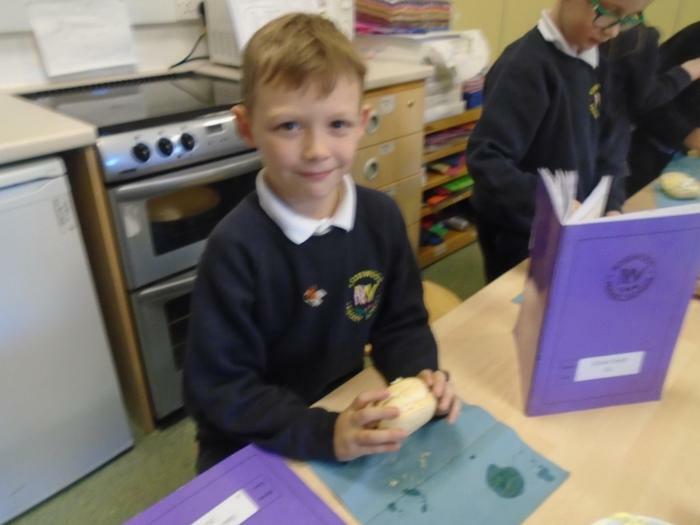 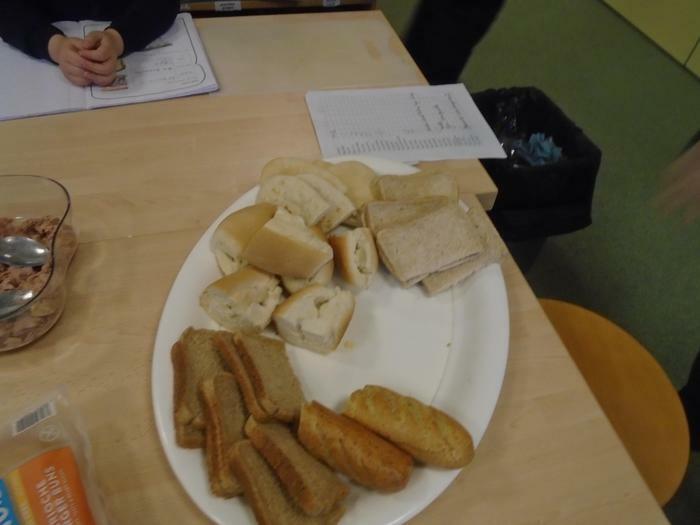 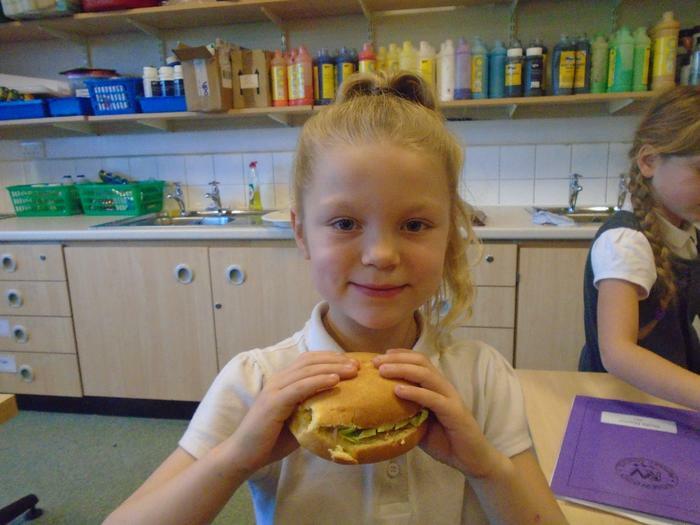 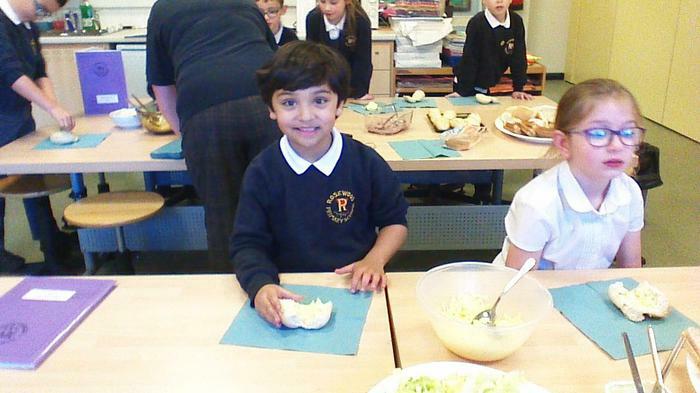 In science, Year 3 have been learning about healthy lifestyles. 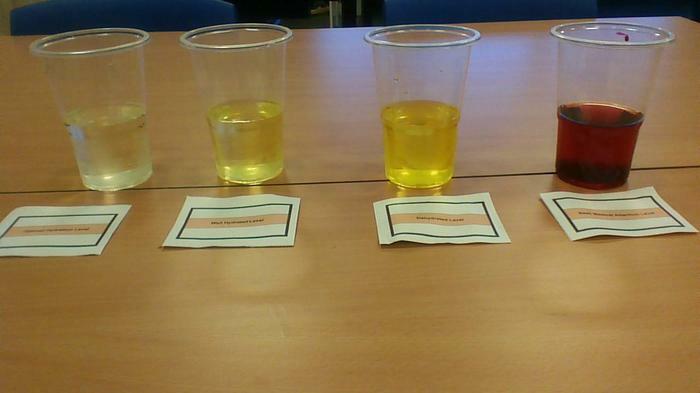 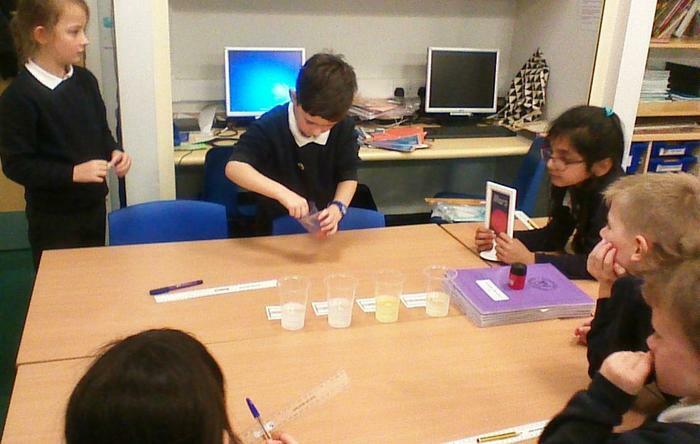 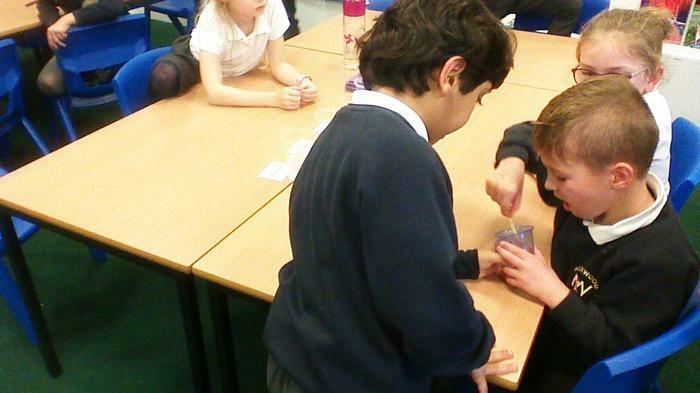 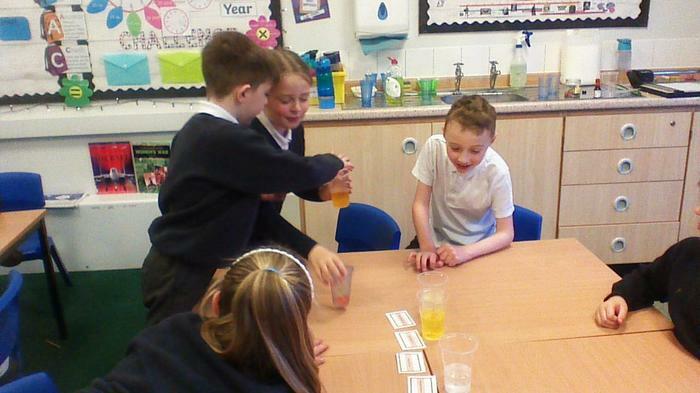 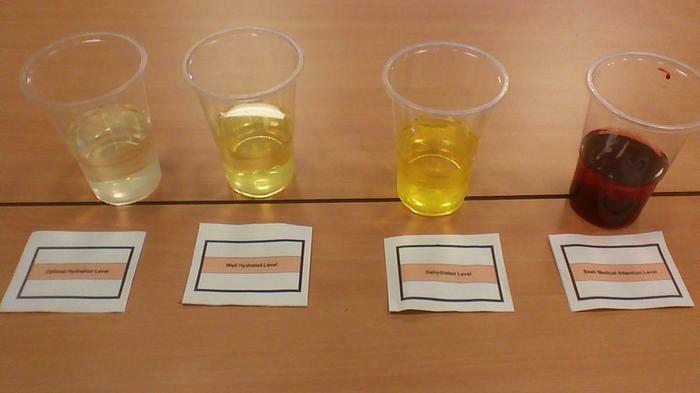 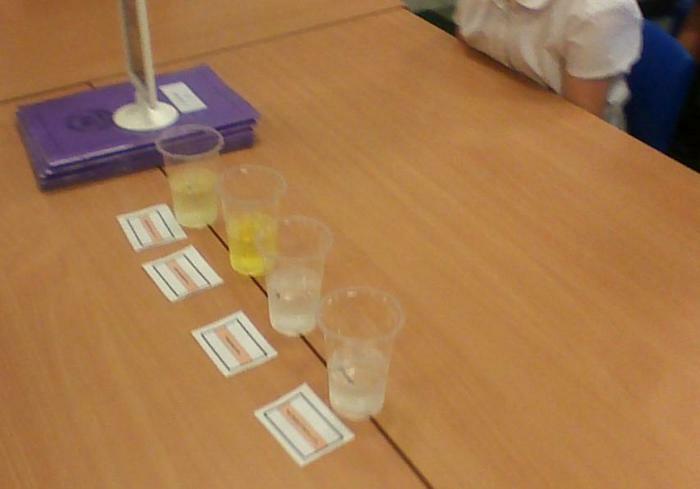 We enjoyed investigating the importance of hydration by creating pretend urine samples using water and food colouring. 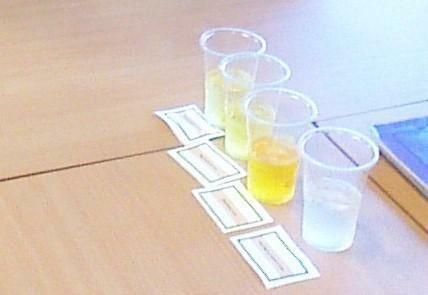 The samples we made show different levels of hydration including optimal hydration, well-hydrated, dehydrated and seek medical attention. 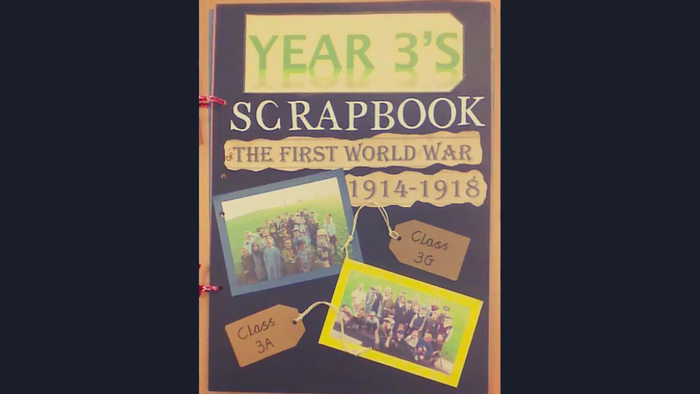 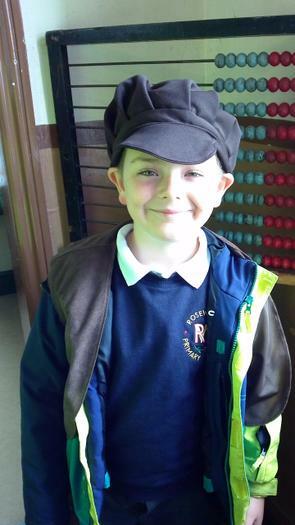 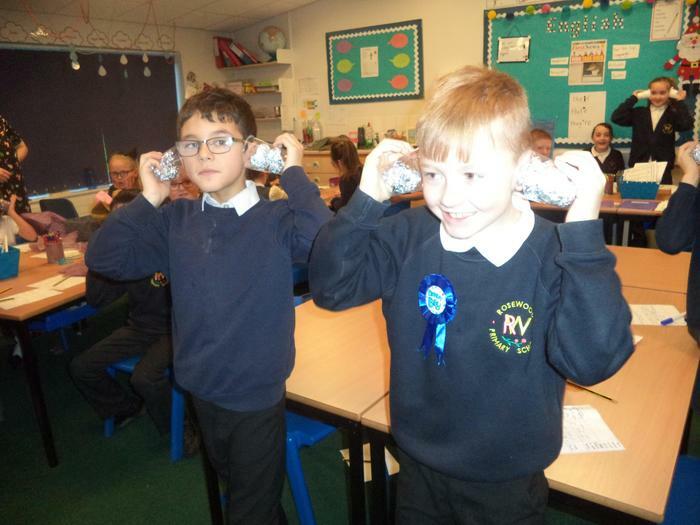 During Remembrance Week, Year 3 have had a fascinating time exploring different aspects of World War I. 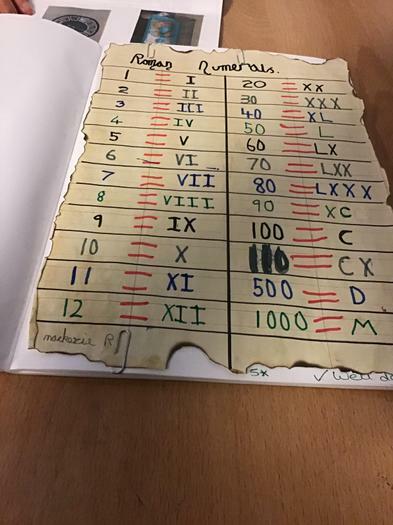 We have taken on the role of the Secret British Intelligence Unit and intercepted and decoded messages outlining the German strategy for the war. 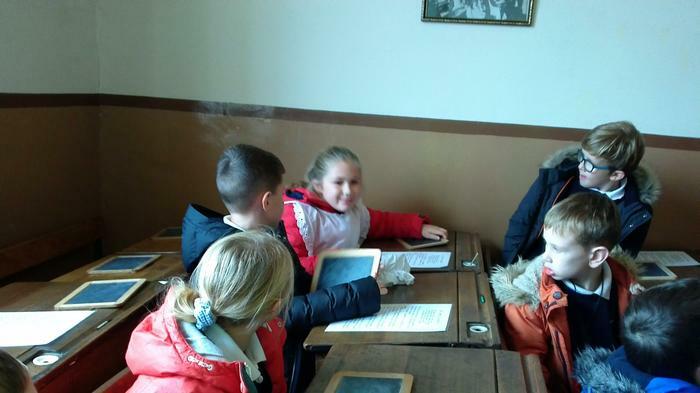 Throughout the week, we have also written letters to the Unknown Soldier, explored life in the trenches and re-enacted and reported on the events of the Christmas Truce. 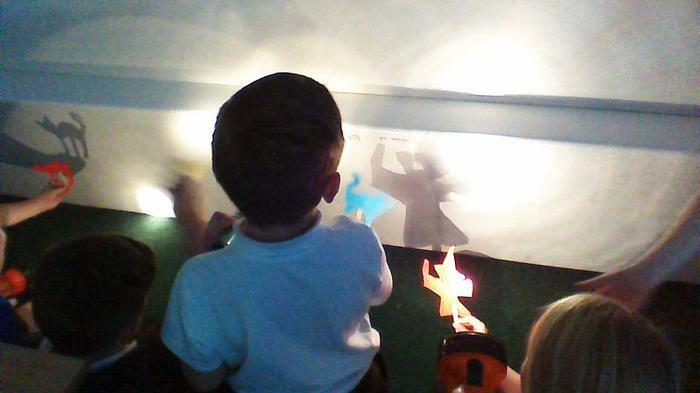 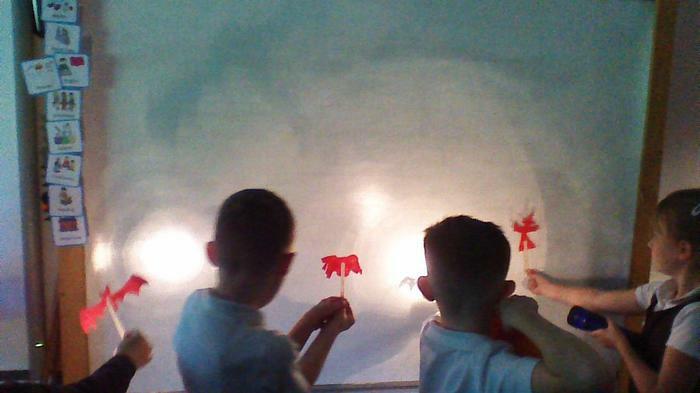 We also enjoyed creating silhouette art showing soldiers from the Great War. 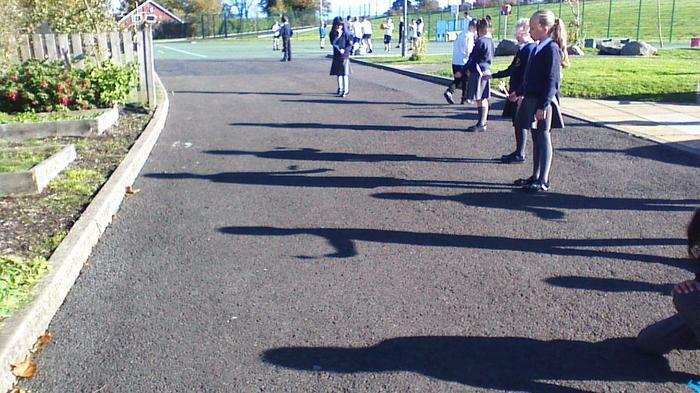 We would like to share with you our tribute to the fallen soldiers who sacrificed their lives for their country. 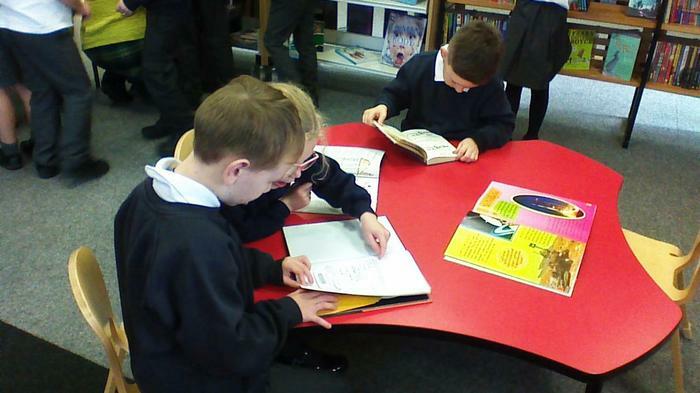 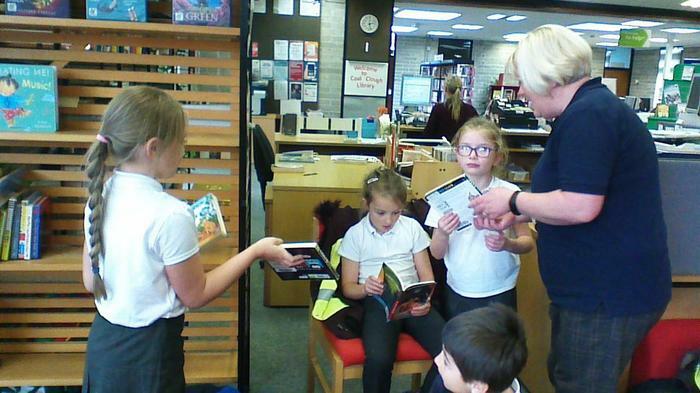 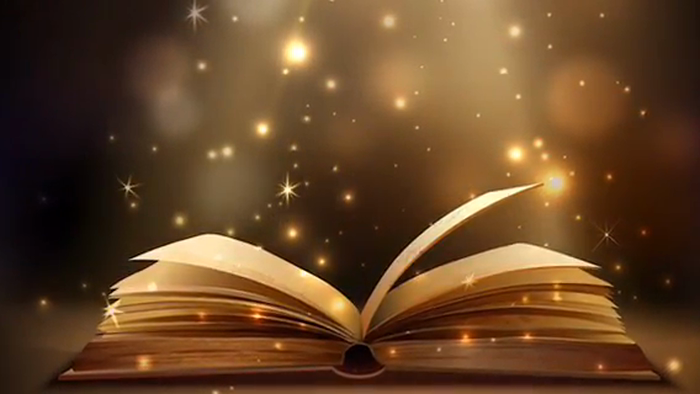 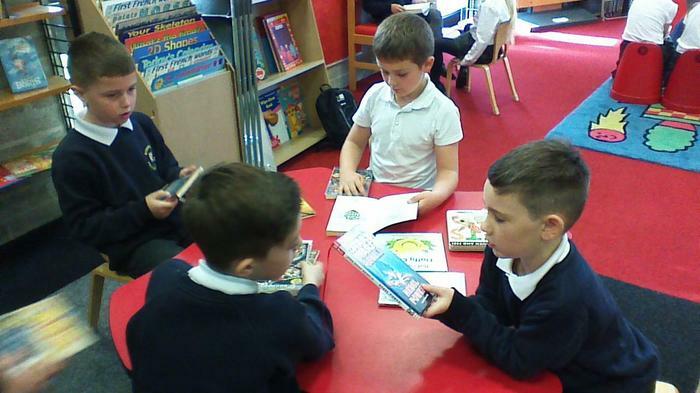 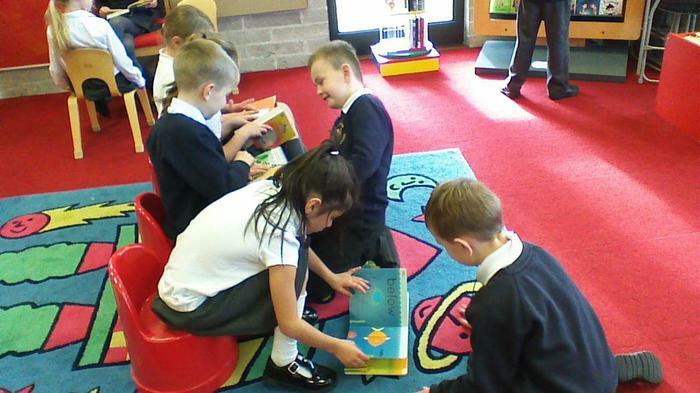 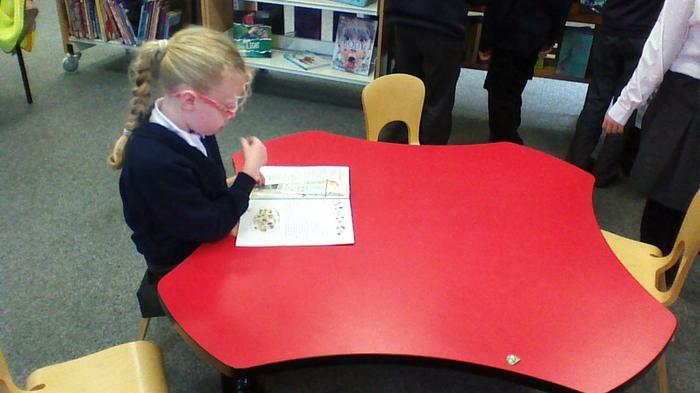 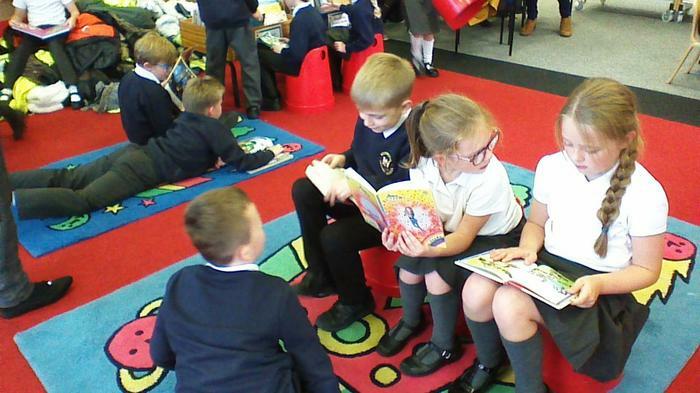 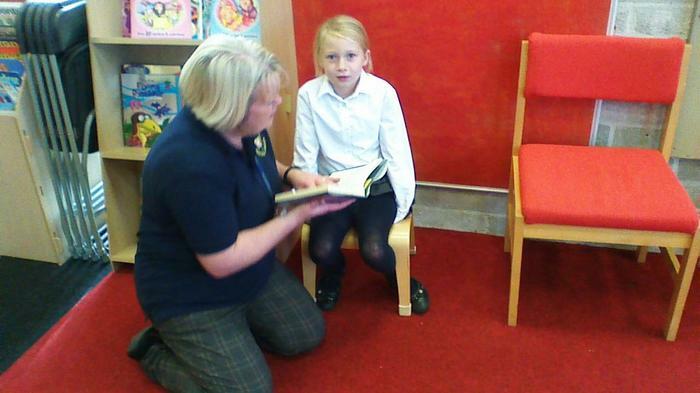 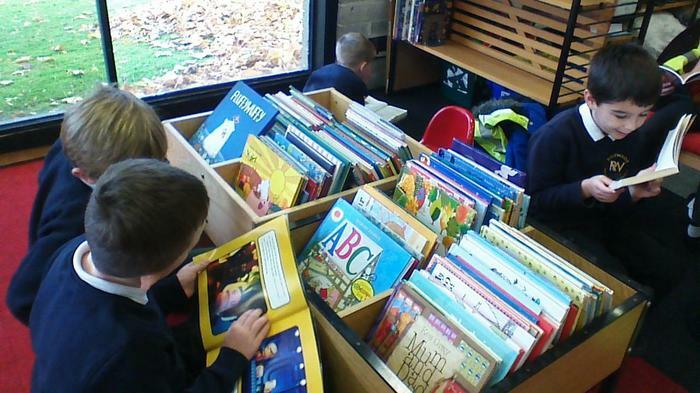 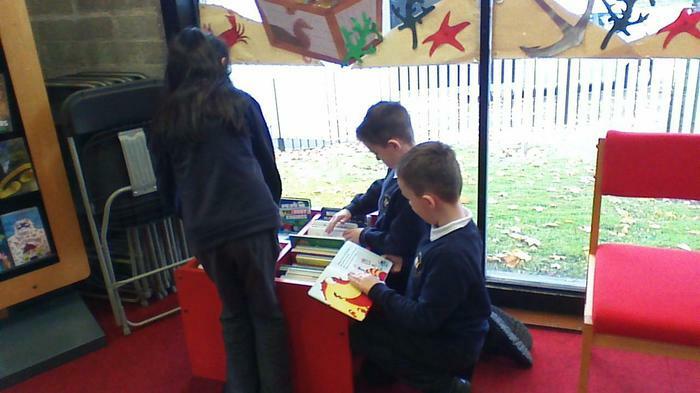 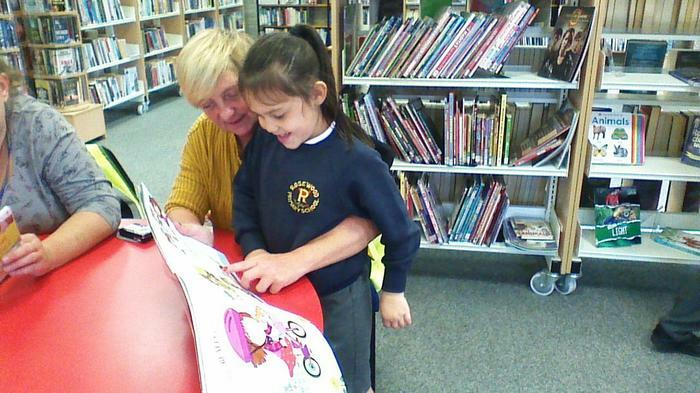 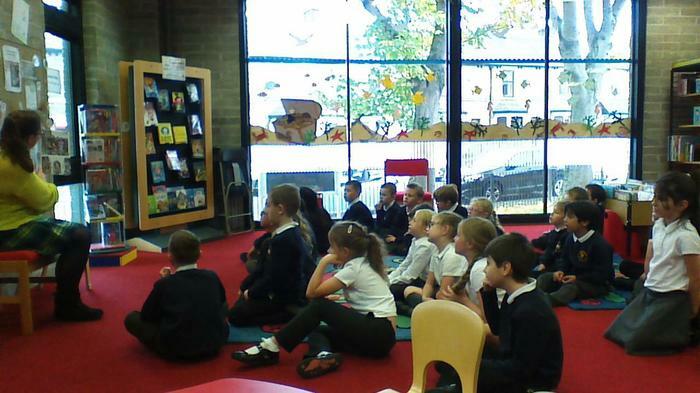 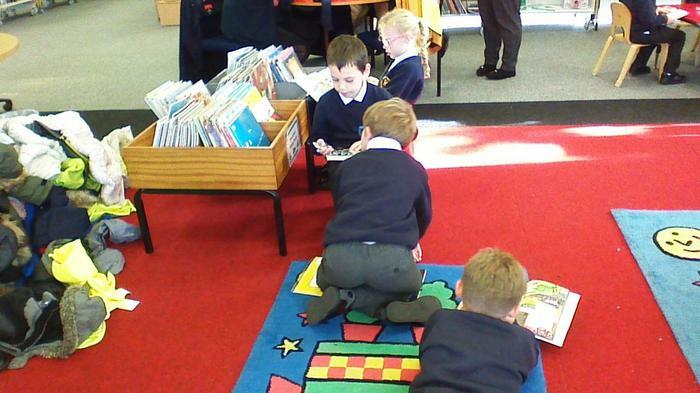 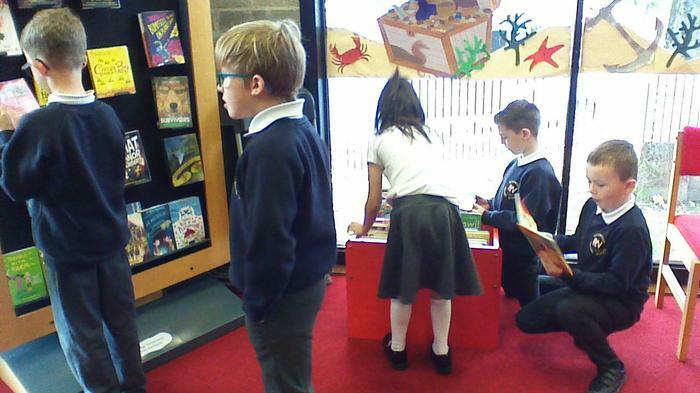 On Monday, Year 3 visited Coal Clough library and took part in a storytelling workshop. 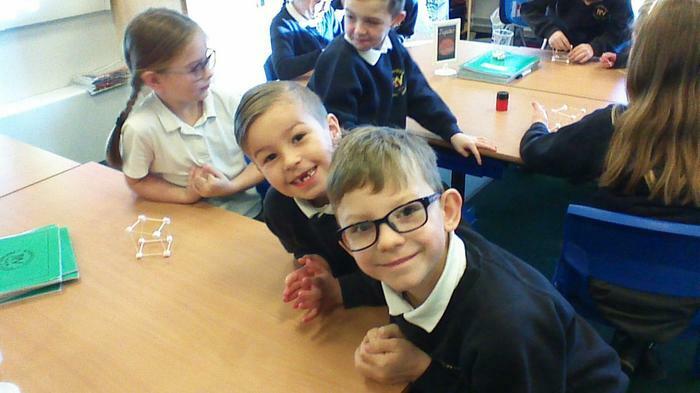 We enjoyed listening to a chapter from George's Marvellous Medicine and predicting what happens in Winnie's New Computer. 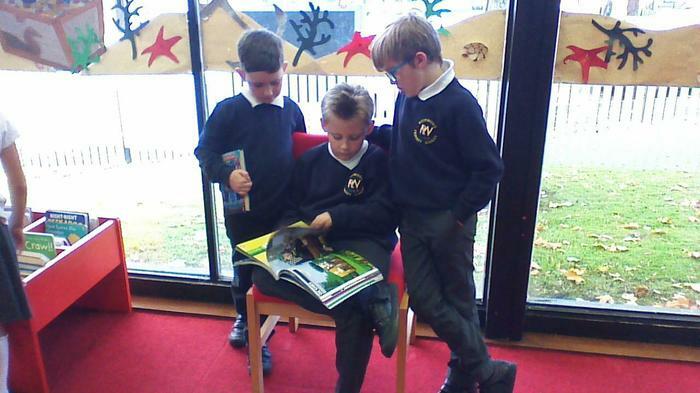 We had a great time browsing through the children's books and found examples of folktales that linked to our English topic. 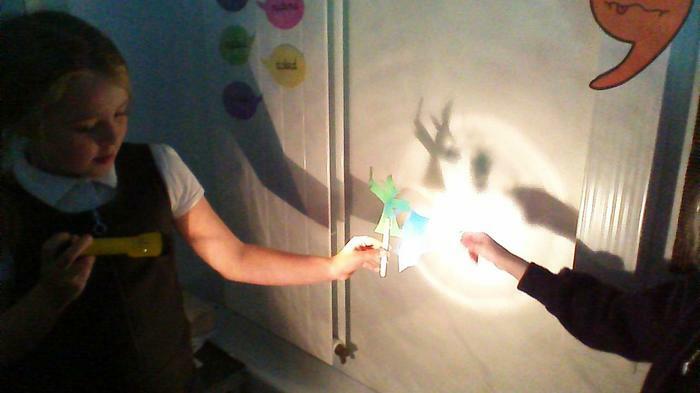 In Science we are learning about light. 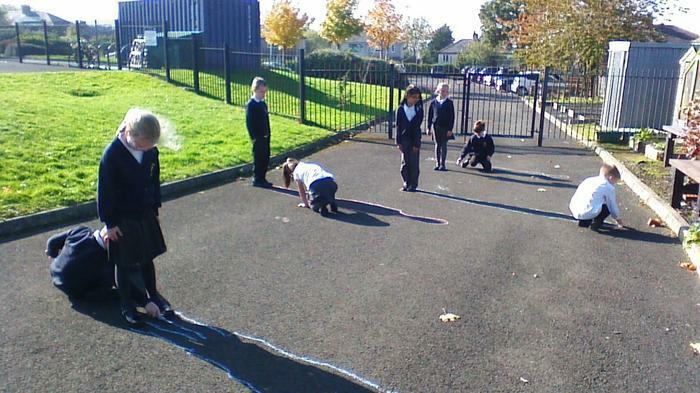 Fortunately, the sun was out so we took our learning outdoors and had a great time observing and tracing our shadows. 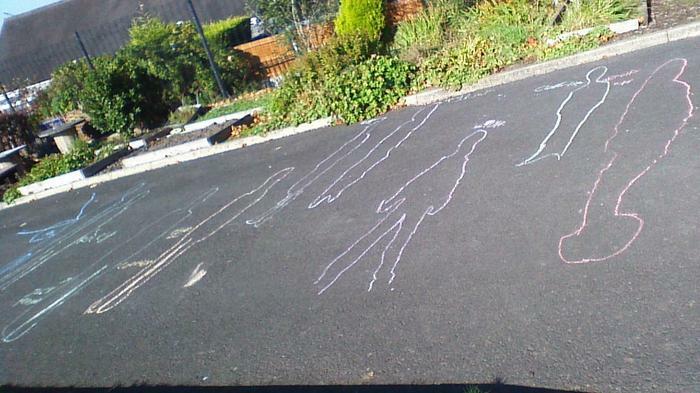 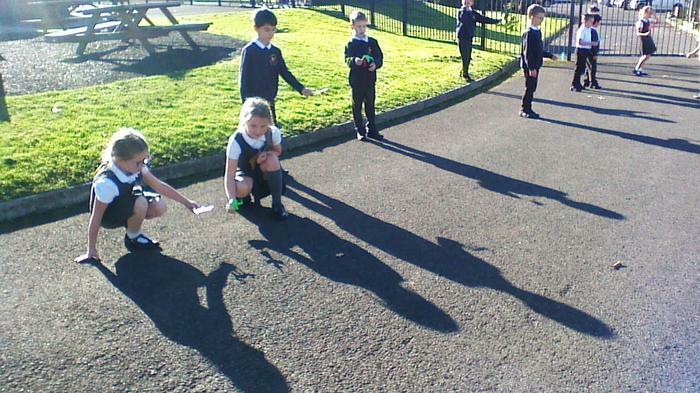 We learnt that our shadows formed on the ground because the light from the sun was blocked by our bodies which are solid. 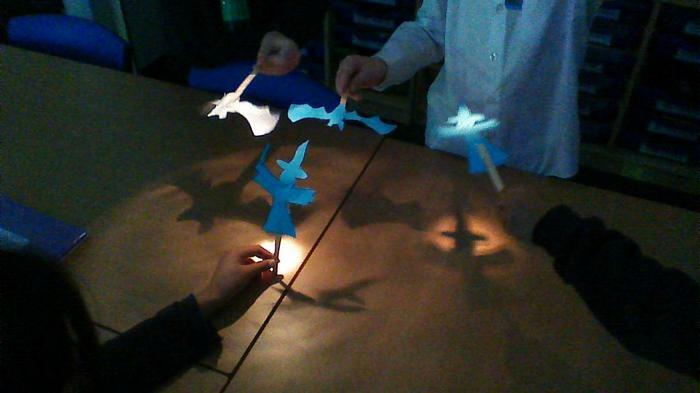 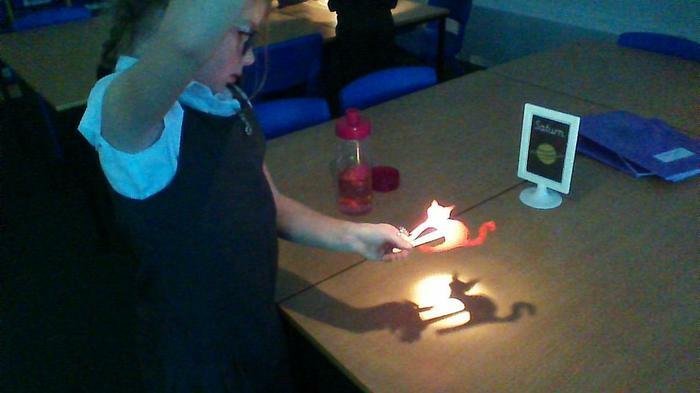 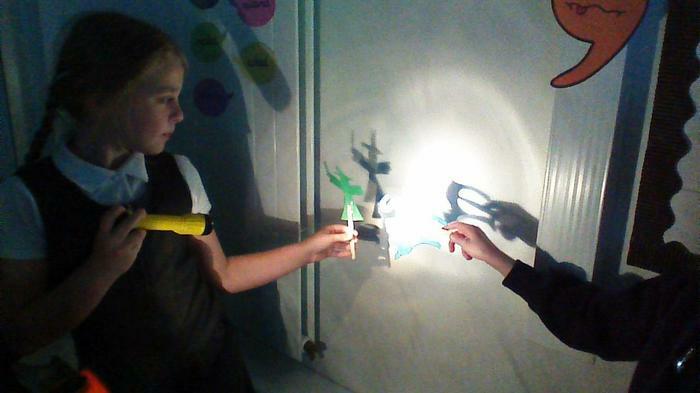 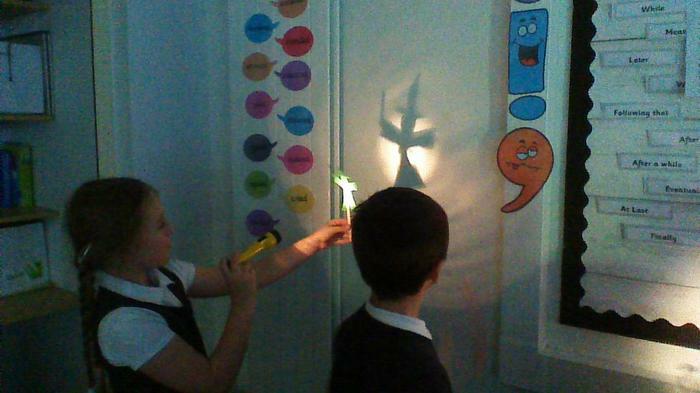 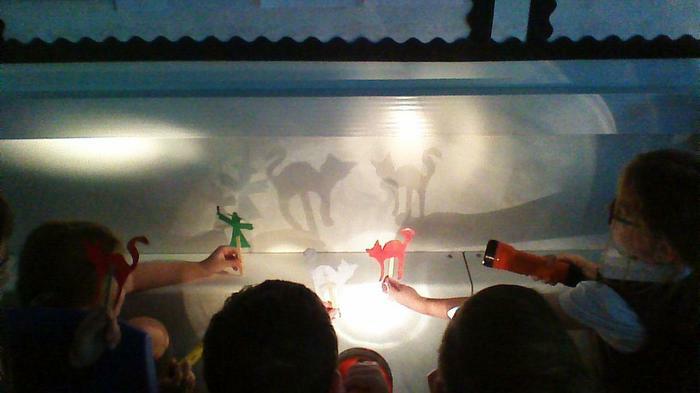 We also created Halloween puppets whilst exploring how shadows change size. 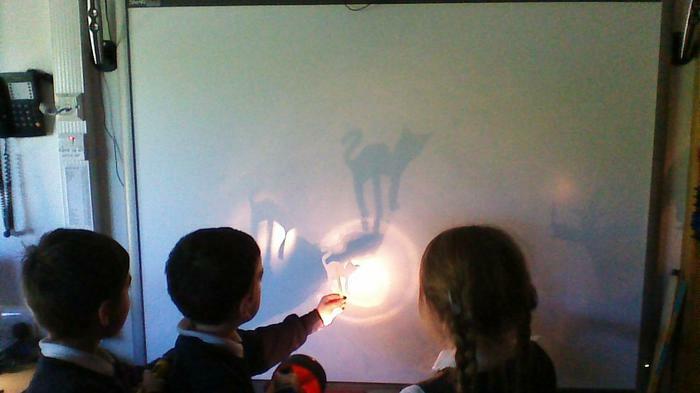 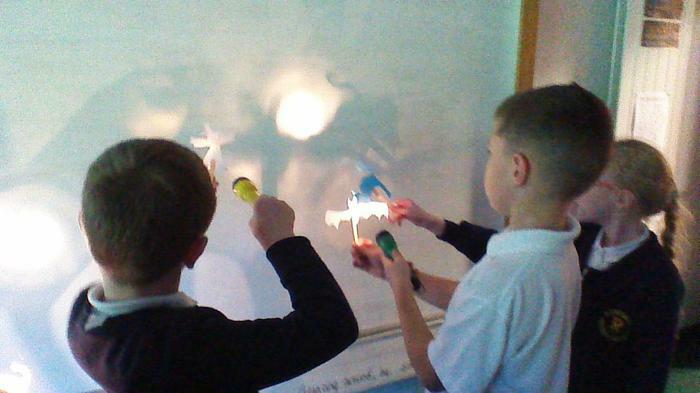 We found that a larger shadow is formed when an object is closer to the light source. 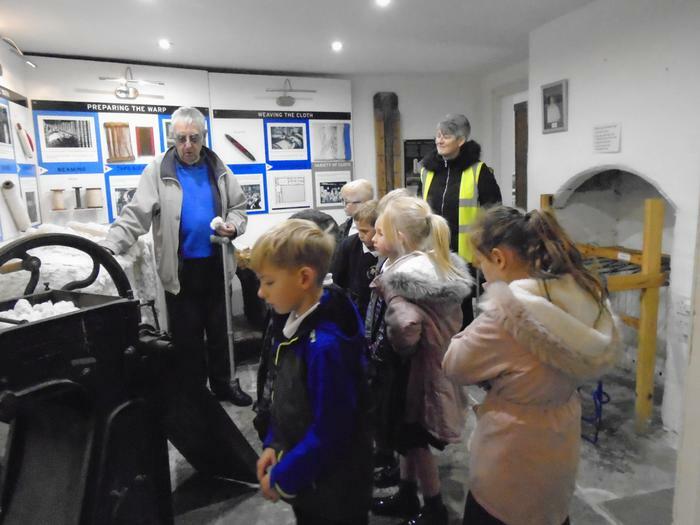 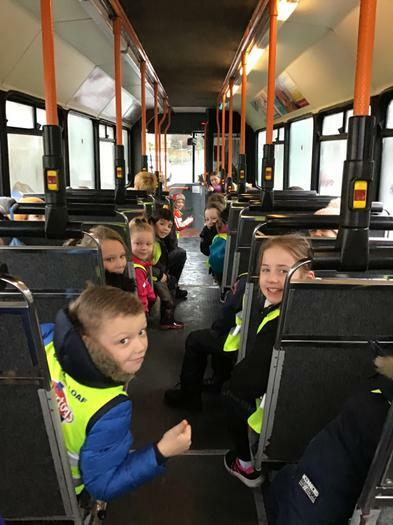 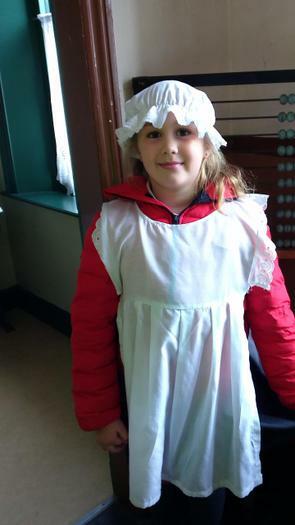 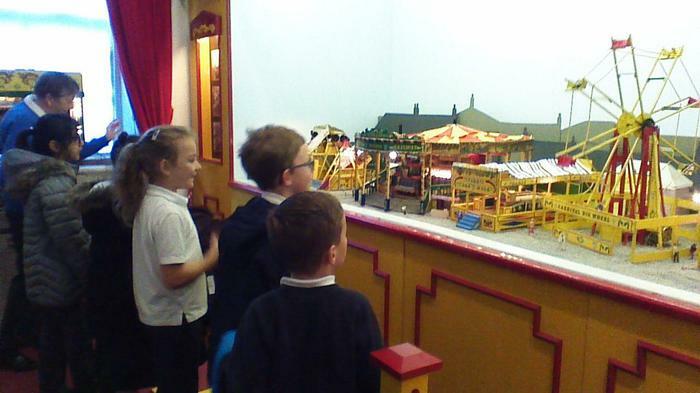 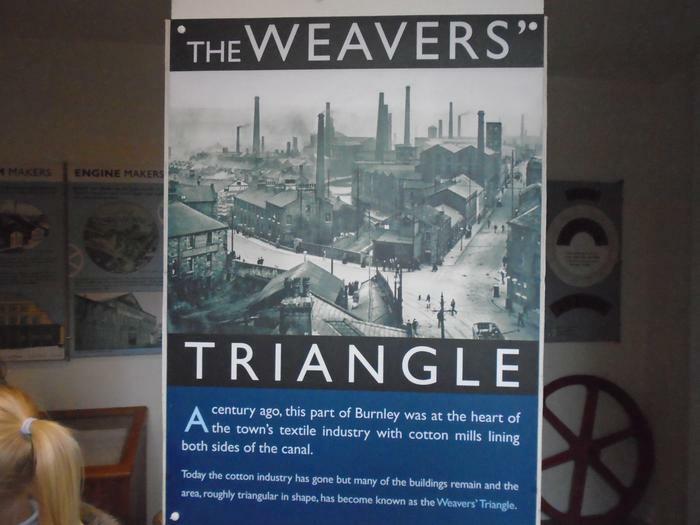 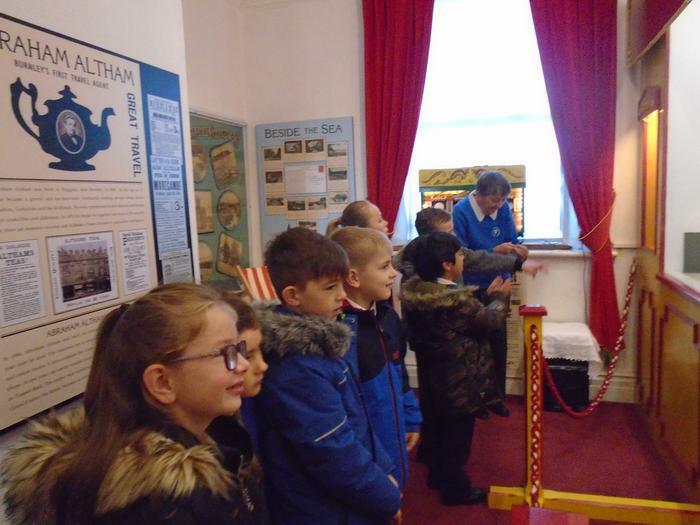 On Monday, Year 3 visited The Weavers’ Triangle where we learnt about the cotton industry in Burnley during the 19th Century. 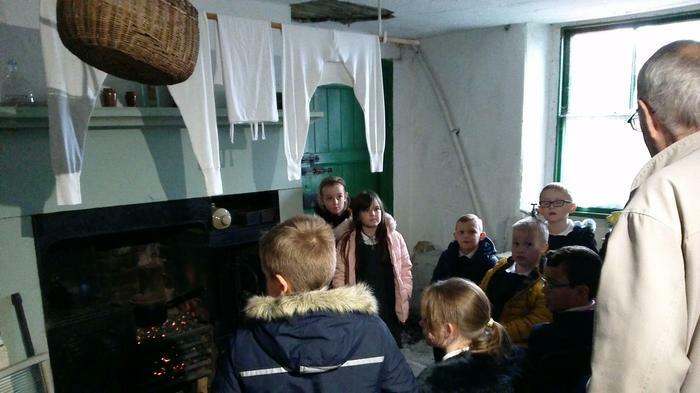 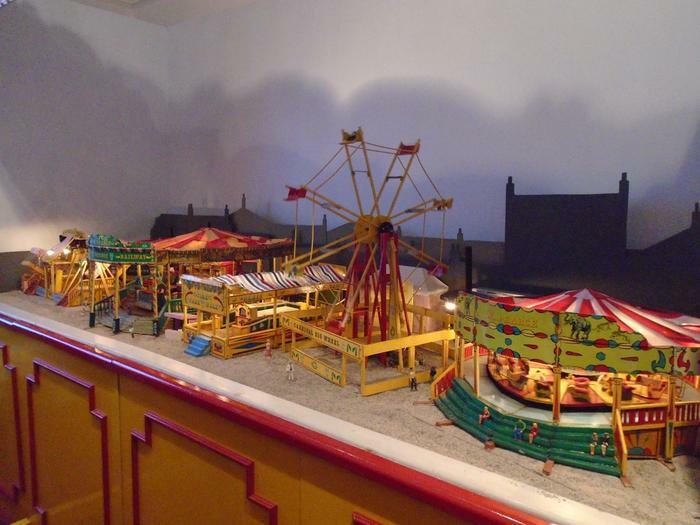 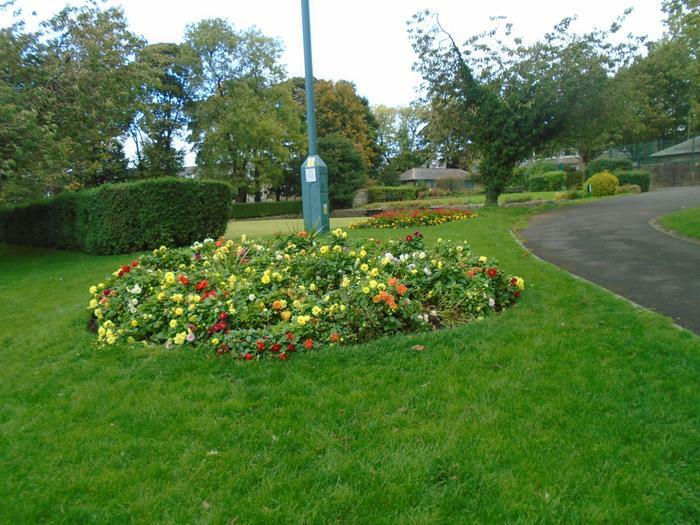 In 1886, Burnley was producing more cotton than any other town in the world. 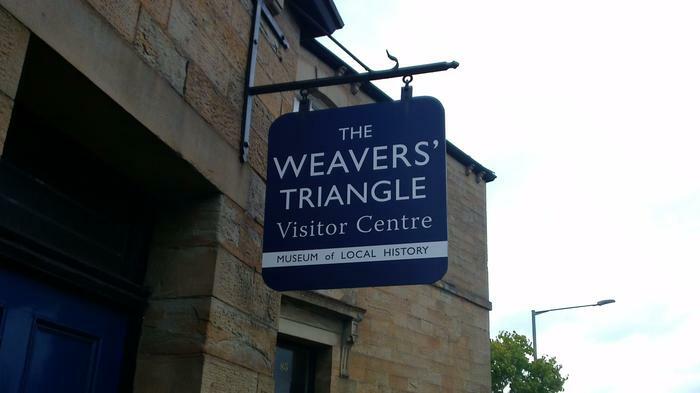 During our visit to The Weaver’s Triangle, we discovered how cotton is made from a plant and turned into a cloth. 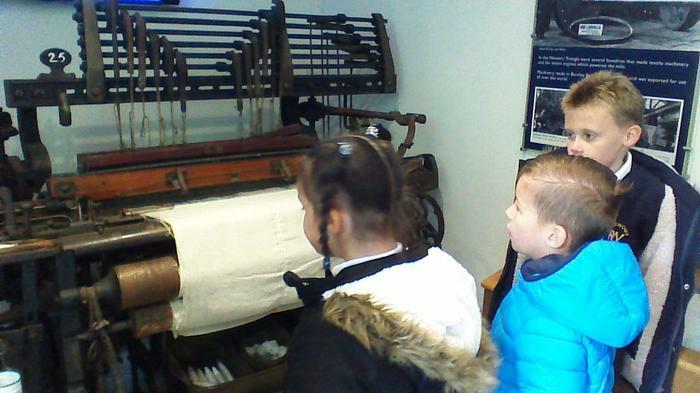 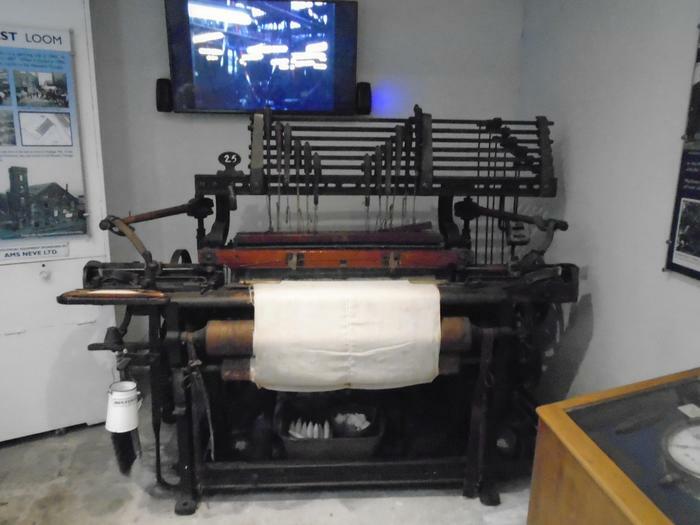 We saw fascinating objects from the mills in Burnley including a kissing shuttle and a cotton loom. 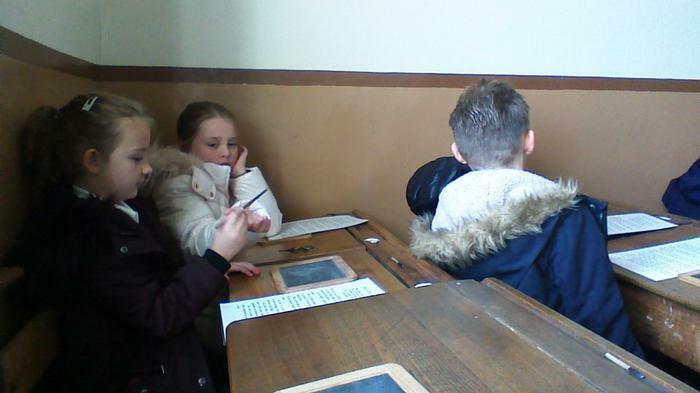 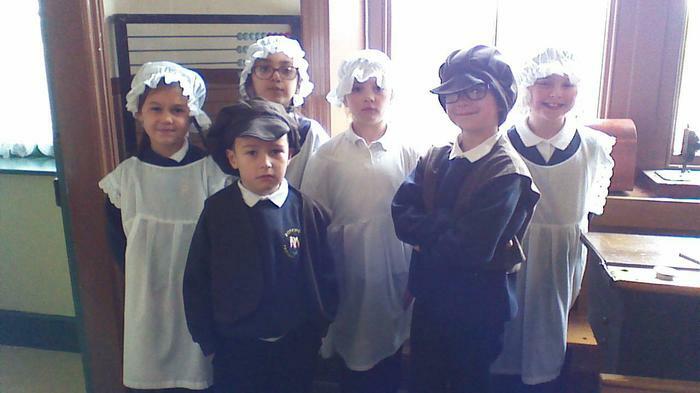 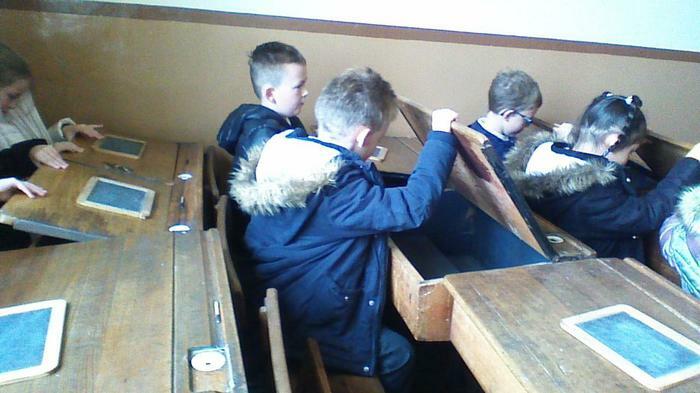 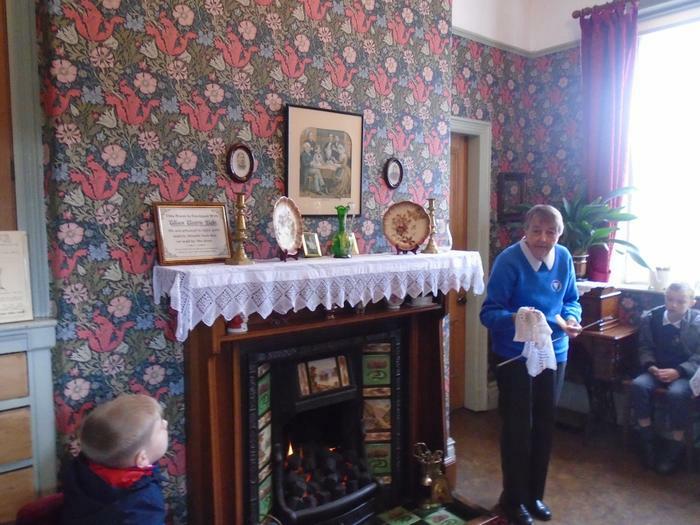 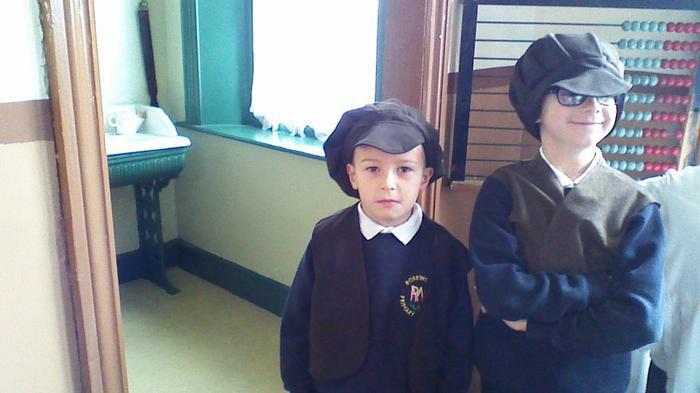 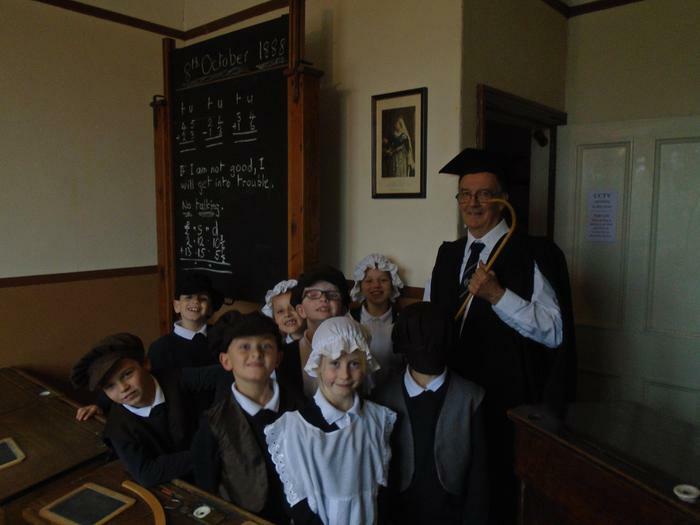 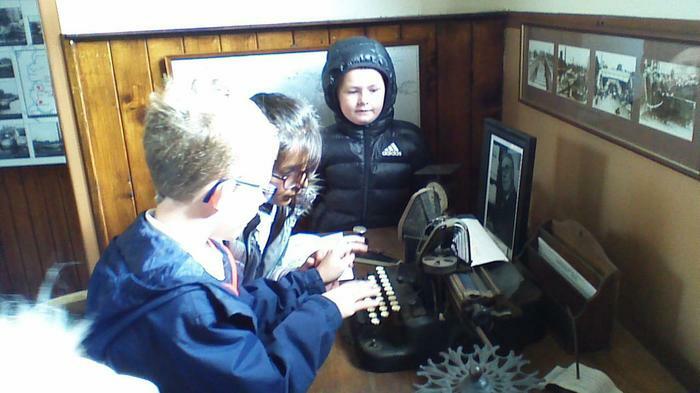 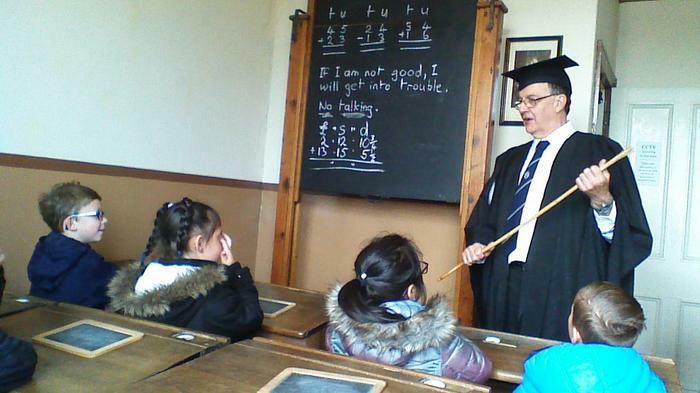 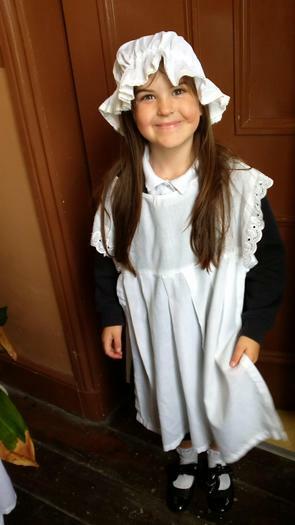 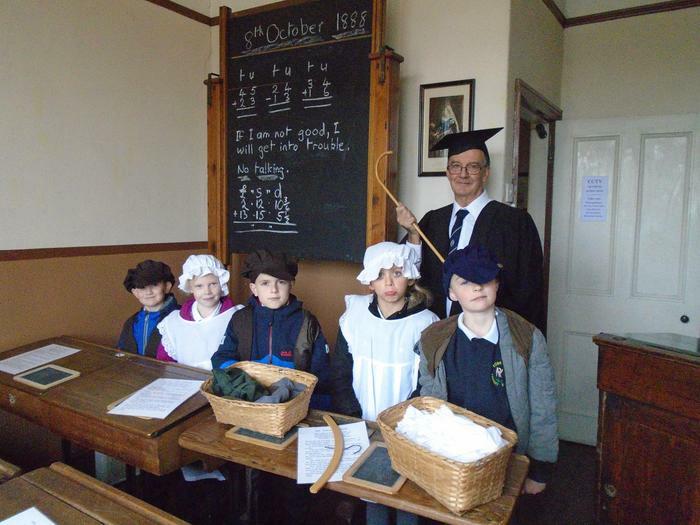 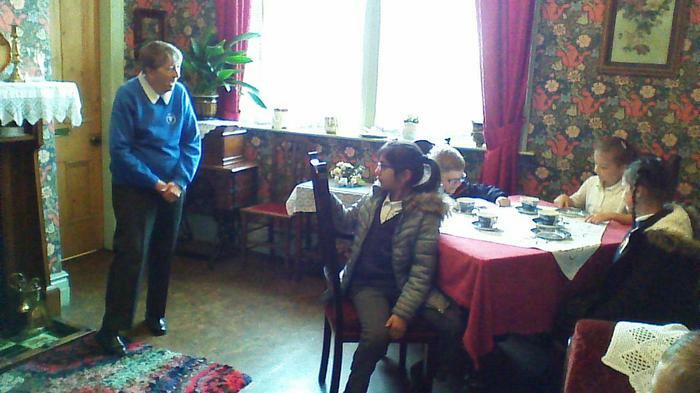 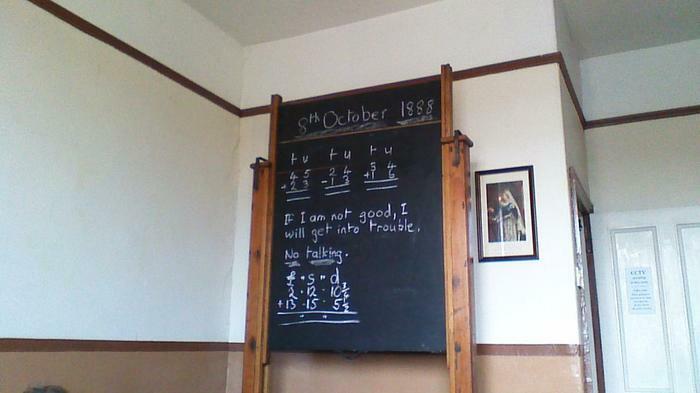 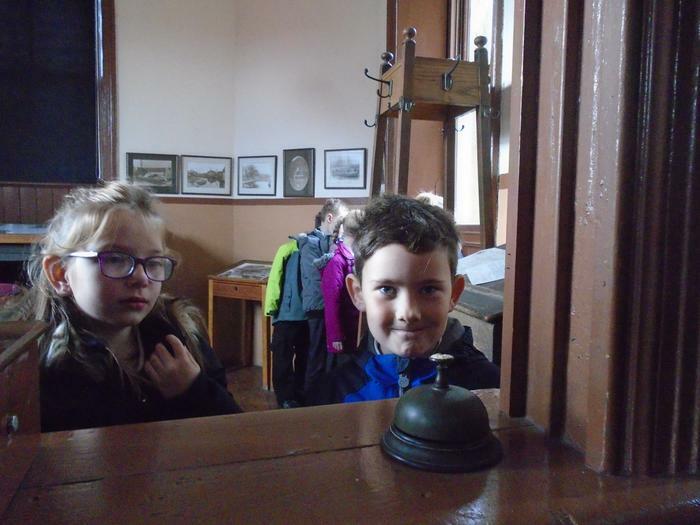 We experienced what life was like for Victorian children at school and explored what life was like inside a Victorian home. 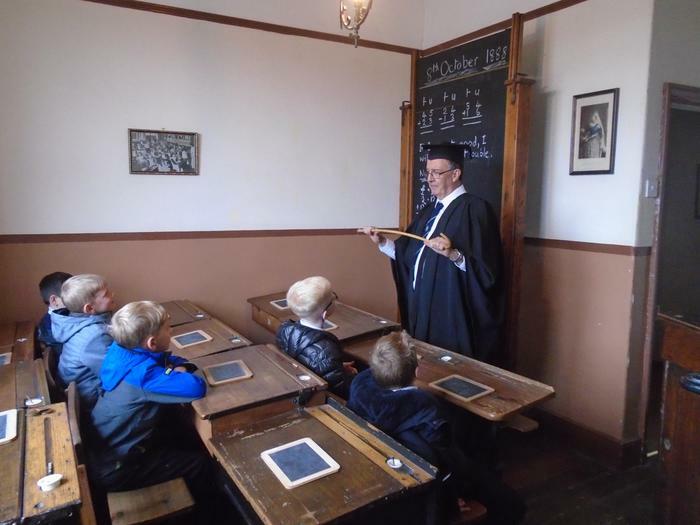 In the evenings, girls would learn to sew whilst boys often went to night school to learn the mechanics of the cotton looms. 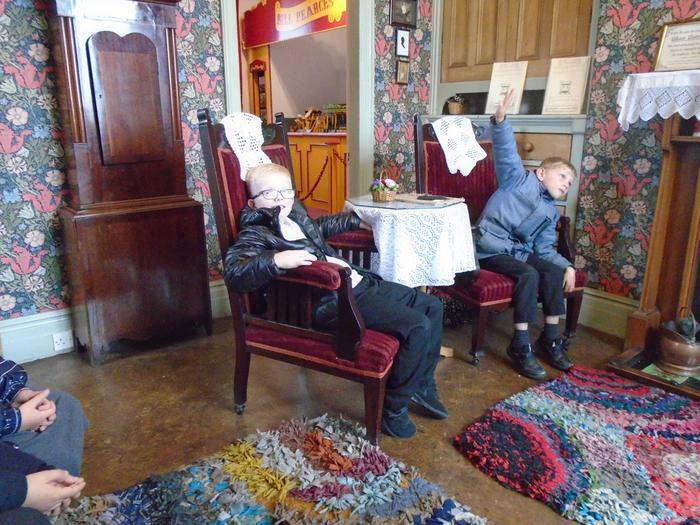 Unfortunately, they didn't have televisions or an Xbox. 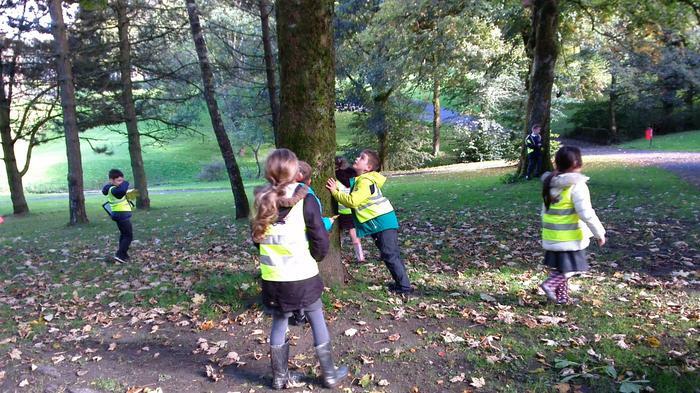 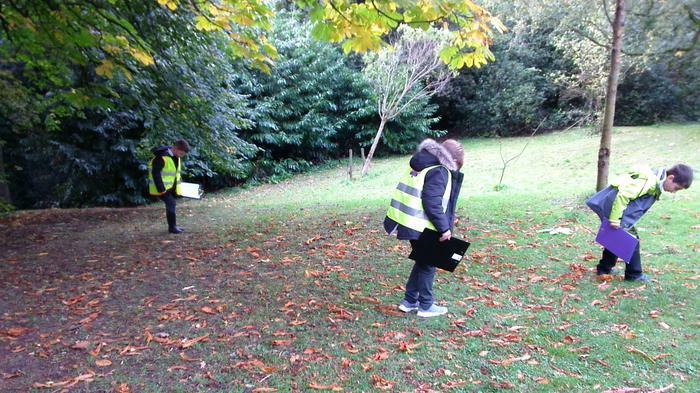 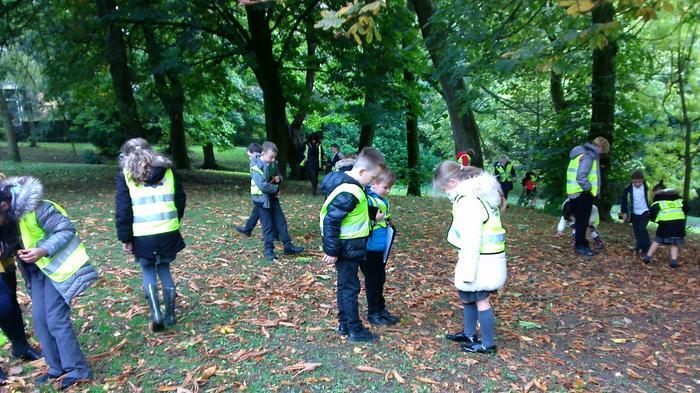 We went on a field trip to Scott Park to observe and record human and physical features in the local area. 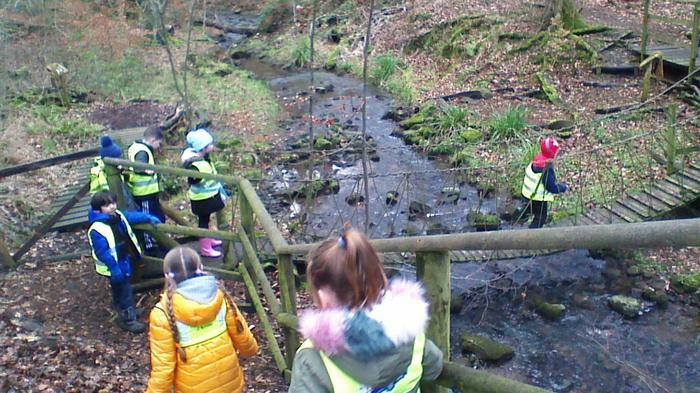 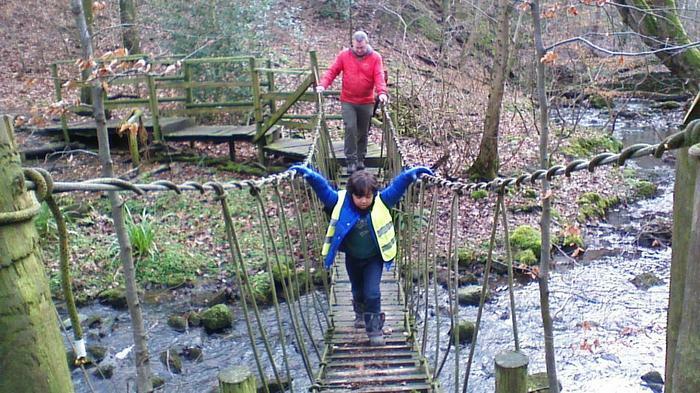 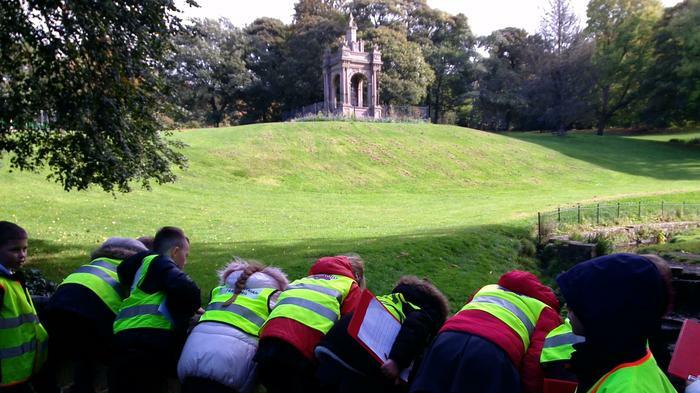 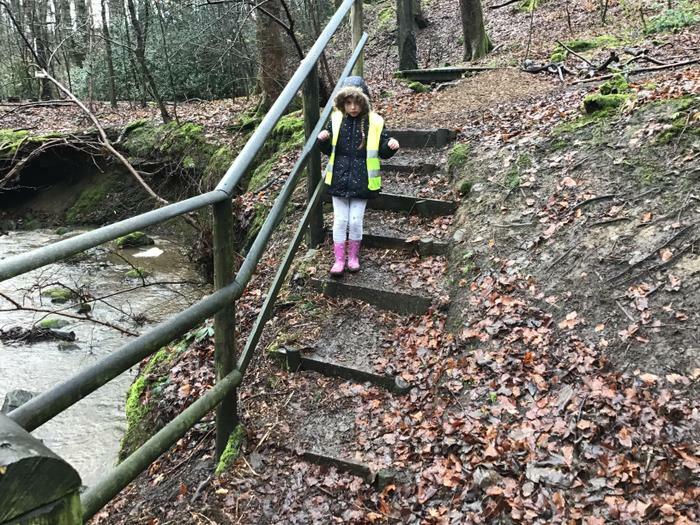 During our walk, we noticed Pendle Hill, monuments and a small stream. 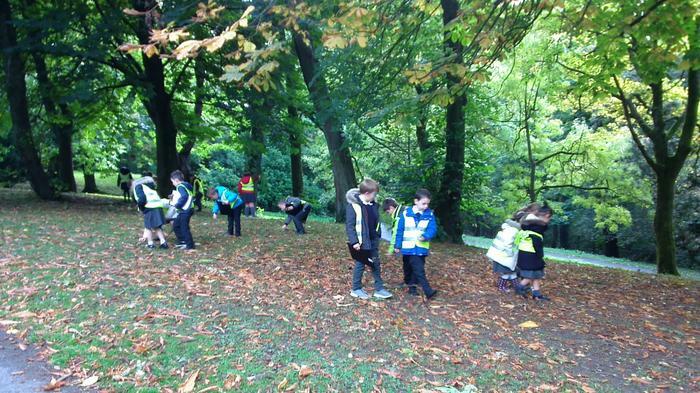 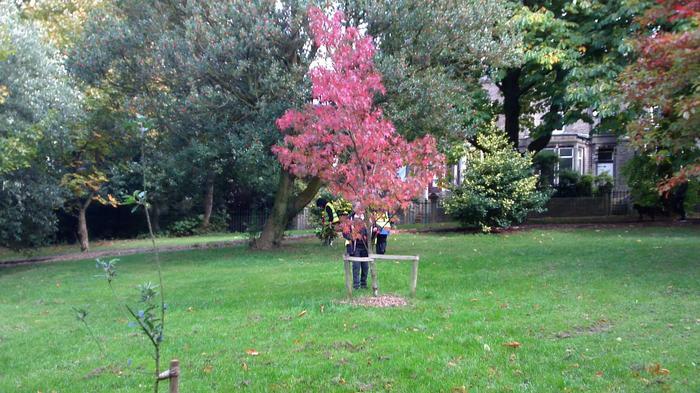 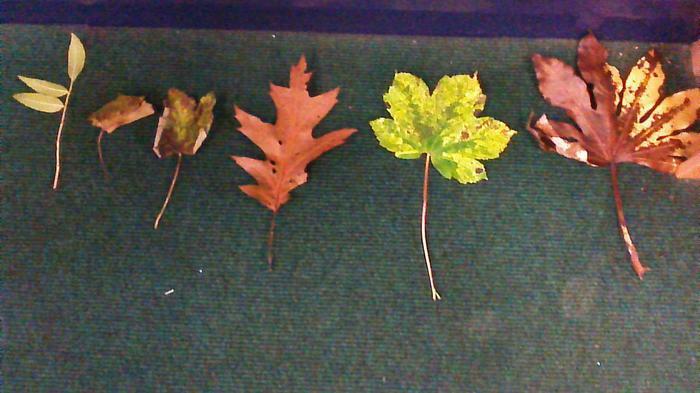 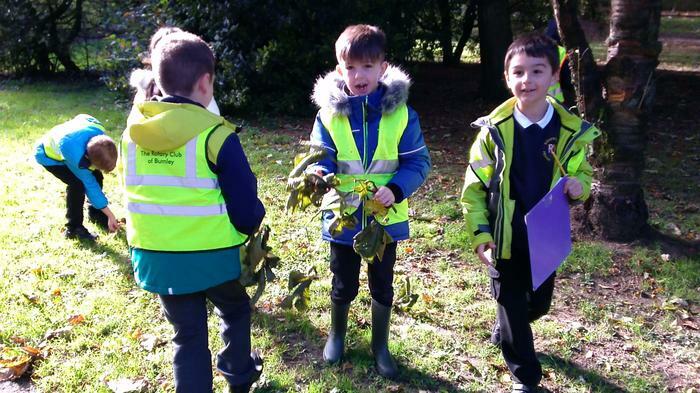 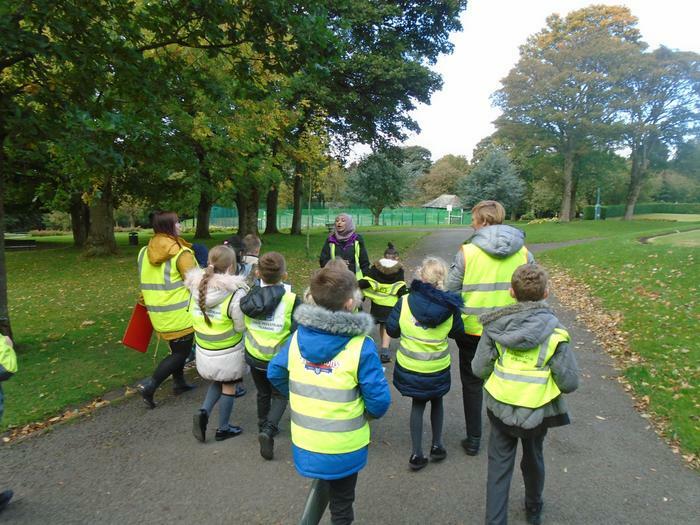 Before returning to school, we collected different coloured leaves and conkers. 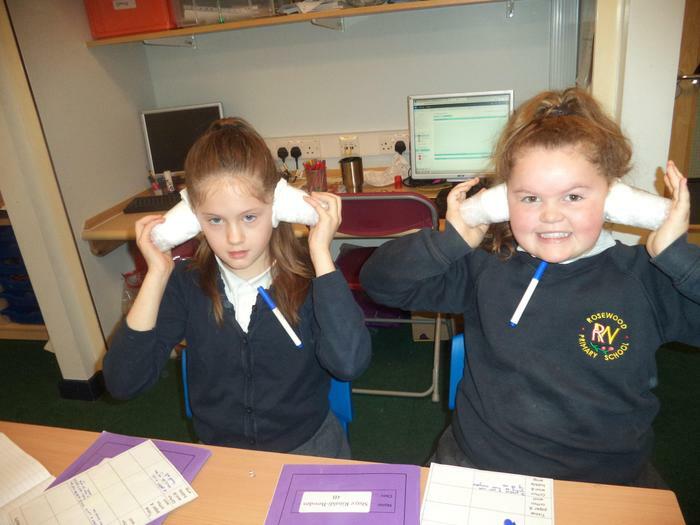 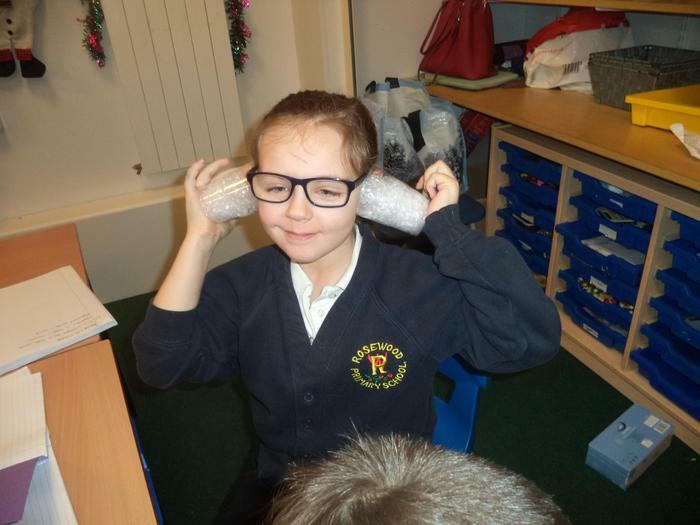 As part of our science topic, Year 4 investigated the different materials that can be used to muffle sound and which was the best material to use. 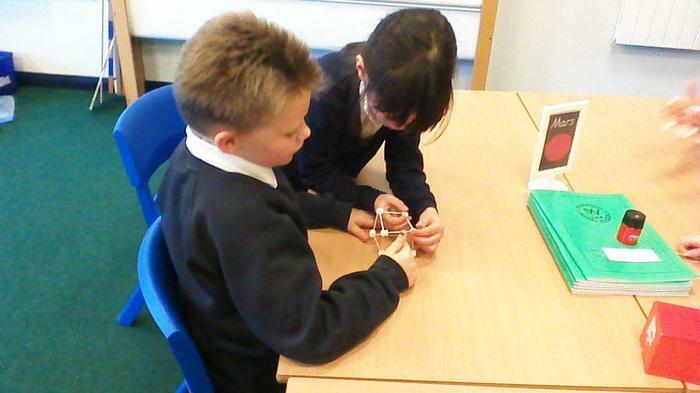 In Year 4, we have been building sculptures from clay. 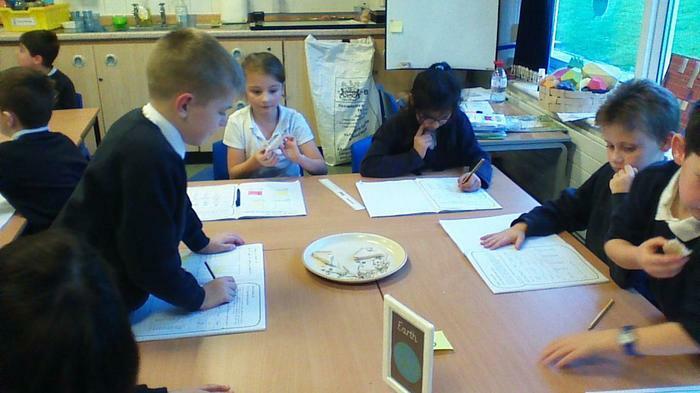 We looked at the different ways to join clay before designing our own sculpture. 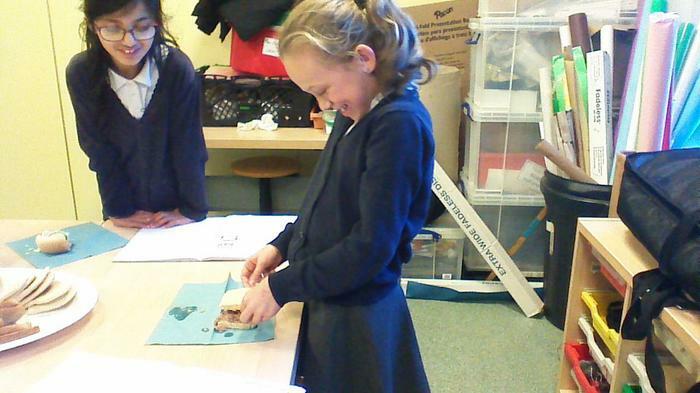 4B decided to create fish showcasing their knowledge of teeth. 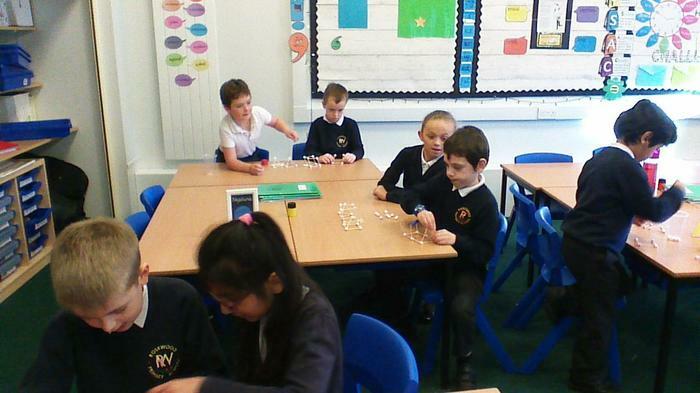 4C created a tile with a special symbol relating to their own life. 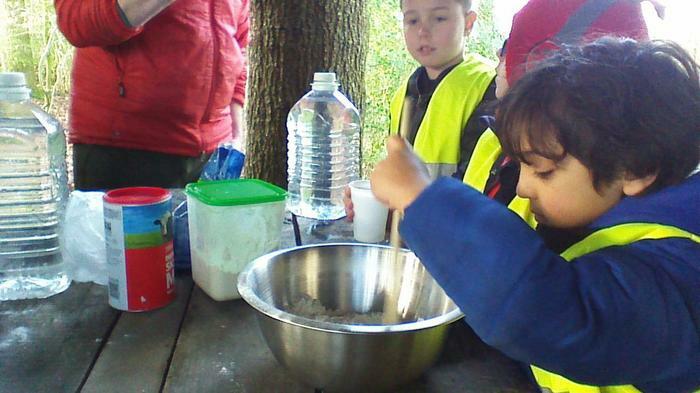 Some children thought about hobbies while others thought about religion or family members.